Dr Bashir ahmed dar associate professor medicine chinkipora sopore kashmir presently working in medical college malaysia describes rheumatoid arthritis which is a autoimmune disorder in which Immune system identifies the synovial membrane as "foreign" and begins attacking it. 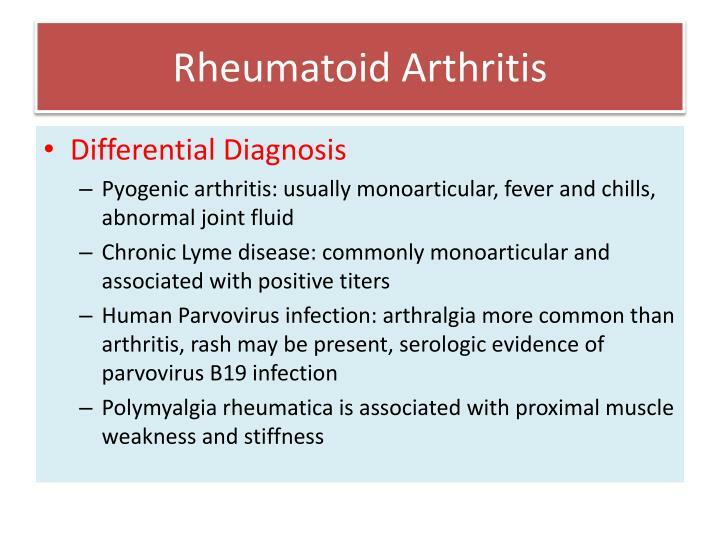 Rheumatoid arthritis isautoimmune disorder in which Immune system identifies the synovial membrane as "foreign" and begins attacking it. 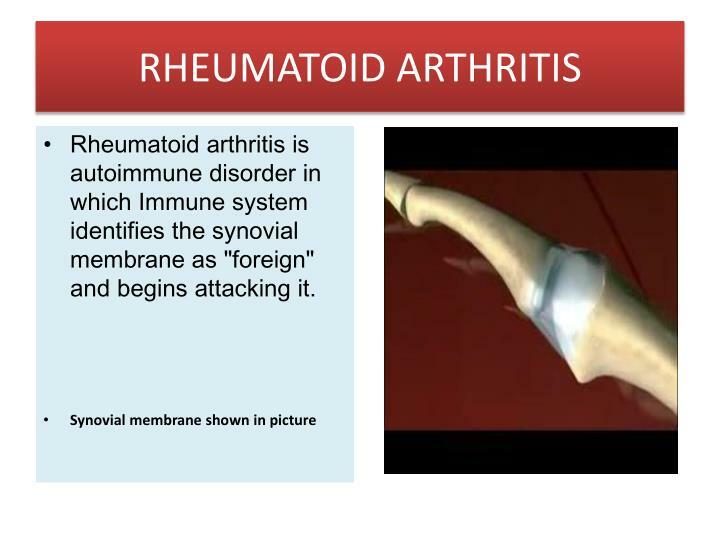 With long-term or intensive exposure to the antigen, normal antibodies become auto-antibodies that target self-antigens in the synovial membrane. 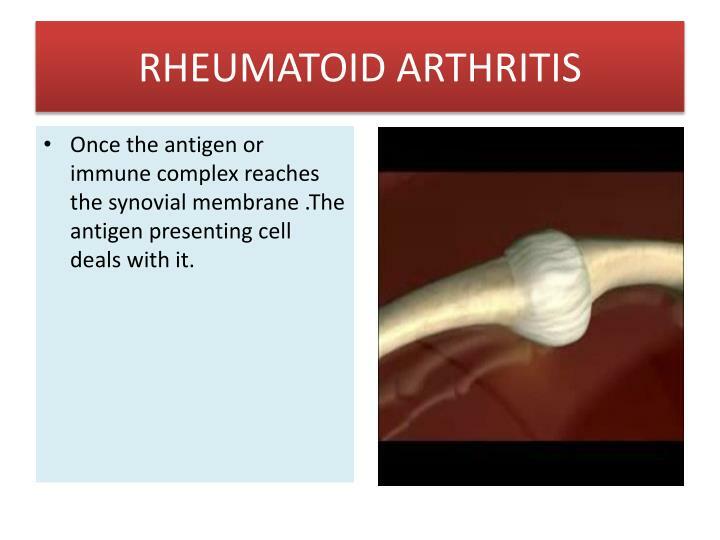 Once the antigen or immune complex reaches the synovial membrane .The antigen presenting cell deals with it. First, the APC usually a macrophage in synovium engulfs the antigen. Enzymes (peroxides) inside the APC break down the antigen into smaller particles. 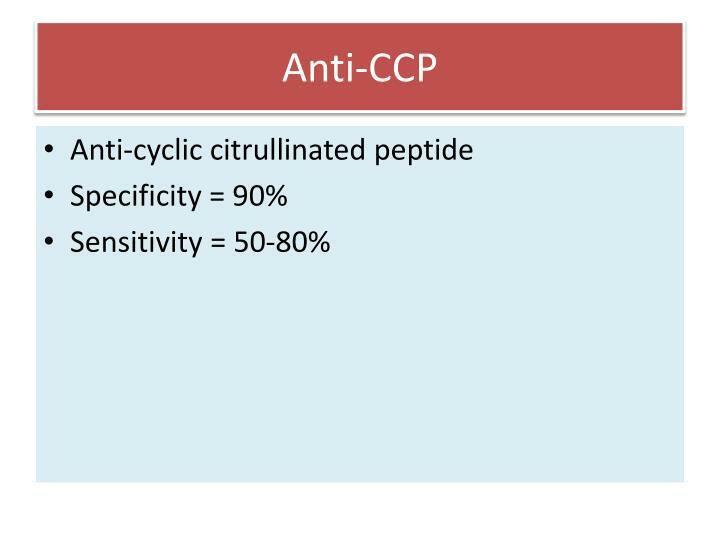 The processed antigens are transported to the surface of the APC, where it binds with MHC (major histocompatibility complex). This complex ie (part of a foreign substance and MHC) is now presented to T-cells (CD4 cells ie T-helper cell ) or CD8 (cytotoxic T cells) which the T-cell receptor (TCR) recognizes and binds to. 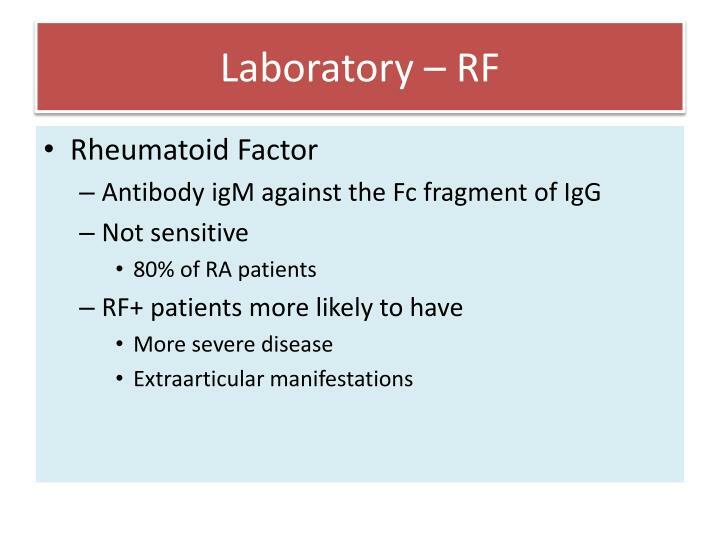 And other factors that activate lymphocytes and other immune cells to respond to the antigens. 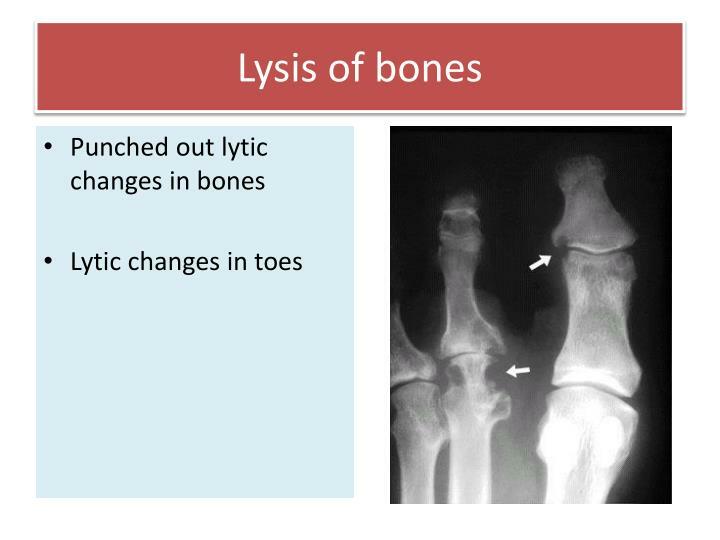 Lysozymes, Elastases and Collagenases these enzymes cause cartilage breakdown. 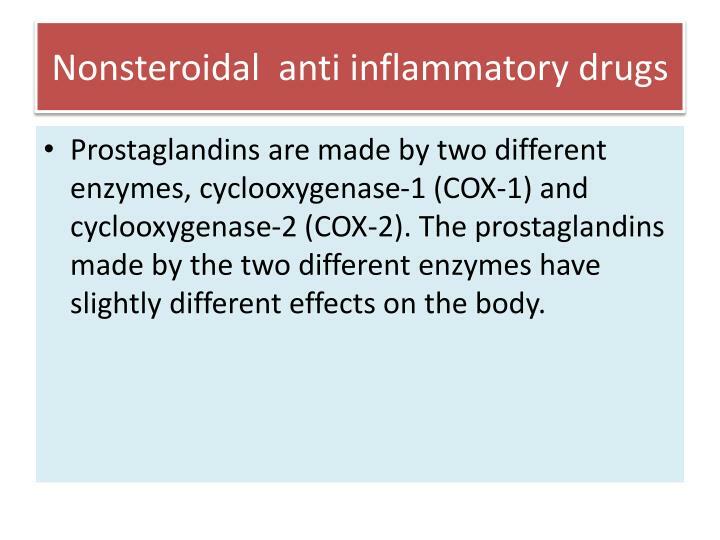 Prostaglandin's (e.g. 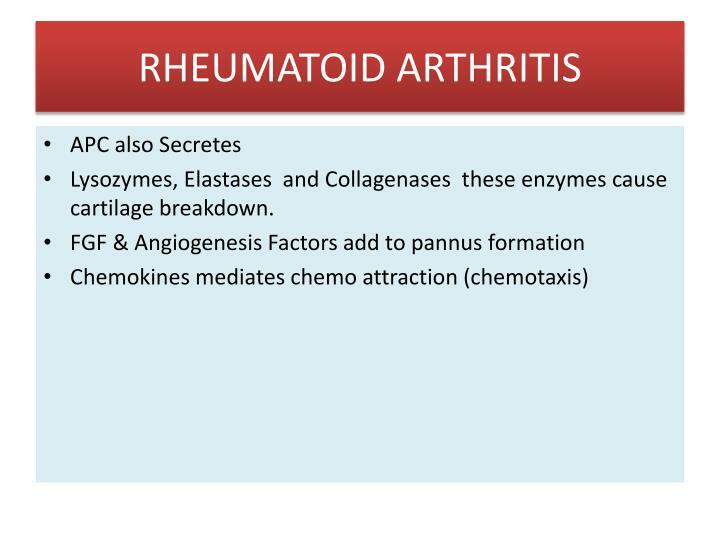 , PGE2) , and platelet-activating factor, which are involved in the pain mechanism. Matrix Metalloproteases(e.g. 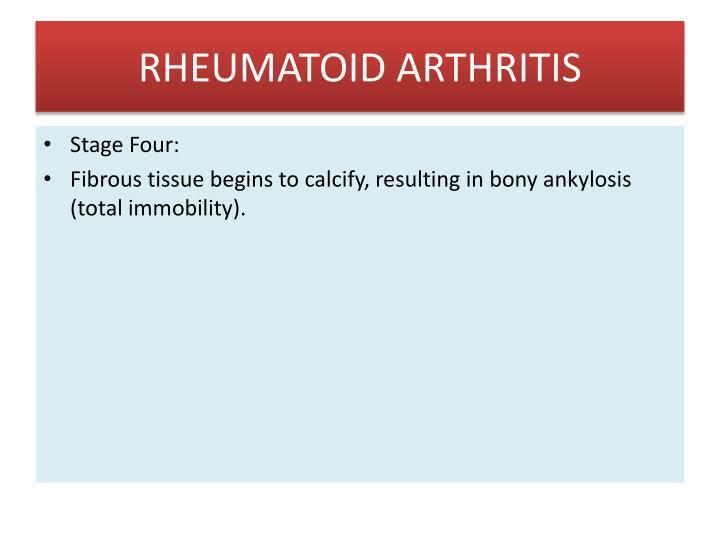 stromelysin) that cause activation of collagenase, an enzyme required for cartilage breakdown. 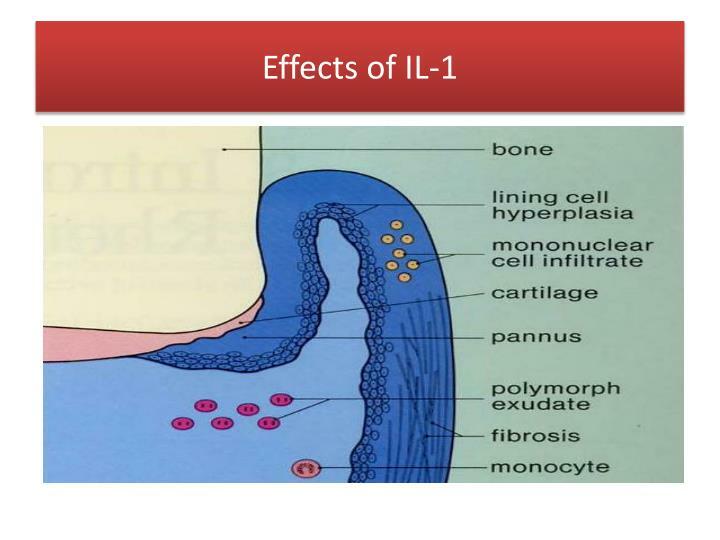 IL-1 also activates endothelial cells and induce stimulation of adhesion molecule expression on endothelial cells. 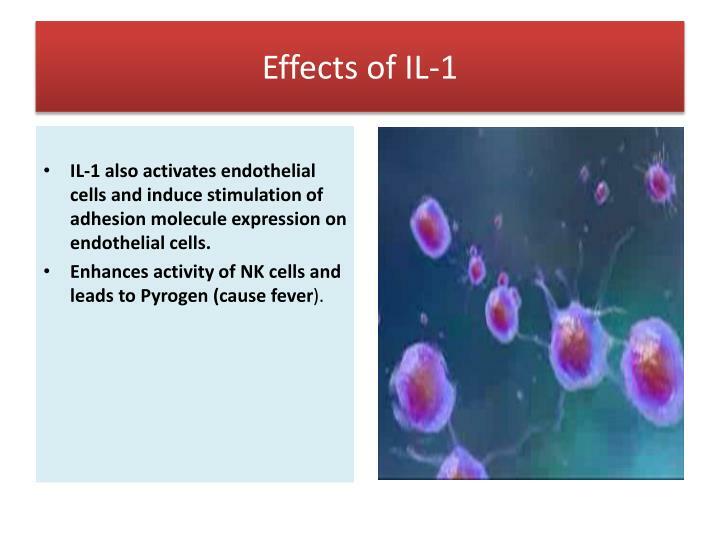 Enhances activity of NK cells and leads to Pyrogen (cause fever). 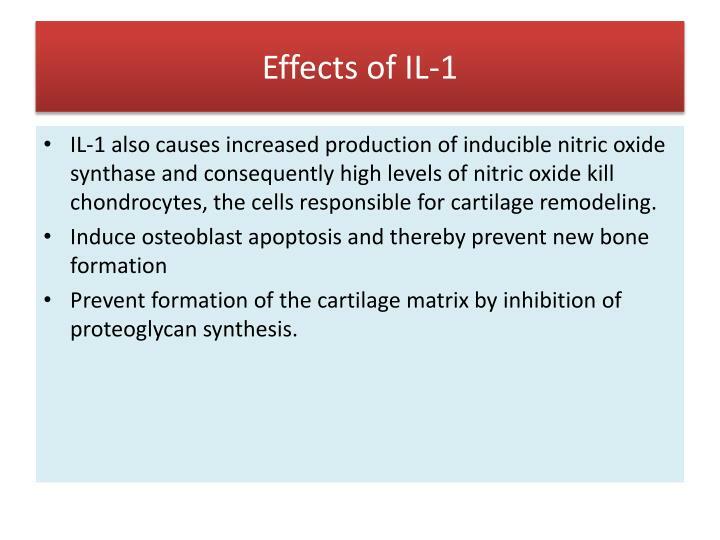 IL-1 also causes increased production of inducible nitric oxide synthase and consequently high levels of nitric oxide kill chondrocytes, the cells responsible for cartilage remodeling. Prevent formation of the cartilage matrix by inhibition of proteoglycan synthesis. 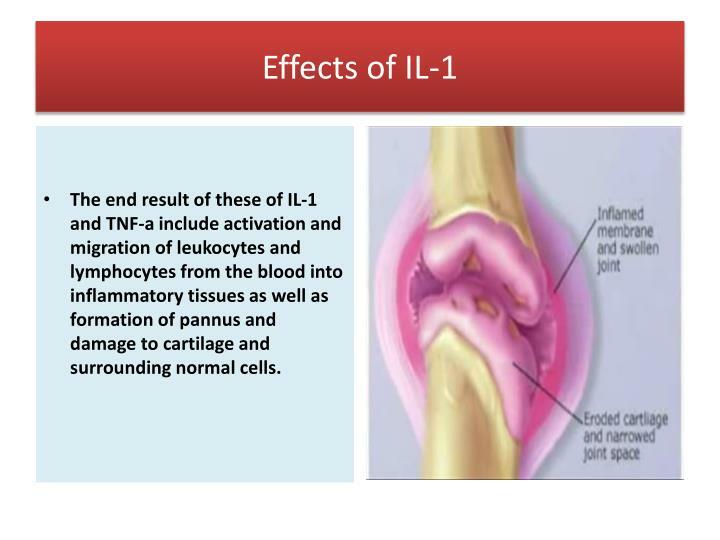 The end result of these of IL-1 and TNF-a include activation and migration of leukocytes and lymphocytes from the blood into inflammatory tissues as well as formation of pannus and damage to cartilage and surrounding normal cells. 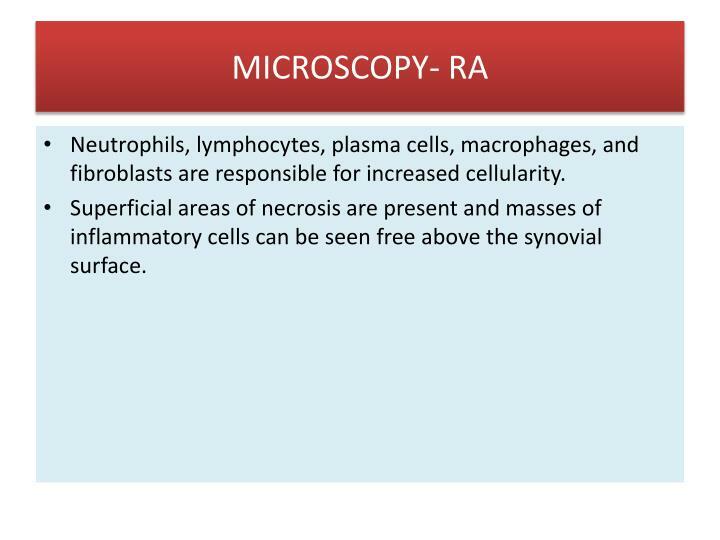 Neutrophils, lymphocytes, plasma cells, macrophages, and fibroblasts are responsible for increased cellularity. Superficial areas of necrosis are present and masses of inflammatory cells can be seen free above the synovial surface. 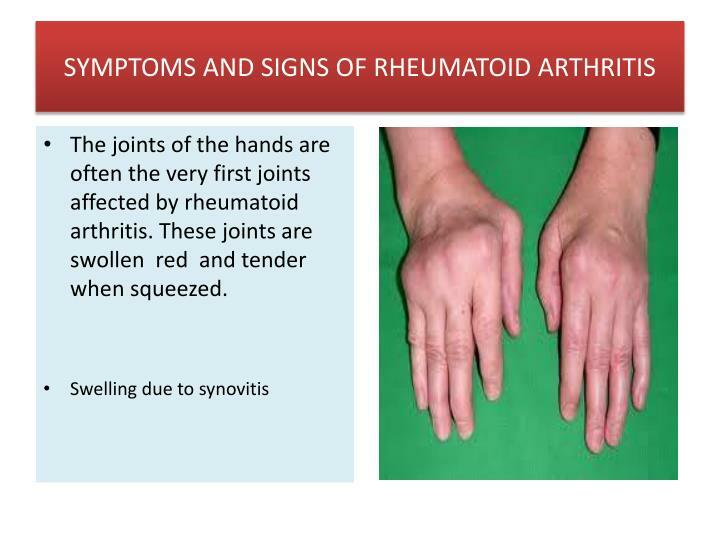 The synovium is red due to blood vessel dilatations and thickened due to inflammation and cellular infiltration. 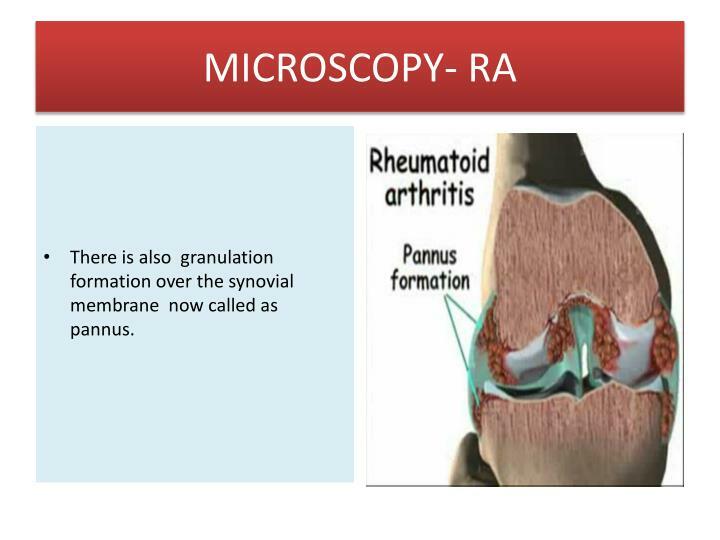 There is also granulation formation over the synovial membrane now called as pannus. 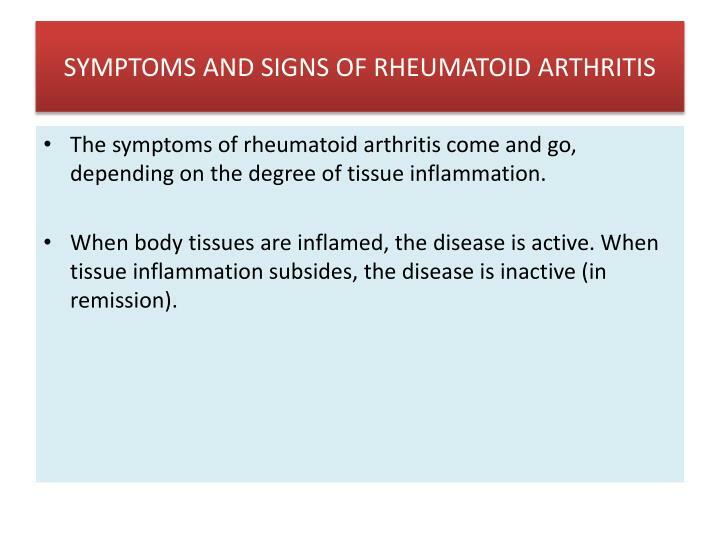 The inflammation can spread to soft tissues as shown in fig and destroy these structure causing laxity and deformity of joint. 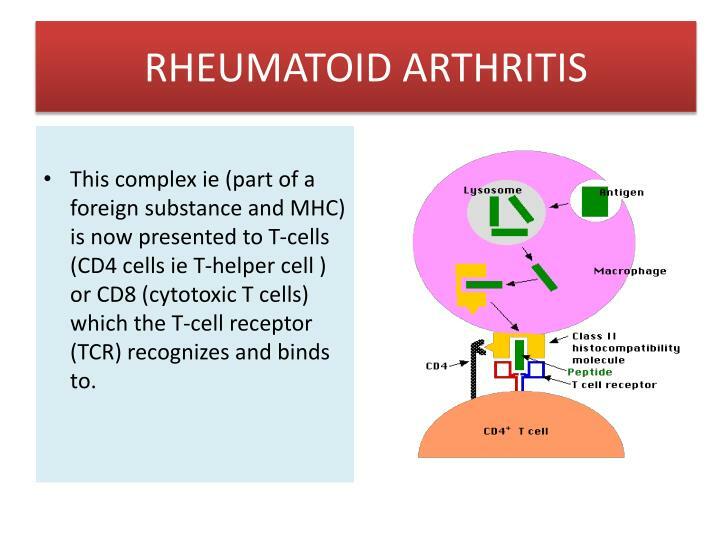 Mast cells are implicated in the pathology of autoimmune disorders like rheumatoid arthritis. 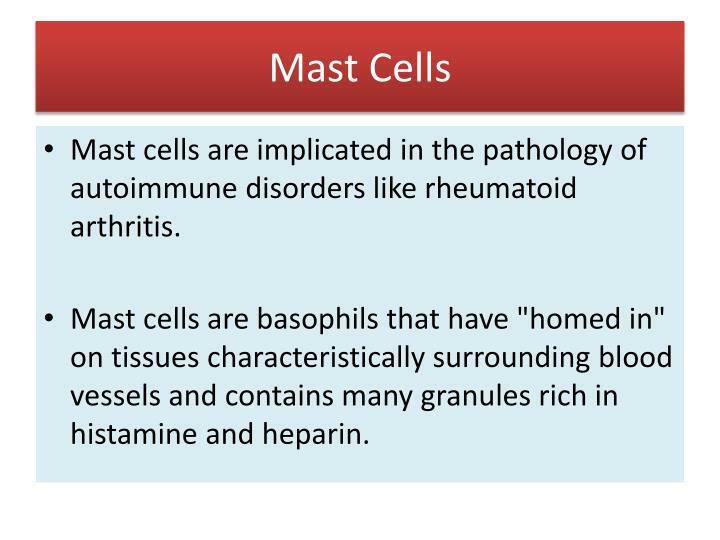 Mast cells are basophils that have "homed in" on tissues characteristically surrounding blood vessels and contains many granules rich in histamine and heparin. 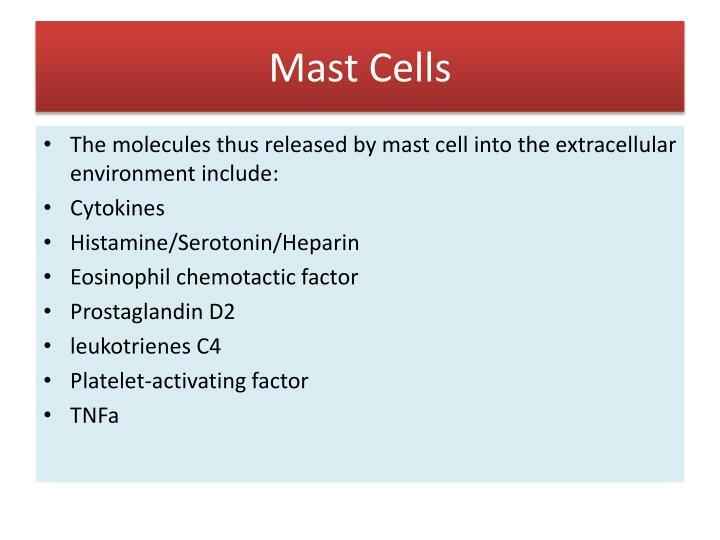 Mast cells has a receptor for the Fc region of IgE. 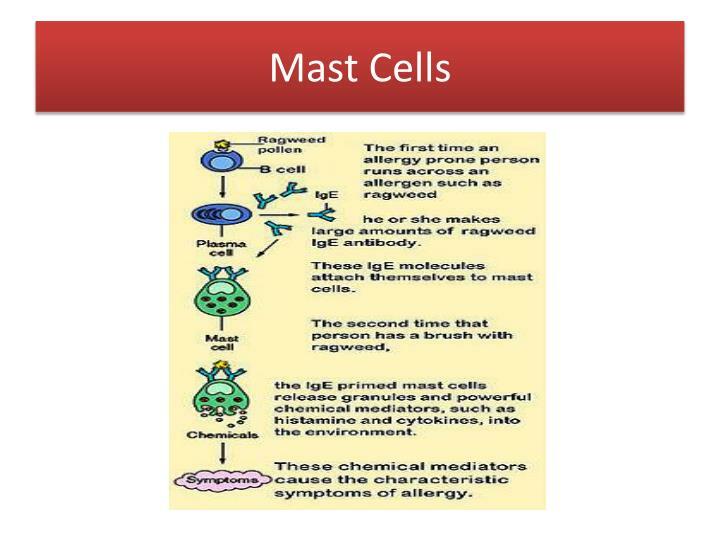 As a result, mast cells are coated with IgE. 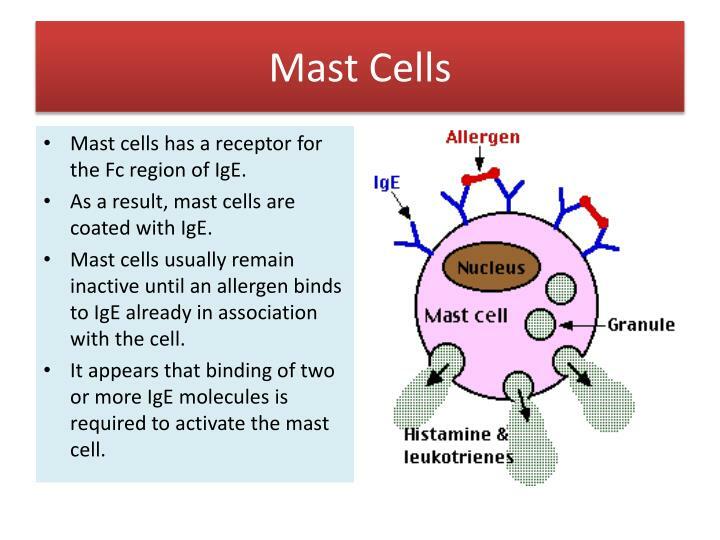 Mast cells usually remain inactive until an allergen binds to IgE already in association with the cell. It appears that binding of two or more IgE molecules is required to activate the mast cell. 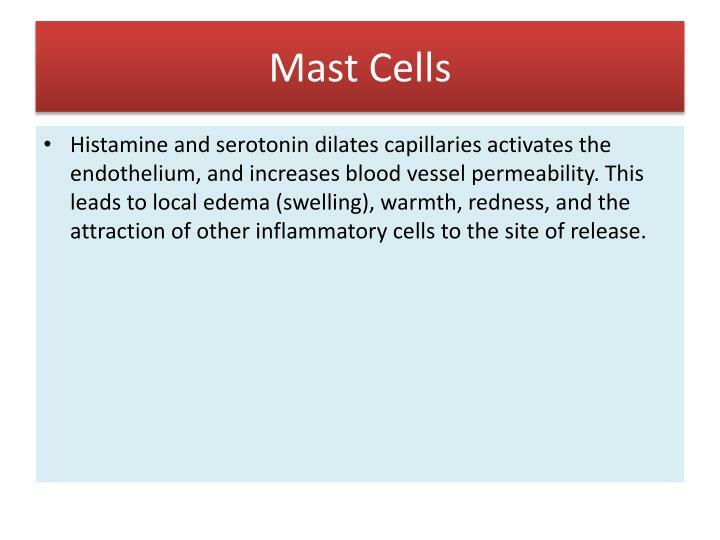 Histamine and serotonin dilates capillaries activates the endothelium, and increases blood vessel permeability. 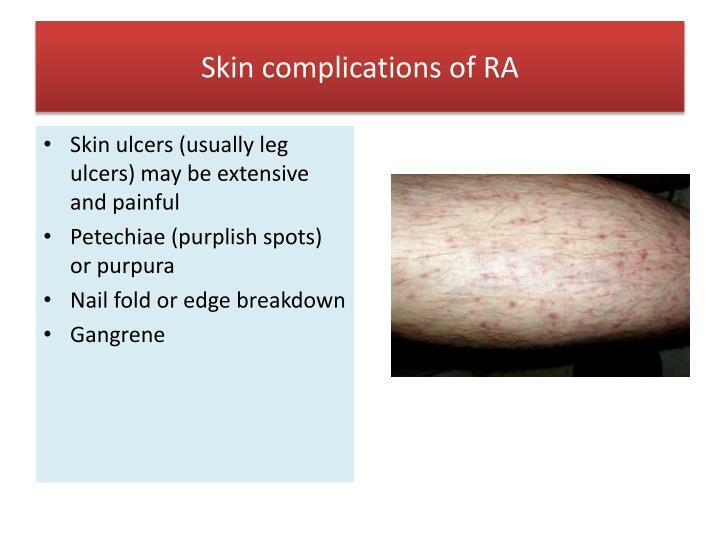 This leads to local edema (swelling), warmth, redness, and the attraction of other inflammatory cells to the site of release. 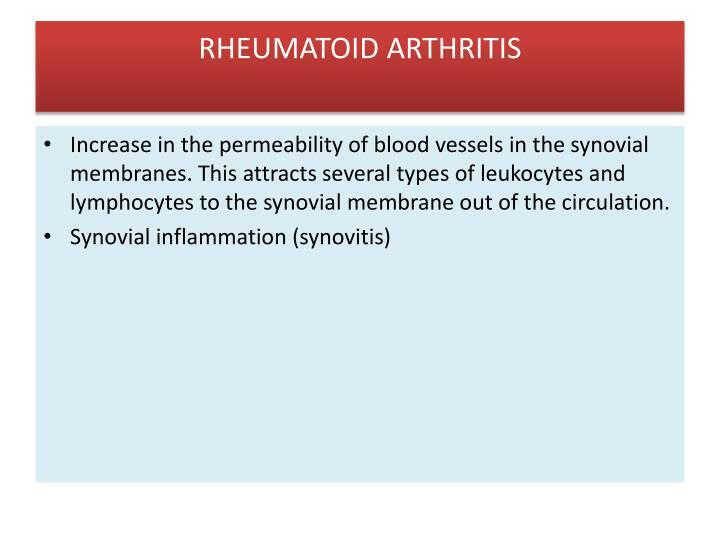 Increase in the permeability of blood vessels in the synovial membranes. 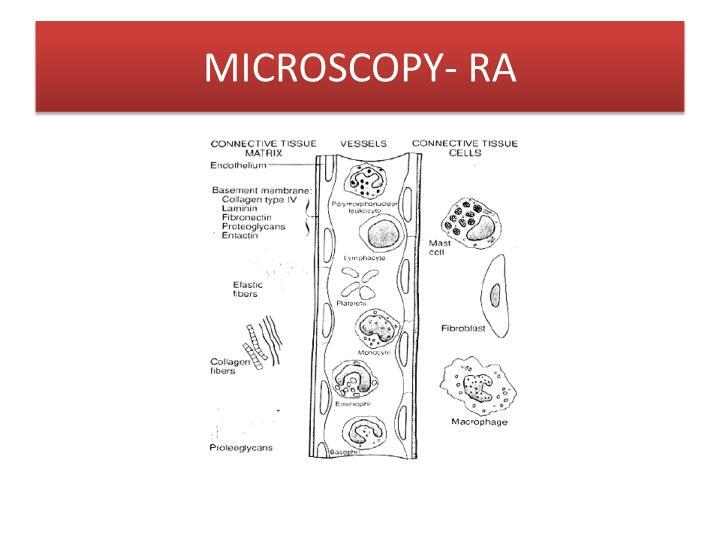 This attracts several types of leukocytes and lymphocytes to the synovial membrane out of the circulation. 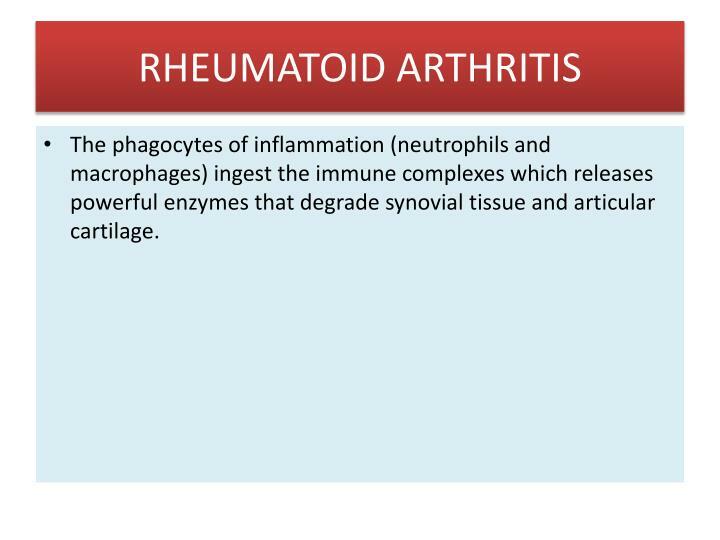 The phagocytes of inflammation (neutrophils and macrophages) ingest the immune complexes which releases powerful enzymes that degrade synovial tissue and articular cartilage. Inflammation causes hemorrhage, coagulation, and fibrin deposits on the synovial membrane, in the intracellular matrix, and in the synovial fluid. 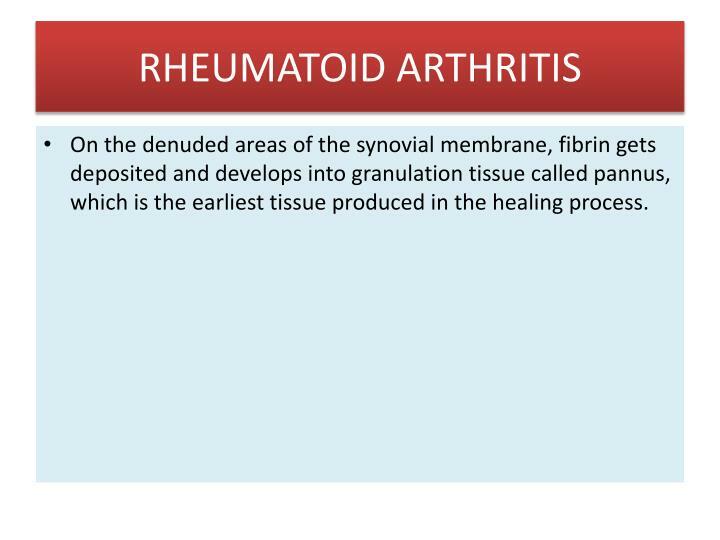 On the denuded areas of the synovial membrane, fibrin gets deposited and develops into granulation tissue called pannus, which is the earliest tissue produced in the healing process. 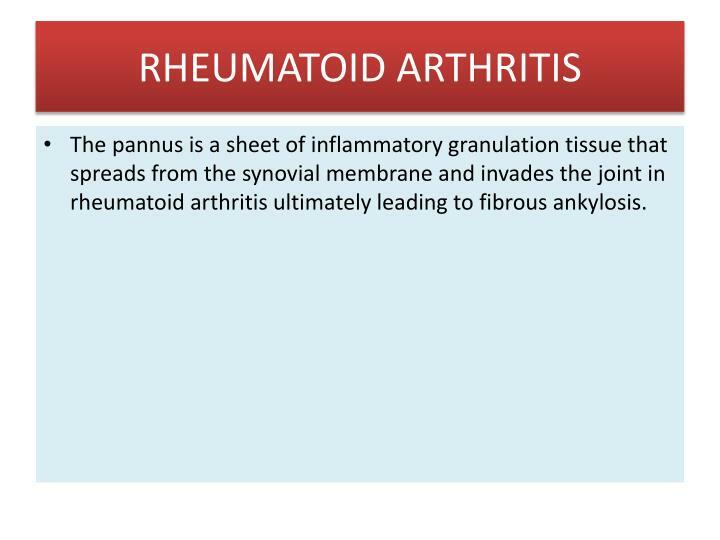 The pannus is a sheet of inflammatory granulation tissue that spreads from the synovial membrane and invades the joint in rheumatoid arthritis ultimately leading to fibrous ankylosis. 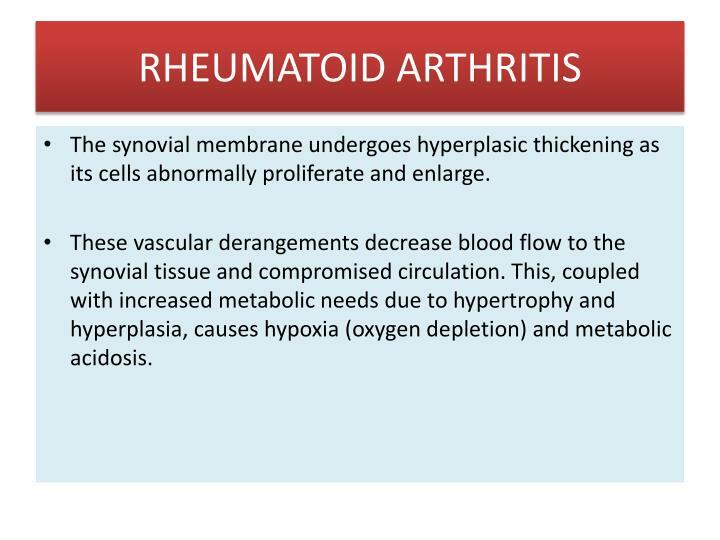 The synovial membrane undergoes hyperplasic thickening as its cells abnormally proliferate and enlarge. 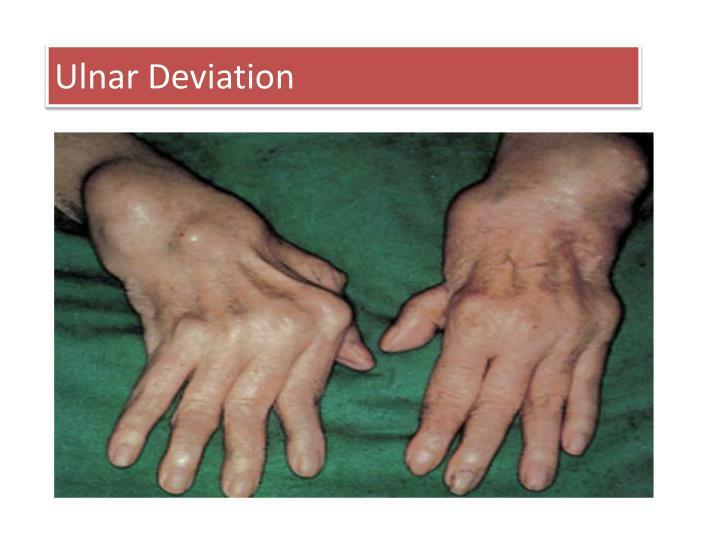 These vascular derangements decrease blood flow to the synovial tissue and compromised circulation. This, coupled with increased metabolic needs due to hypertrophy and hyperplasia, causes hypoxia (oxygen depletion) and metabolic acidosis. 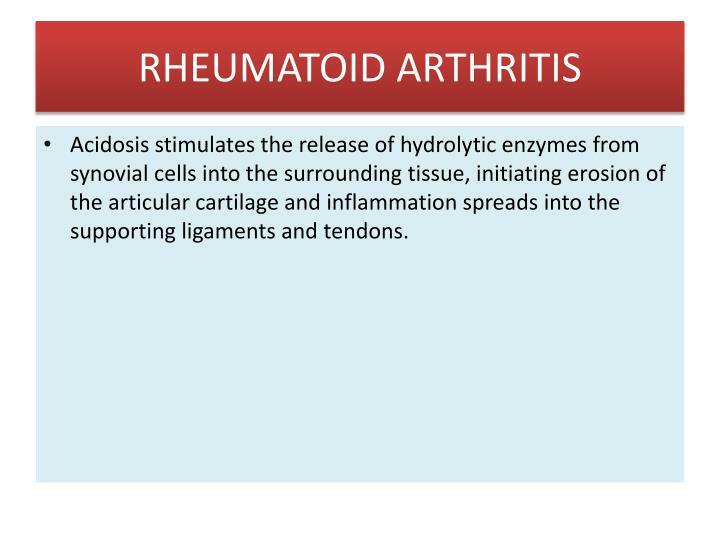 Acidosis stimulates the release of hydrolytic enzymes from synovial cells into the surrounding tissue, initiating erosion of the articular cartilage and inflammation spreads into the supporting ligaments and tendons. 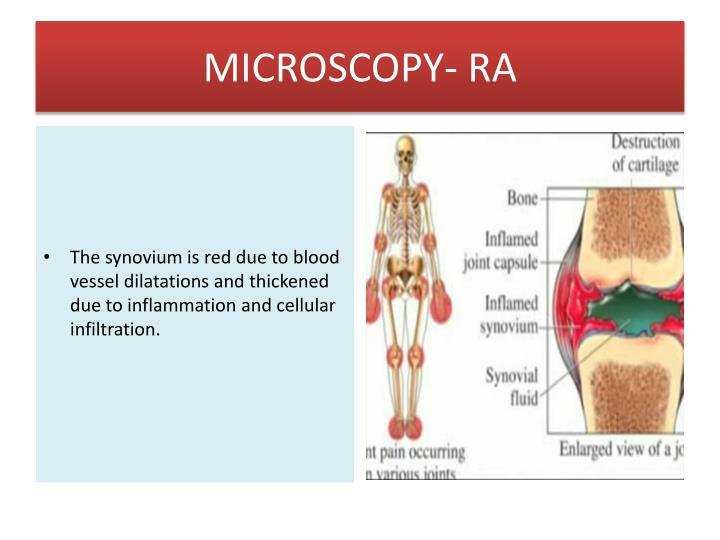 The synovitis or inflammation, results in the warmth, redness, swelling, and pain that are typical symptoms of RA. 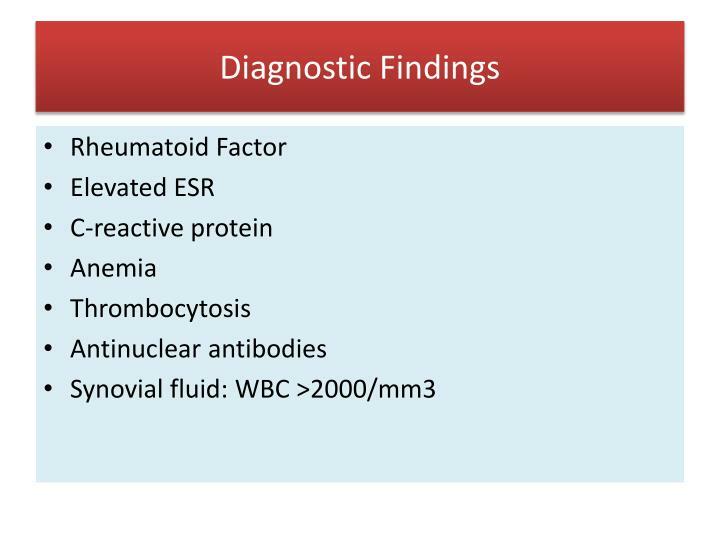 In this disease process, an interaction between antibodies and antigens occurs, and causes alterations in the composition of the synovial fluid. 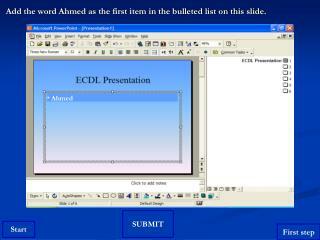 Infiltration of cells in it etc. Once the composition of this fluid is altered, it is less able to perform the normal functions and results in soft tissue destruction that eventually leads to laxity in tendons and ligaments. 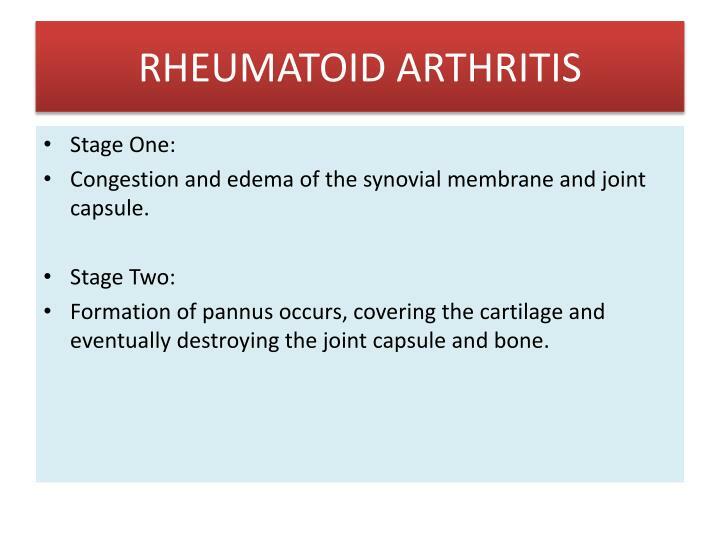 Congestion and edema of the synovial membrane and joint capsule. Formation of pannus occurs, covering the cartilage and eventually destroying the joint capsule and bone. 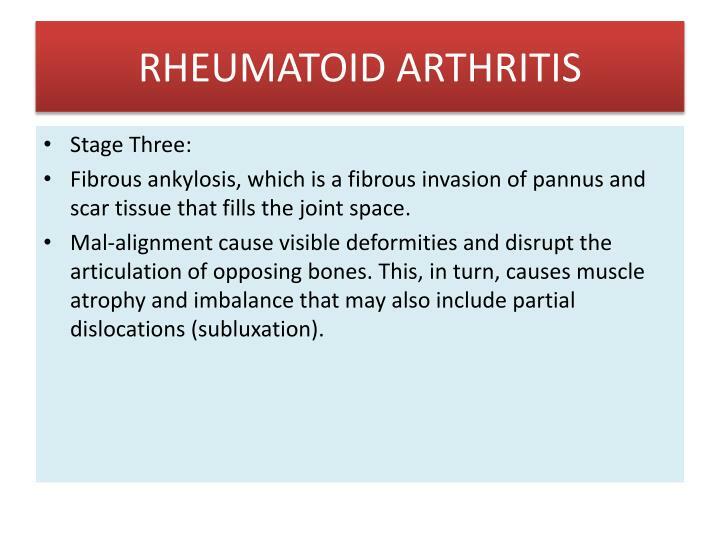 Fibrous ankylosis, which is a fibrous invasion of pannus and scar tissue that fills the joint space. 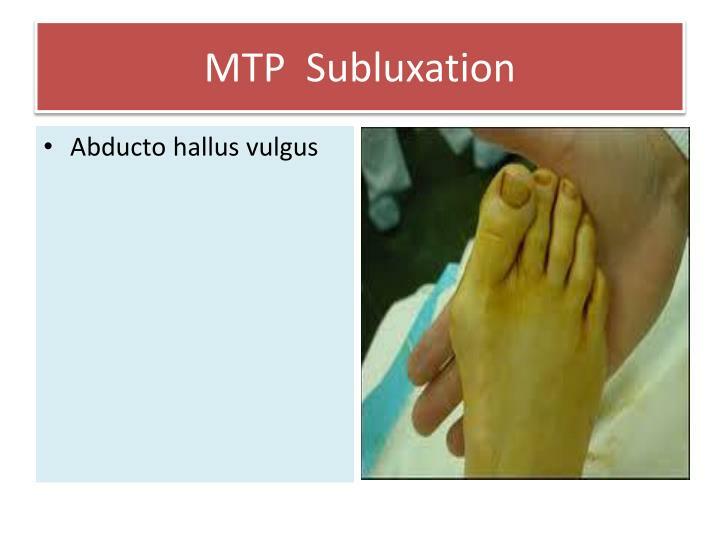 Mal-alignment cause visible deformities and disrupt the articulation of opposing bones. 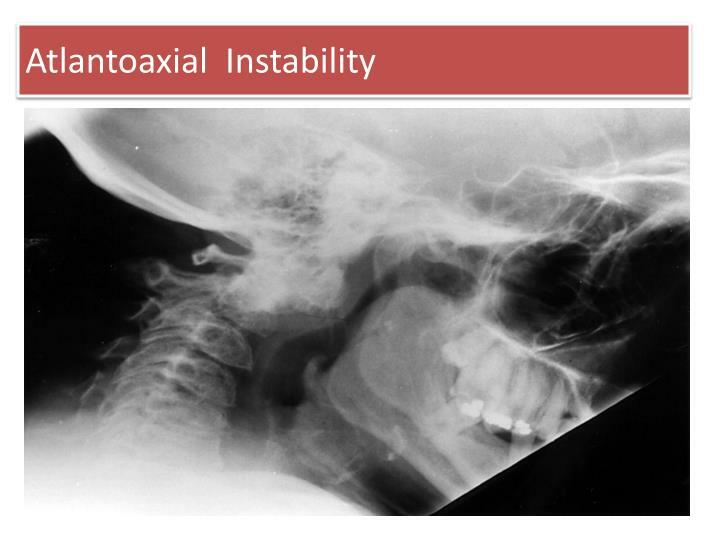 This, in turn, causes muscle atrophy and imbalance that may also include partial dislocations (subluxation). 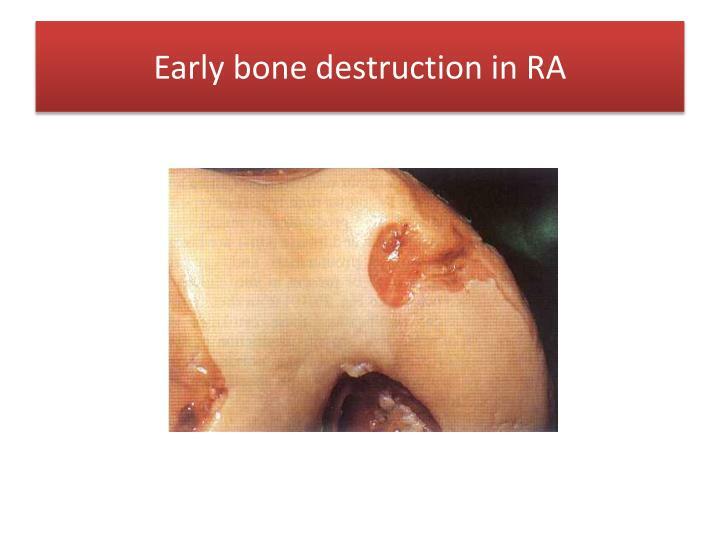 Fibrous tissue begins to calcify, resulting in bony ankylosis (total immobility). 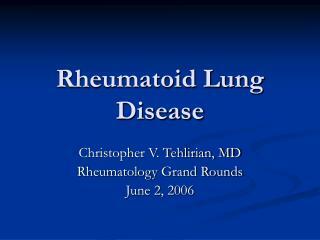 It occurs worldwide, affecting more than 6.5 million people in the U.S. alone. About 75% of these are women. 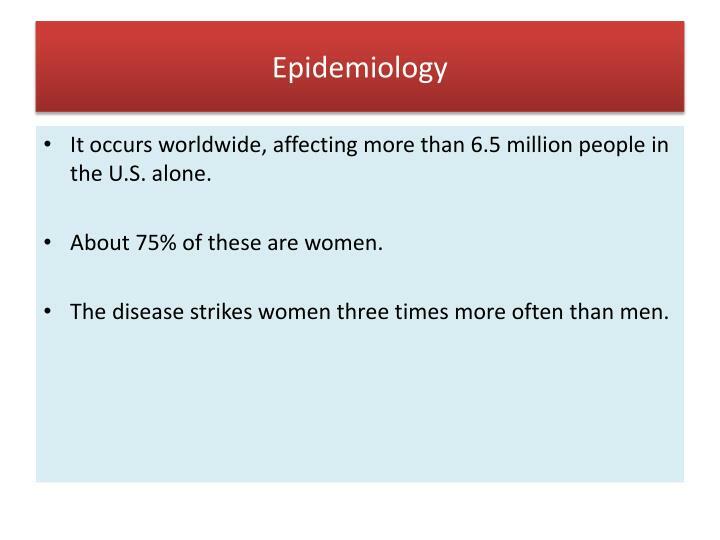 The disease strikes women three times more often than men. 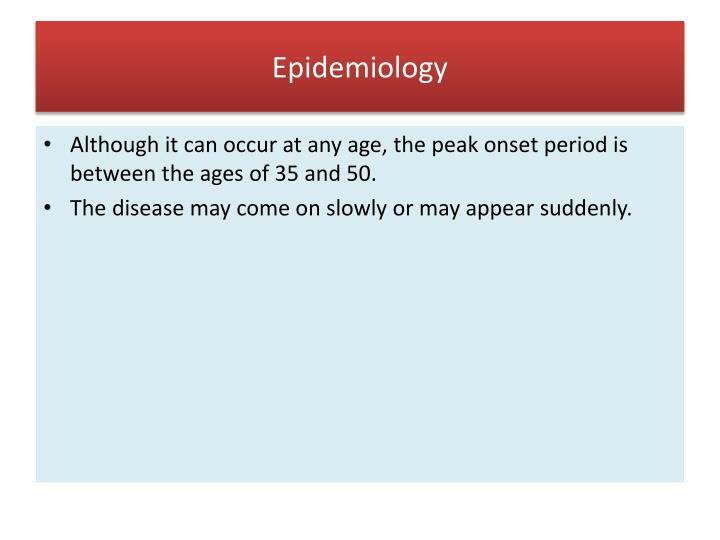 Although it can occur at any age, the peak onset period is between the ages of 35 and 50. 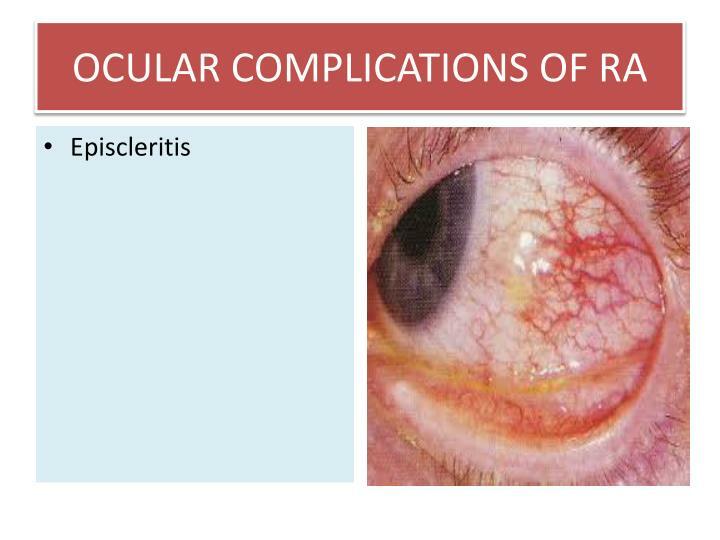 The disease may come on slowly or may appear suddenly. 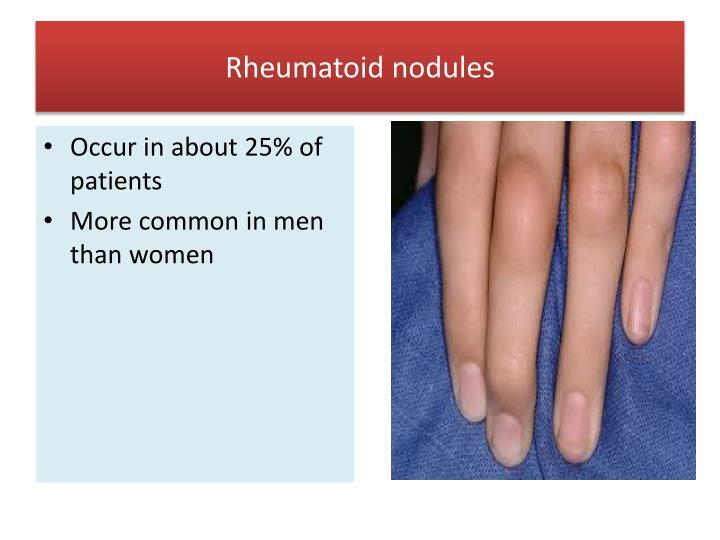 The cause of rheumatoid arthritis is unknown. Even though infectious agents such as viruses, bacteria, and fungi have long been suspected as well as smoking, but none has been proven as the cause. 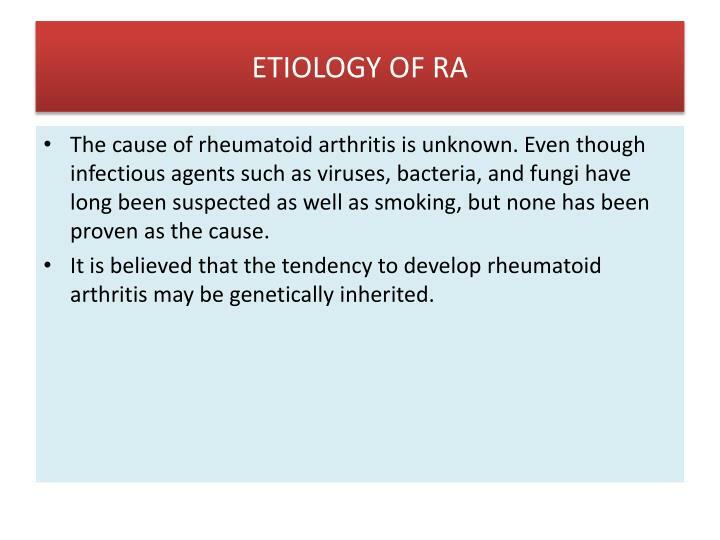 It is believed that the tendency to develop rheumatoid arthritis may be genetically inherited. 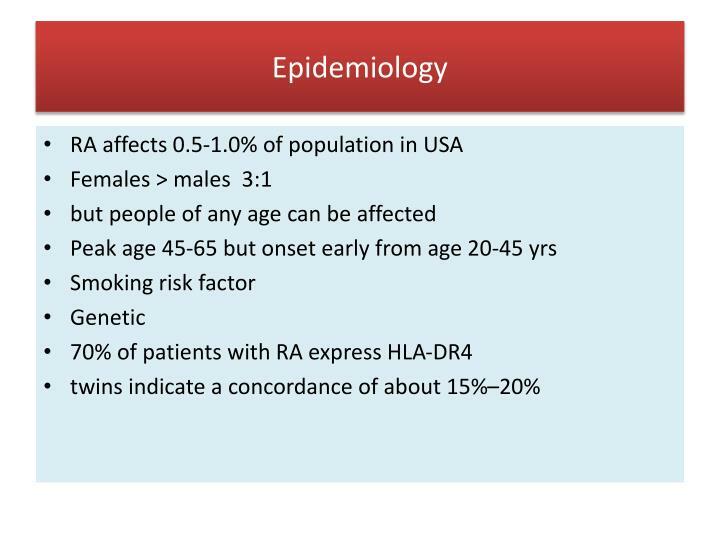 For example, the genetic marker HLA-DR4 has been identified in as many as 66% of patients with disease. 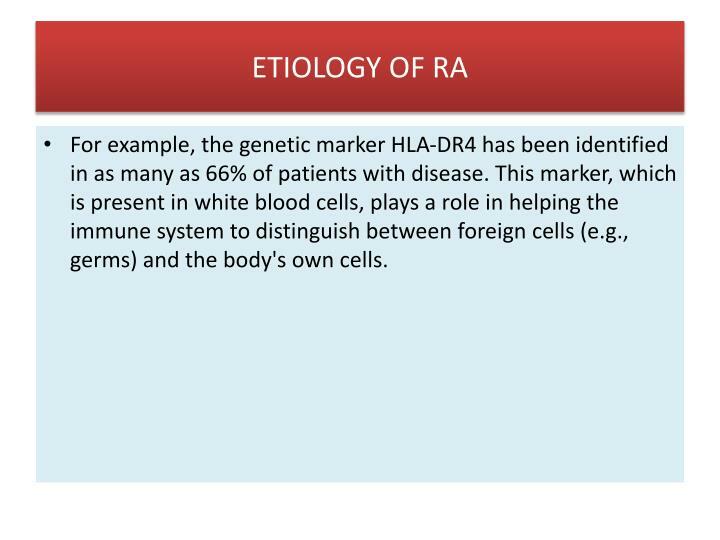 This marker, which is present in white blood cells, plays a role in helping the immune system to distinguish between foreign cells (e.g., germs) and the body's own cells. Because RA often is affected by pregnancy—symptoms improve before the infant is born and then worsen after delivery—it may be that hormones in the body influence disease development and progression. 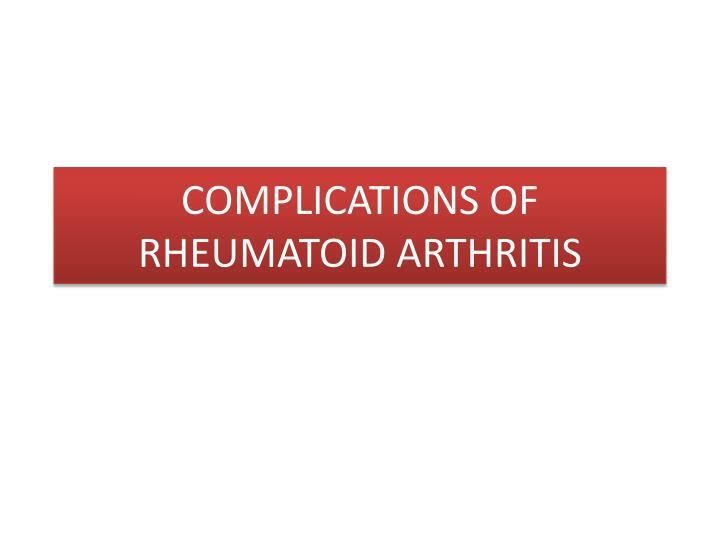 Stress — Patients often report episodes of stress or trauma preceding the onset of their rheumatoid arthritis. Stressful "life events" (divorce, accidents, grief, etc) are more common in people with RA in the six months before their diagnosis compared to the general population. 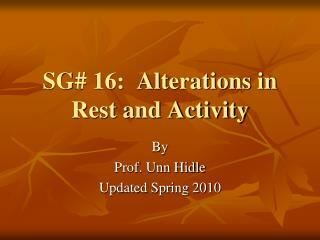 All this might trigger the activation of the immune system in susceptible individuals. 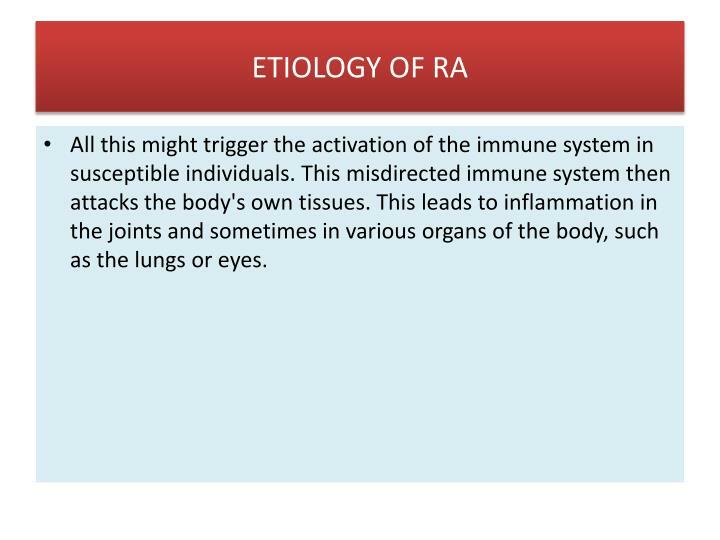 This misdirected immune system then attacks the body's own tissues. 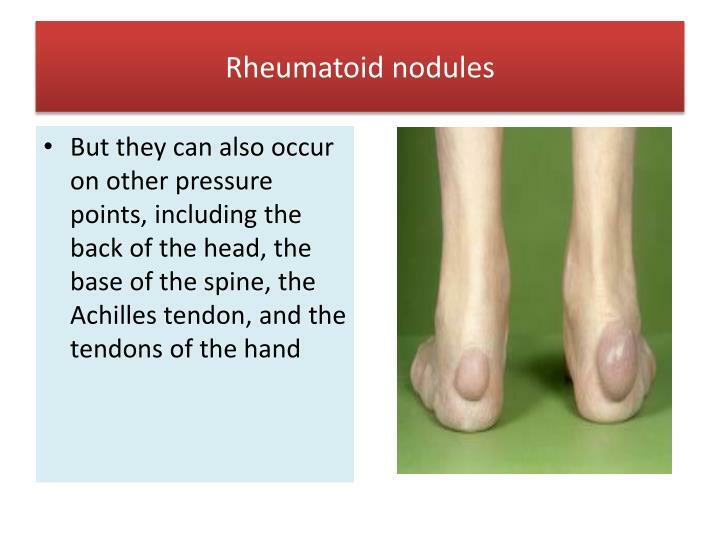 This leads to inflammation in the joints and sometimes in various organs of the body, such as the lungs or eyes. 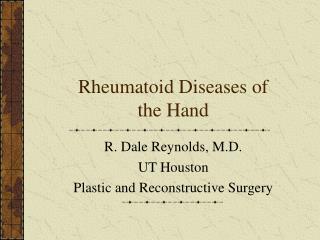 The joints of the hands are often the very first joints affected by rheumatoid arthritis. These joints are tender when squeezed, and the hand's grip strength is often reduced. 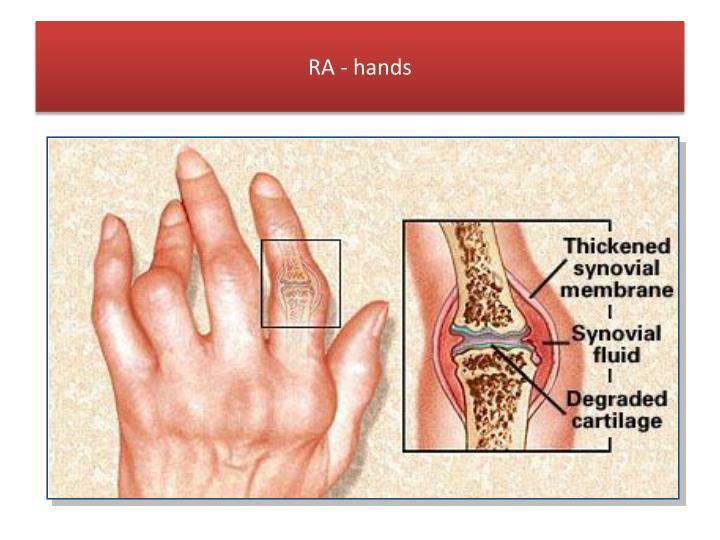 Rheumatoid arthritis may lead to visible redness and swelling and pain of joints or entire the entire hand. 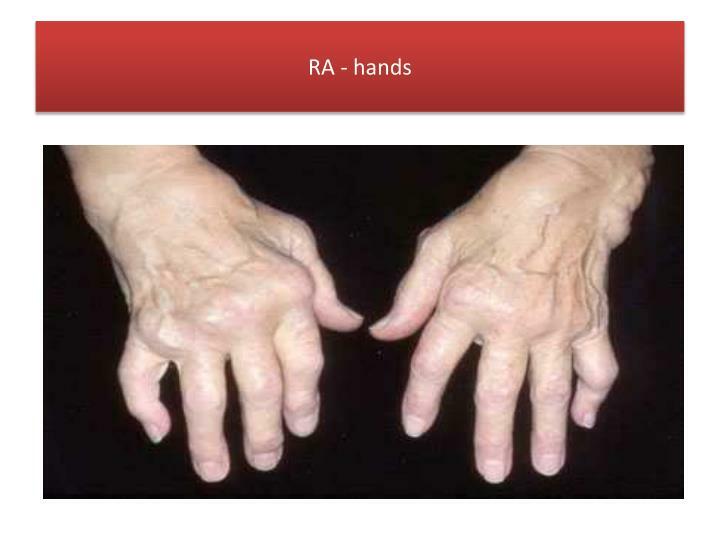 The joints of the hands are often the very first joints affected by rheumatoid arthritis. These joints are swollen red and tender when squeezed. 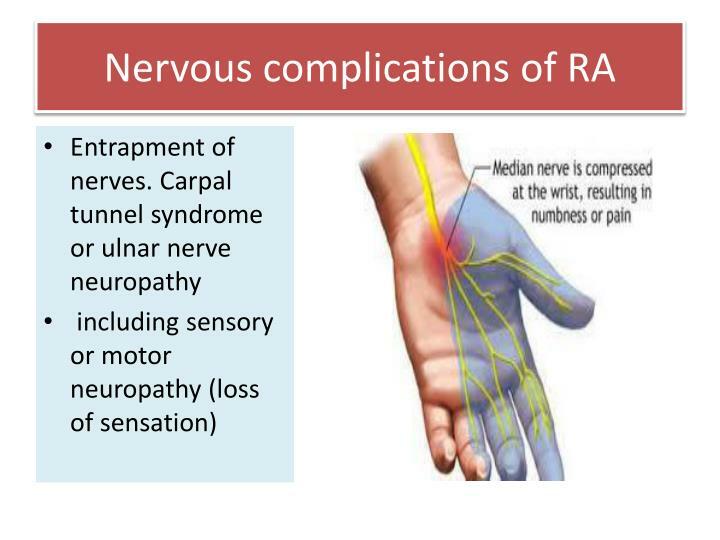 Metacarpophalangeal and proximal inter phalangeal are involved. The joint stiffness is most bothersome in the morning and after sitting still for a period of time. The stiffness can persist for more than one hour. 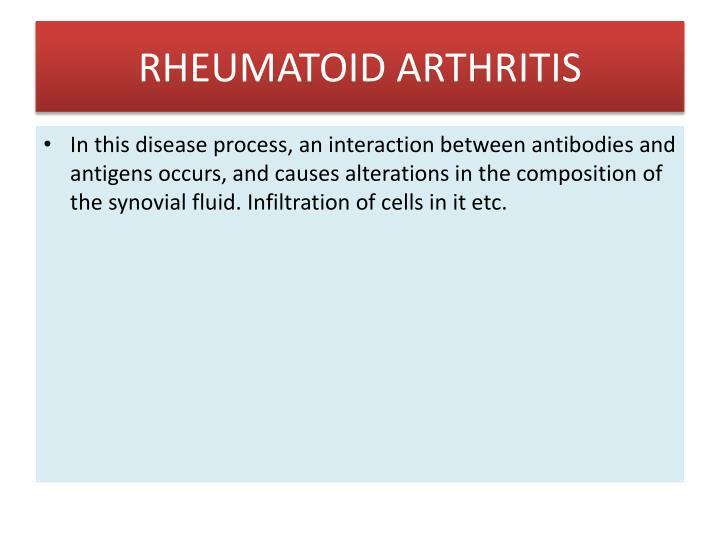 The symptoms of rheumatoid arthritis come and go, depending on the degree of tissue inflammation. 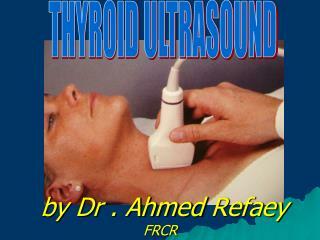 When body tissues are inflamed, the disease is active. 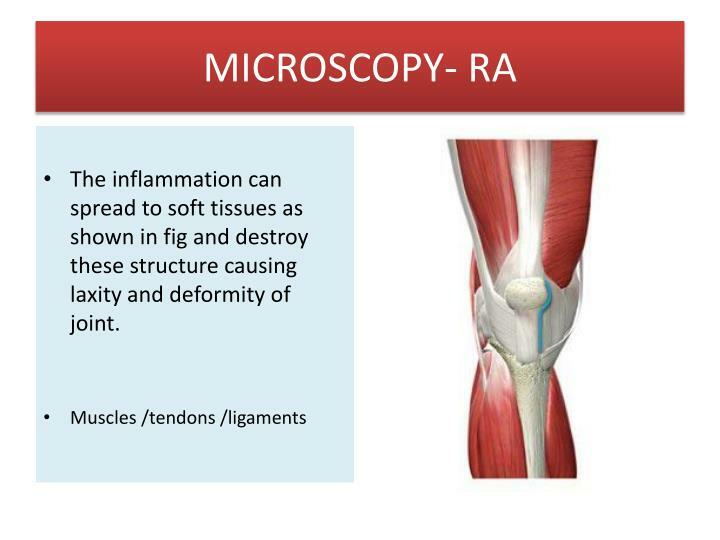 When tissue inflammation subsides, the disease is inactive (in remission). 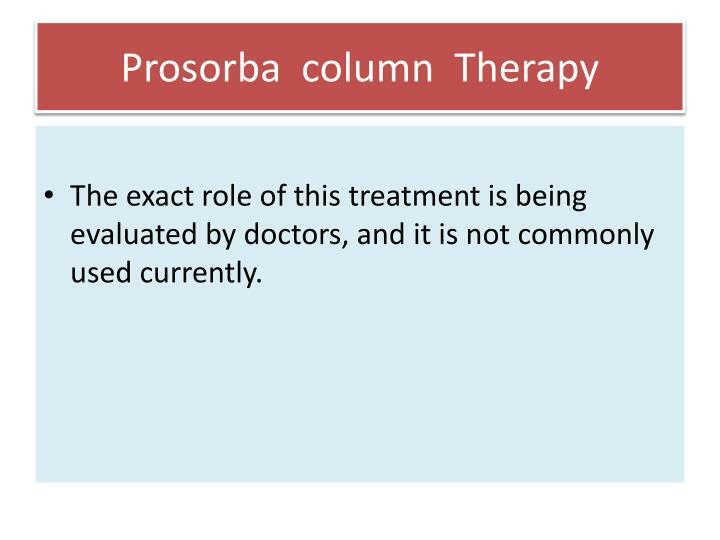 Remissions can occur spontaneously or with treatment and can last weeks, months, or years. 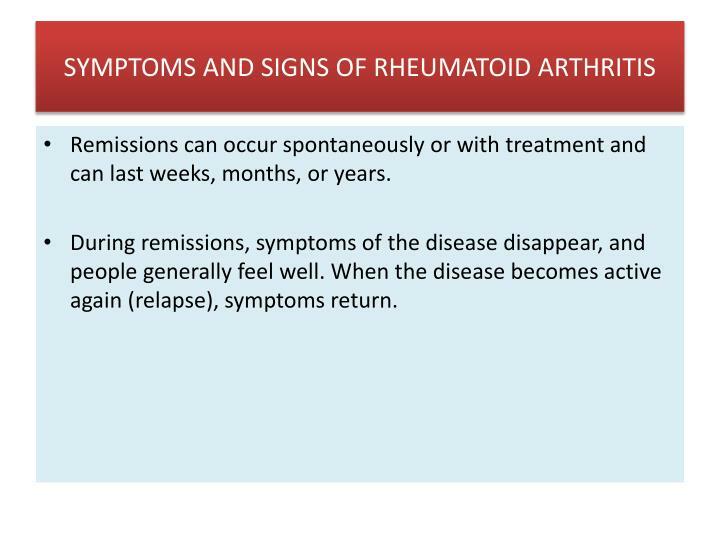 During remissions, symptoms of the disease disappear, and people generally feel well. When the disease becomes active again (relapse), symptoms return. 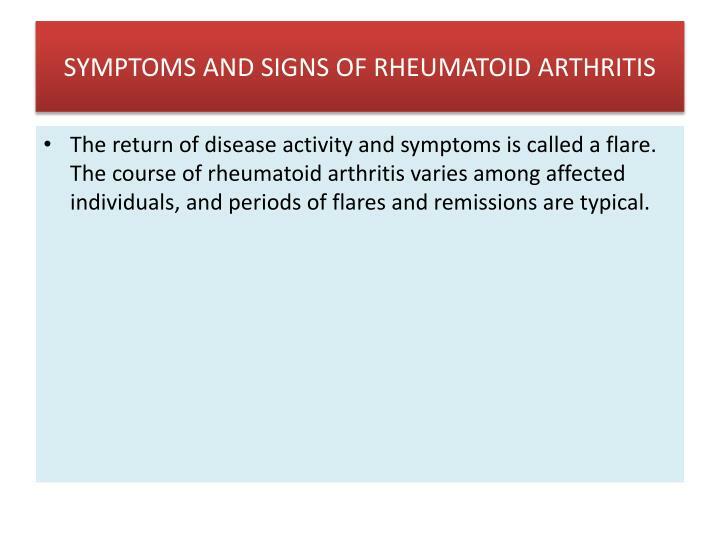 The return of disease activity and symptoms is called a flare. 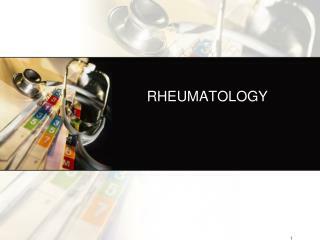 The course of rheumatoid arthritis varies among affected individuals, and periods of flares and remissions are typical. 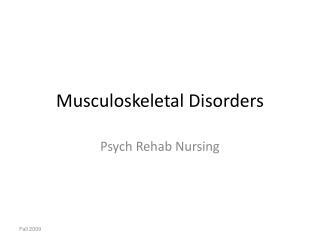 Muscle and joint stiffness are usually most notable in the morning and after periods of inactivity. Arthritis is common during disease flares. 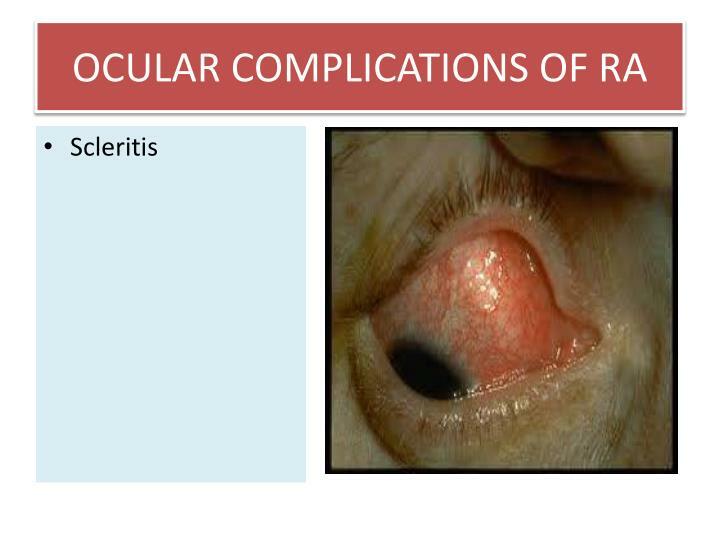 Also during flares, joints frequently become red, swollen, painful, and tender. This occurs because the lining tissue of the joint (synovium) becomes inflamed (synovitis) , resulting in the production of excessive joint fluid (synovial fluid). 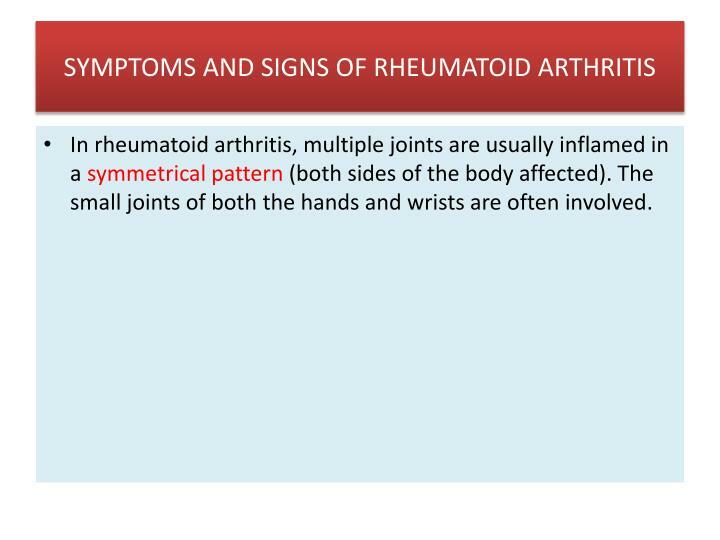 In rheumatoid arthritis, multiple joints are usually inflamed in a symmetrical pattern (both sides of the body affected). 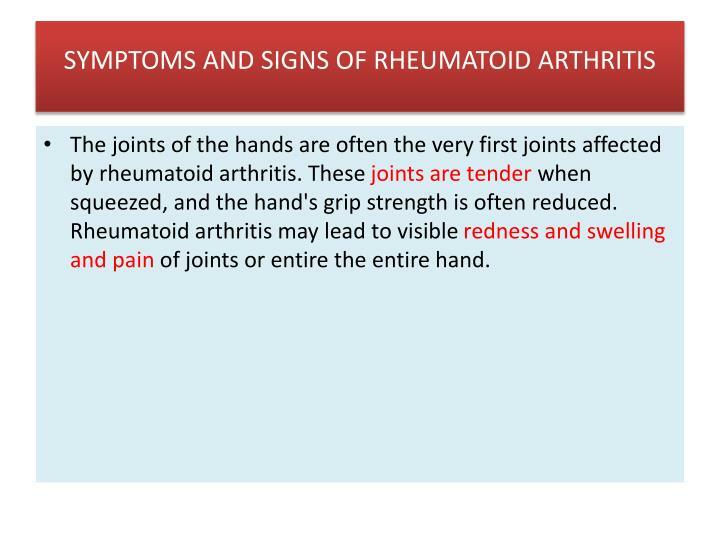 The small joints of both the hands and wrists are often involved. 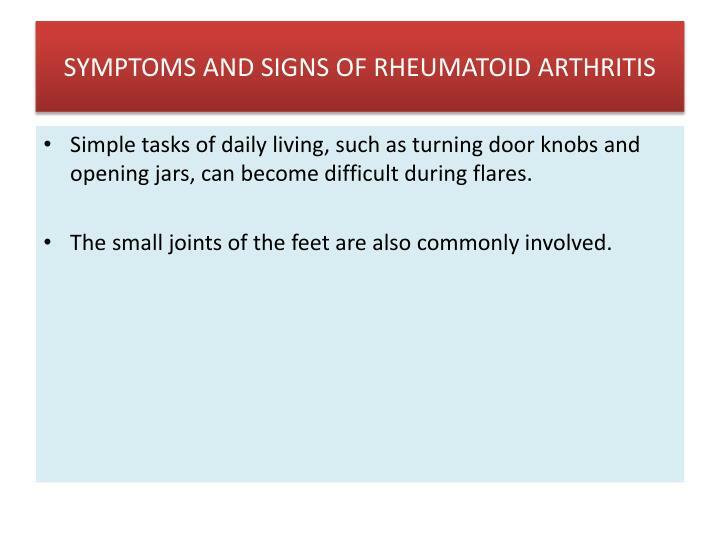 Simple tasks of daily living, such as turning door knobs and opening jars, can become difficult during flares. 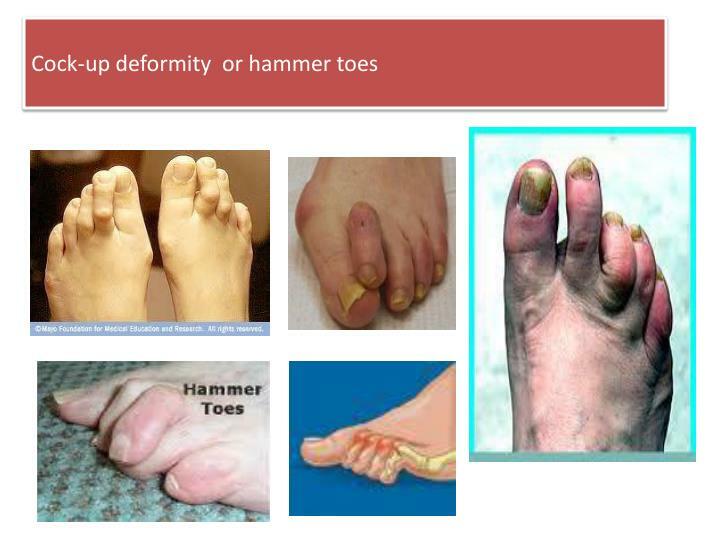 The small joints of the feet are also commonly involved. Chronic inflammation can cause damage to body tissues, including cartilage, tendons, ligaments and bone. 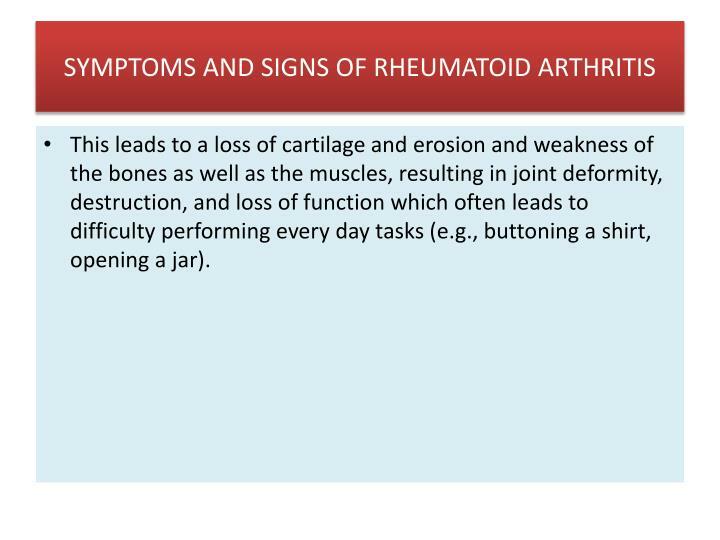 This leads to a loss of cartilage and erosion and weakness of the bones as well as the muscles, resulting in joint deformity, destruction, and loss of function which often leads to difficulty performing every day tasks (e.g., buttoning a shirt, opening a jar). 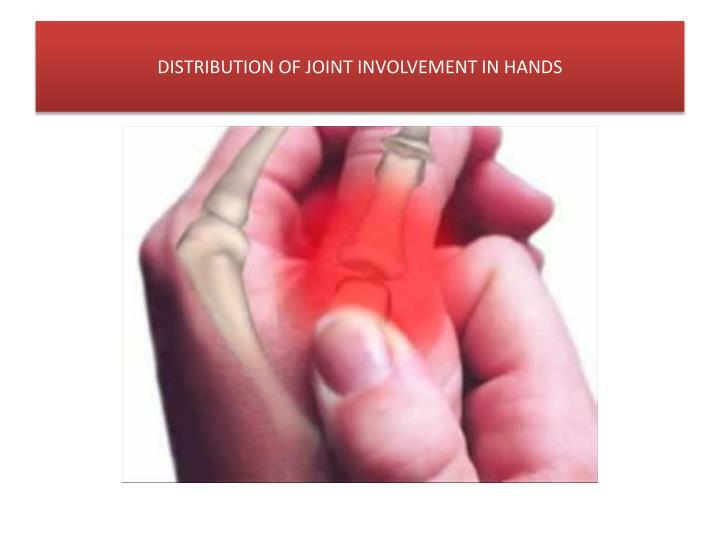 Occasionally, only one joint is inflamed. When only one joint is involved, the arthritis can mimic the joint inflammation caused by other forms of arthritis, such as gout or joint infection. 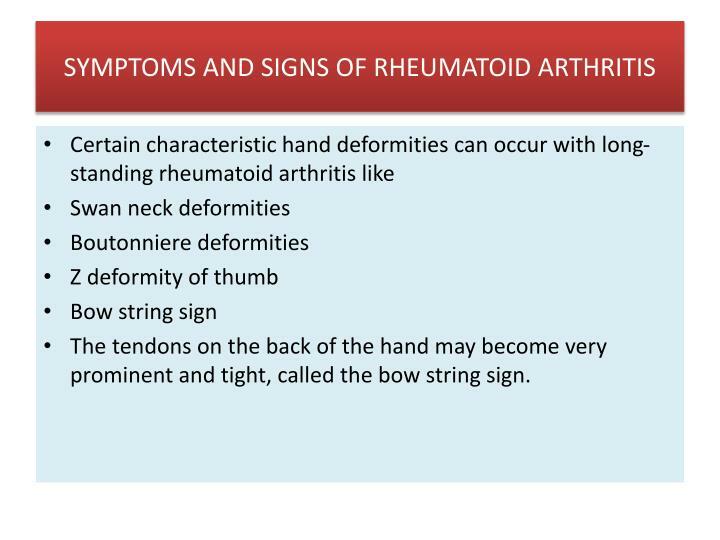 The tendons on the back of the hand may become very prominent and tight, called the bow string sign. 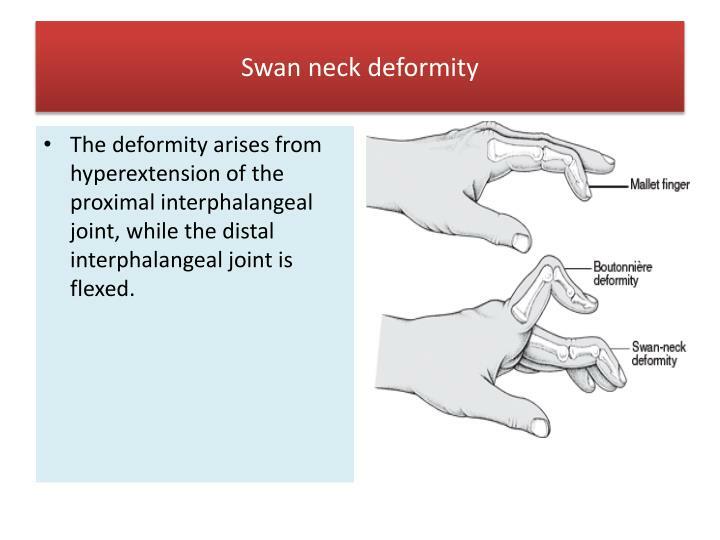 The deformity arises from hyperextension of the proximal interphalangeal joint, while the distal interphalangeal joint is flexed. 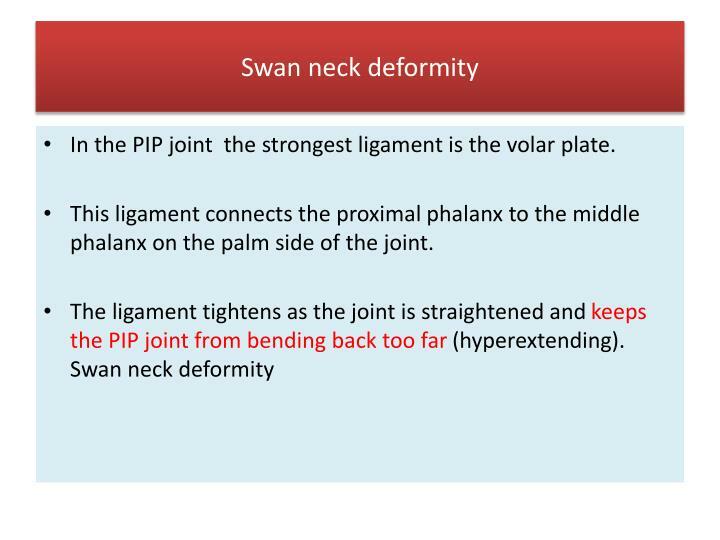 In the PIP joint the strongest ligament is the volar plate. 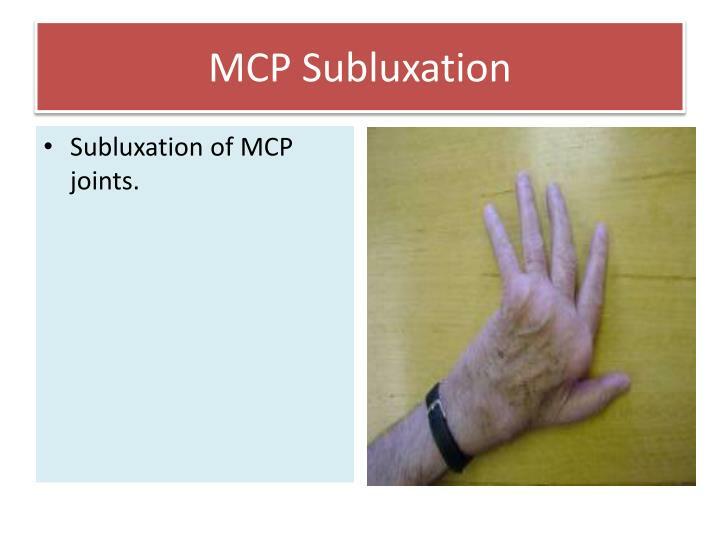 This ligament connects the proximal phalanx to the middle phalanx on the palm side of the joint. Although characteristic in RA, swan-neck deformity has several causes, including untreated mallet finger, laxity of the ligaments of the volar aspect of the PIP joint in old age or a normal variant. 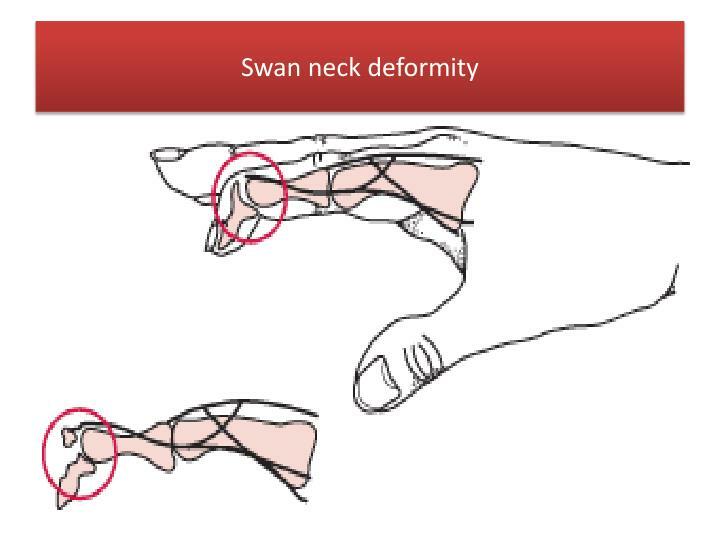 True swan-neck deformity does not affect the thumb, which has only one interphalangeal joint. 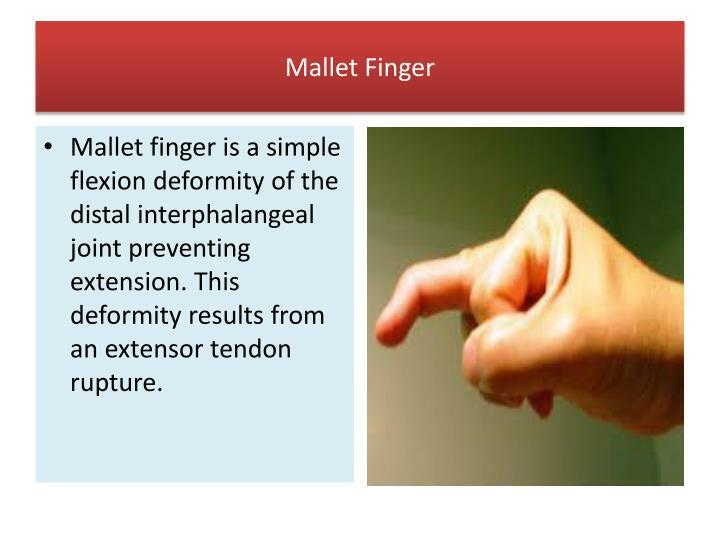 Mallet finger is a simple flexion deformity of the distal interphalangeal joint preventing extension. 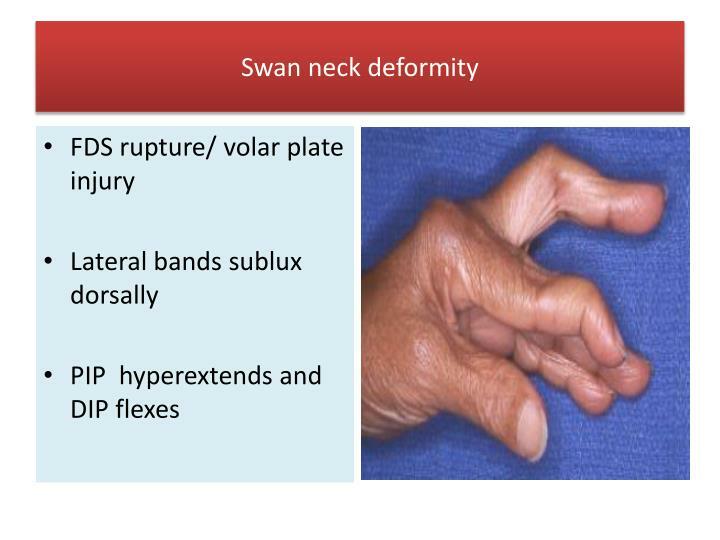 This deformity results from an extensor tendon rupture. 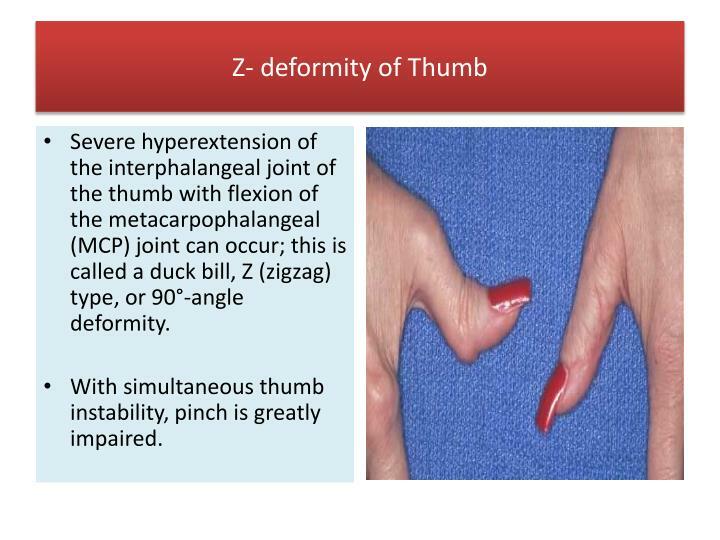 Severe hyperextension of the interphalangeal joint of the thumb with flexion of the metacarpophalangeal (MCP) joint can occur; this is called a duck bill, Z (zigzag) type, or 90°-angle deformity. With simultaneous thumb instability, pinch is greatly impaired. Flexion of the PIP joint accompanied by hyperextension of the DIP joint . 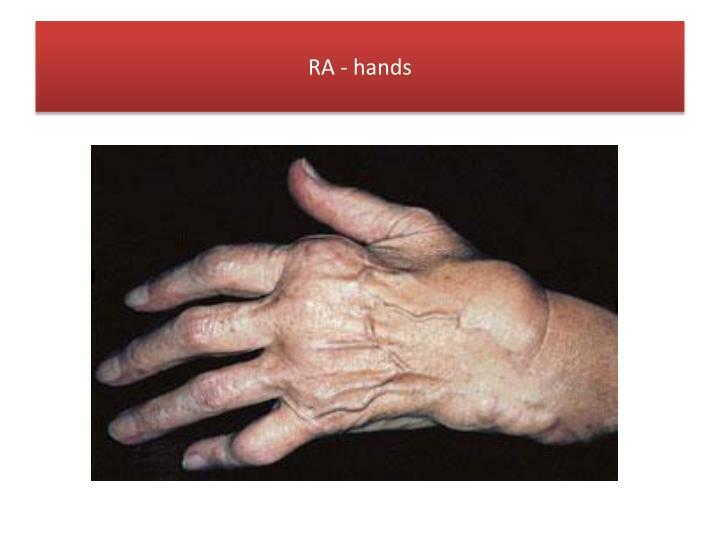 This deformity can result from tendon laceration, dislocation, fracture, osteoarthritis, or RA. 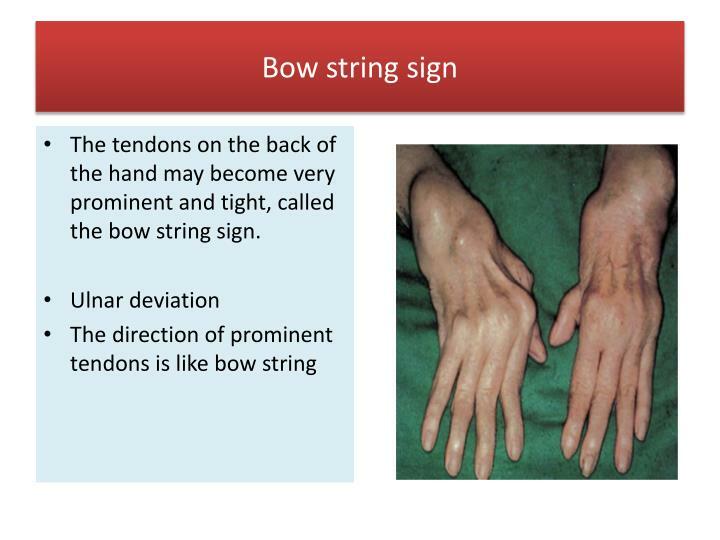 The tendons which straighten finger joints are like strings running from the sides and the back of the finger to a sheet on the top of the finger. When the finger is hit or bent forcefully in just the wrong way, the sheet on the top of the finger (the central slip of tendon) tears away from its attachment to the top of the middle finger bone. The tear in the tendon sheet looks like a buttonhole ("boutonniere" in French), and the end of the finger bone actually begins to stick through the hole. 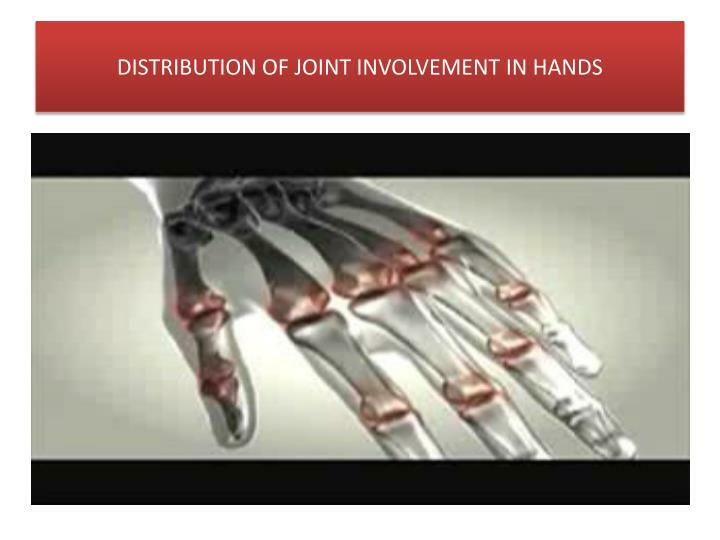 As a result, the tendons can't straighten the middle joint (which stays bent) and all of the force of the tendons bypasses the middle joint and goes to the end joint (which flips backward). 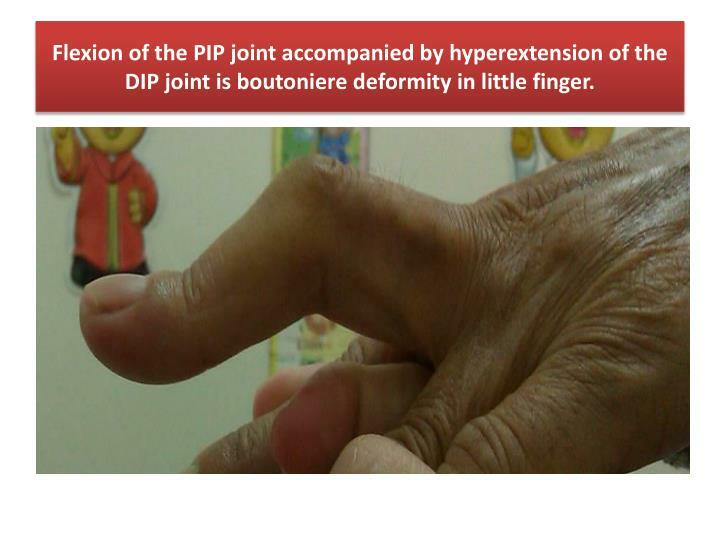 Flexion of the PIP joint accompanied by hyperextension of the DIP joint is boutoniere deformity in little finger. Painless firm lumps that appear beneath the skin, often single or multiple, and range in size from millimeters to centimeters in diameter occur on the underside of the forearm and on the elbow. 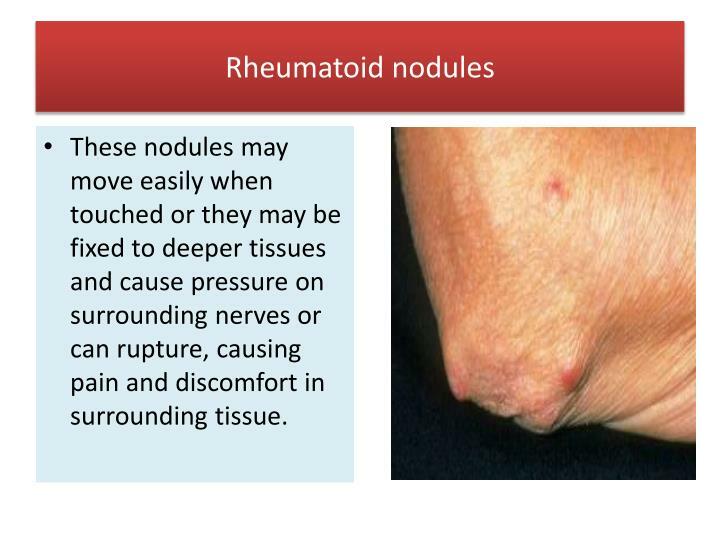 These nodules may move easily when touched or they may be fixed to deeper tissues and cause pressure on surrounding nerves or can rupture, causing pain and discomfort in surrounding tissue. 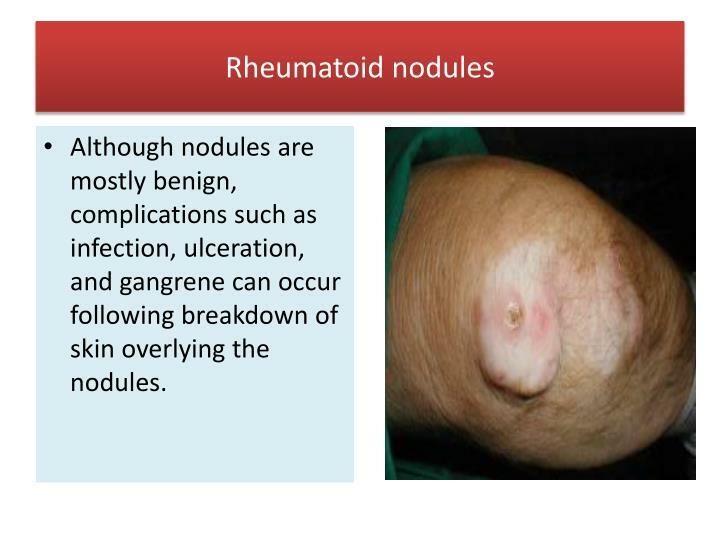 Although nodules are mostly benign, complications such as infection, ulceration, and gangrene can occur following breakdown of skin overlying the nodules. 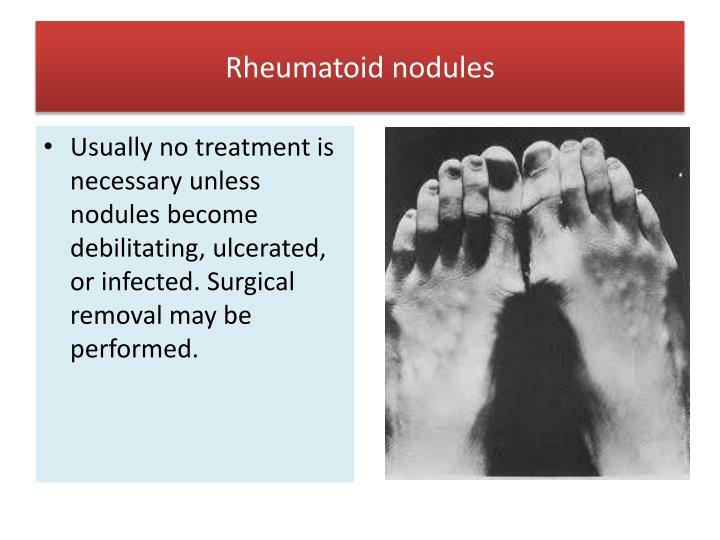 Usually no treatment is necessary unless nodules become debilitating, ulcerated, or infected. Surgical removal may be performed. 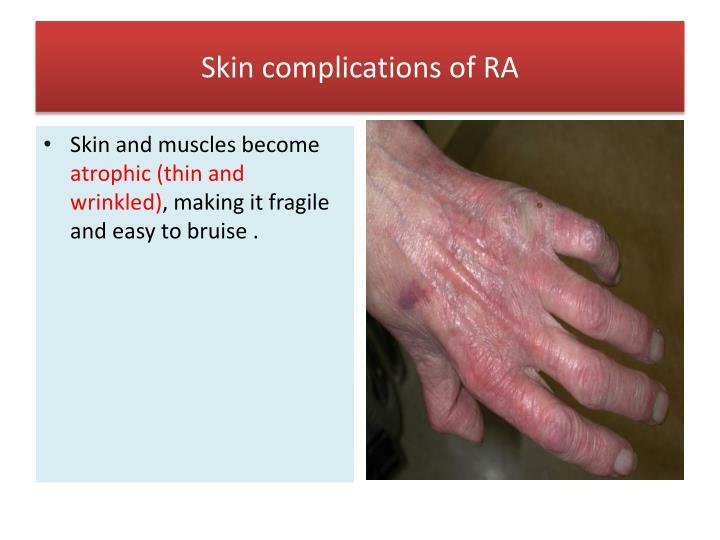 Skin and muscles become atrophic (thin and wrinkled), making it fragile and easy to bruise . 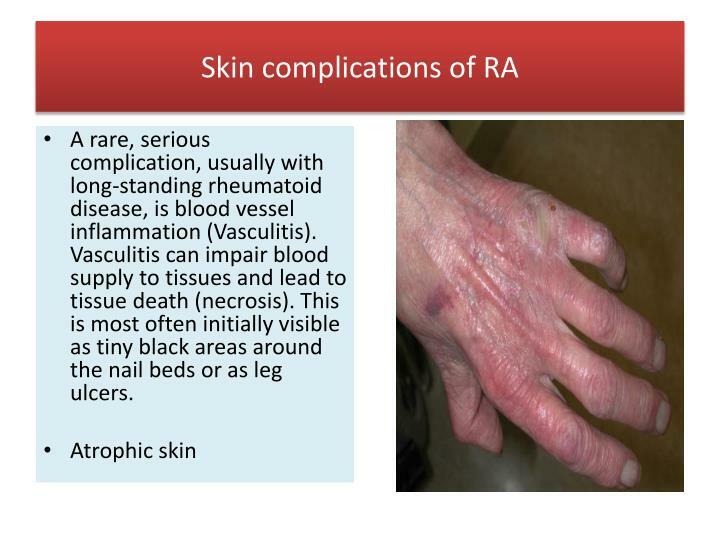 A rare, serious complication, usually with long-standing rheumatoid disease, is blood vessel inflammation (Vasculitis). 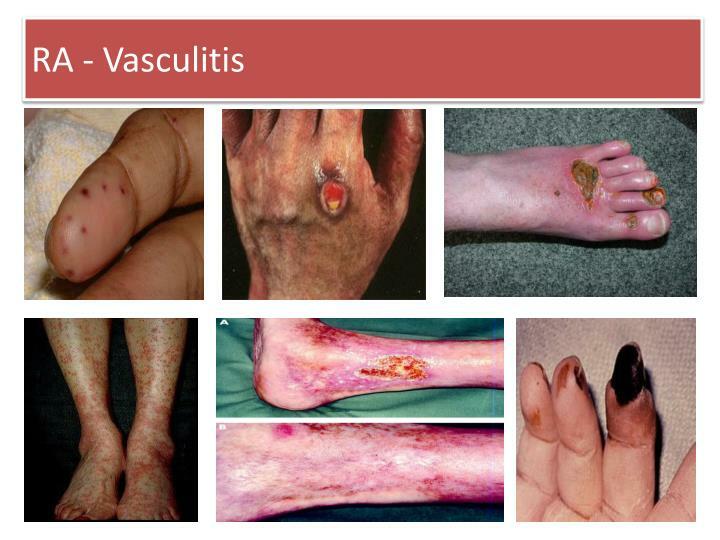 Vasculitis can impair blood supply to tissues and lead to tissue death (necrosis). 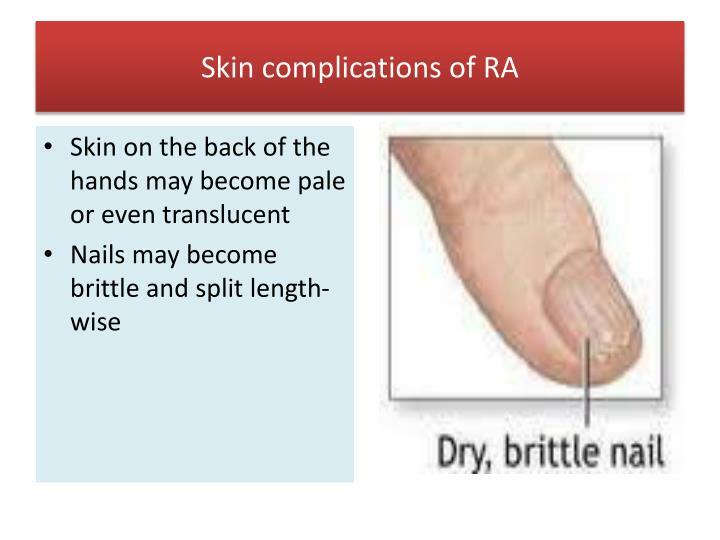 This is most often initially visible as tiny black areas around the nail beds or as leg ulcers. 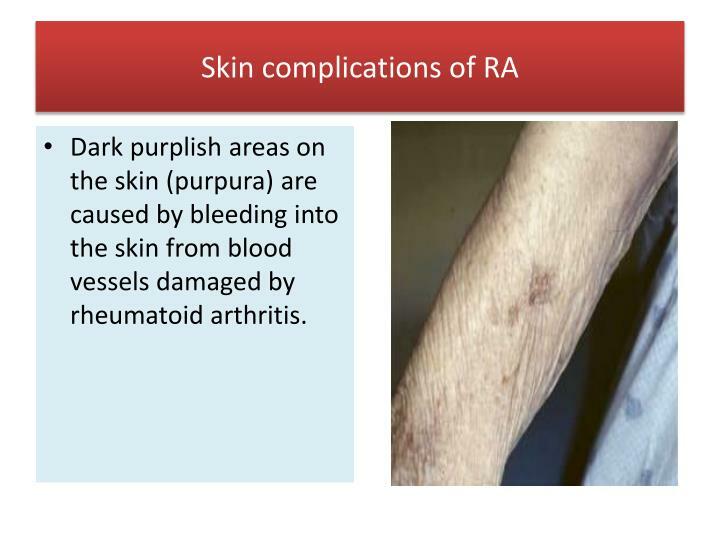 Dark purplish areas on the skin (purpura) are caused by bleeding into the skin from blood vessels damaged by rheumatoid arthritis. 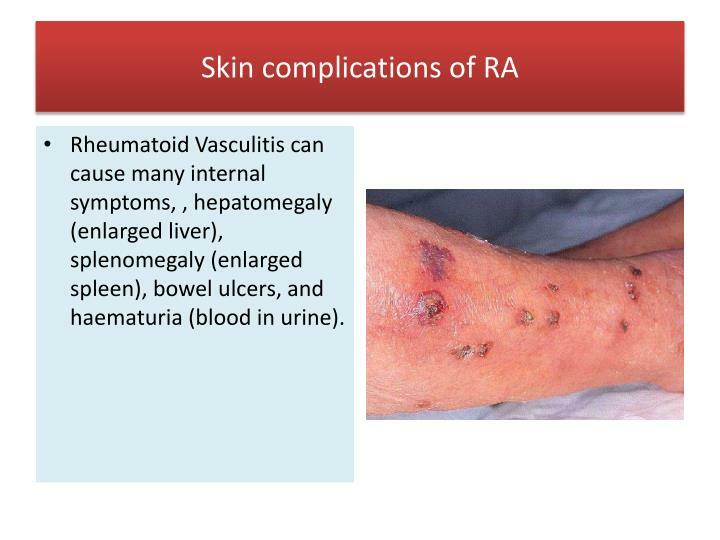 Rheumatoid Vasculitis can cause many internal symptoms, , hepatomegaly (enlarged liver), splenomegaly (enlarged spleen), bowel ulcers, and haematuria (blood in urine). 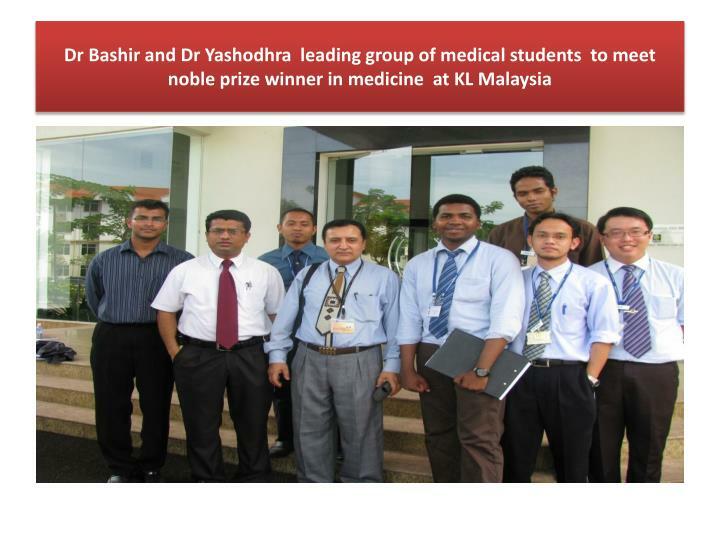 Neutrophils are a type of white blood cell (leucocyte). 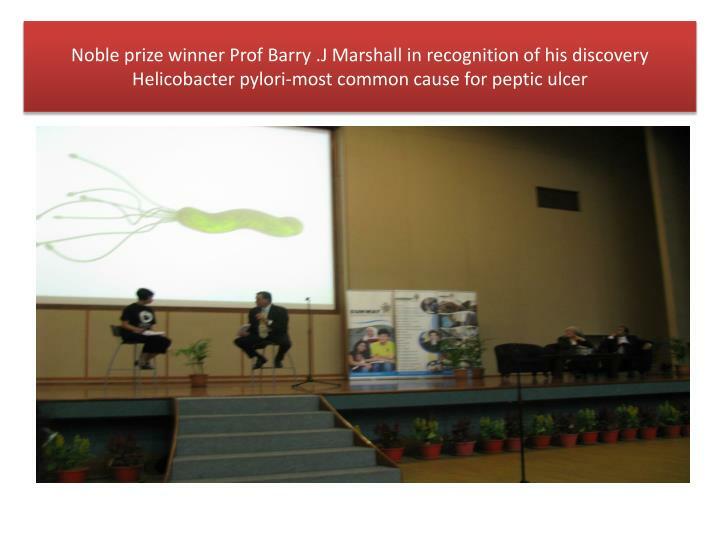 They are present in bacterial infections. 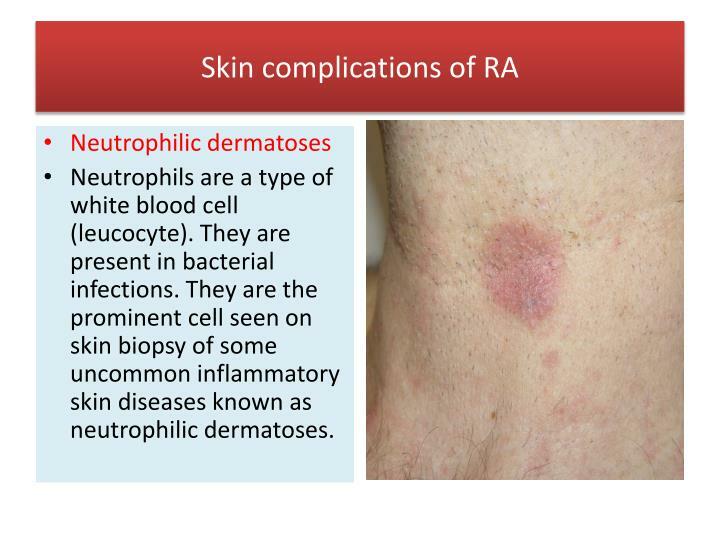 They are the prominent cell seen on skin biopsy of some uncommon inflammatory skin diseases known as neutrophilic dermatoses. 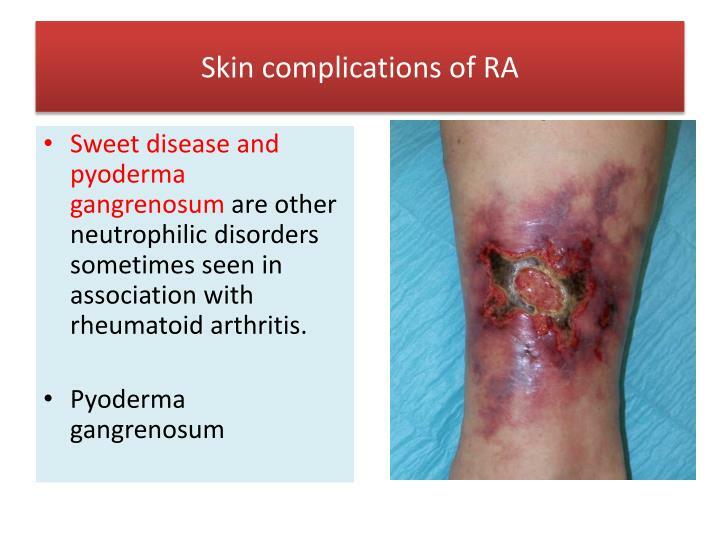 Sweet disease and pyoderma gangrenosum are other neutrophilic disorders sometimes seen in association with rheumatoid arthritis. 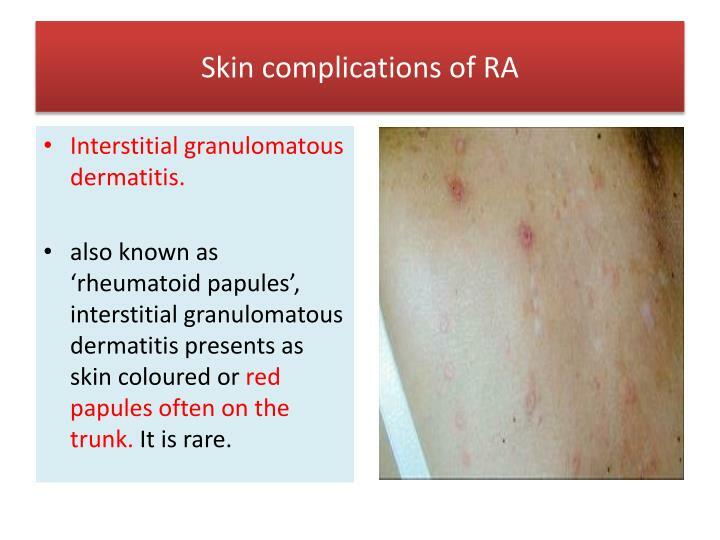 also known as ‘rheumatoid papules’, interstitial granulomatous dermatitis presents as skin coloured or red papules often on the trunk. It is rare. 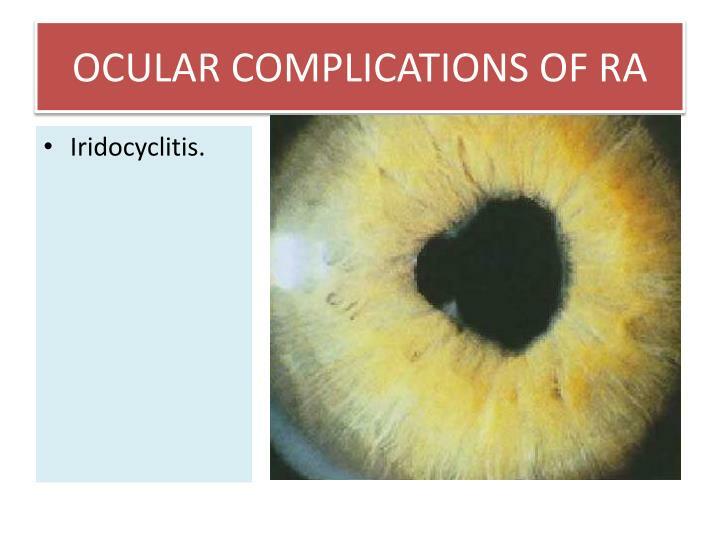 Decreased tear and saliva production can cause dry mouth, and dry eyes. 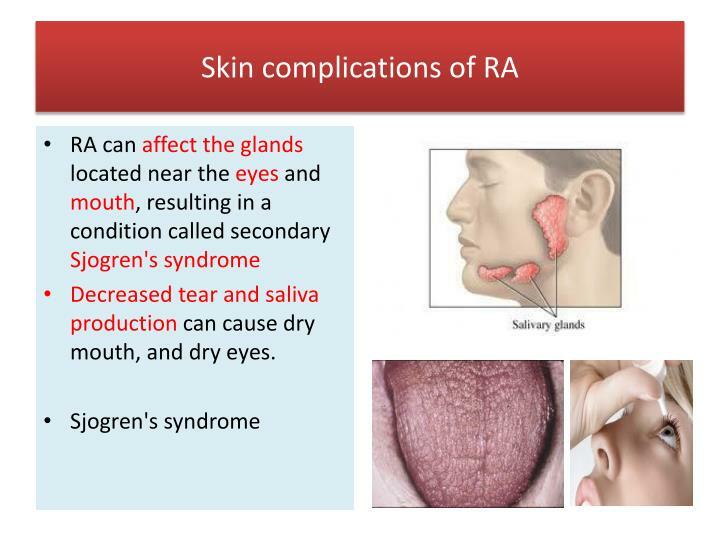 Dry mouth, related to Sjogren syndrome, is the most common symptom of gastrointestinal involvement. 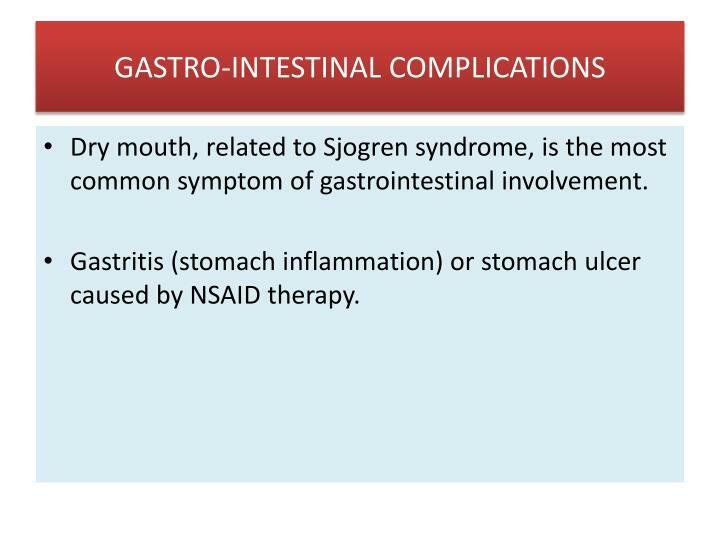 Gastritis (stomach inflammation) or stomach ulcer caused by NSAID therapy. 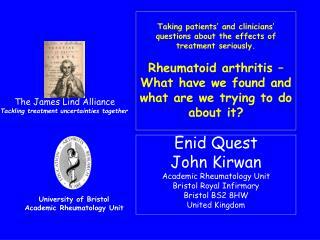 The kidneys are not usually affected directly by rheumatoid arthritis. 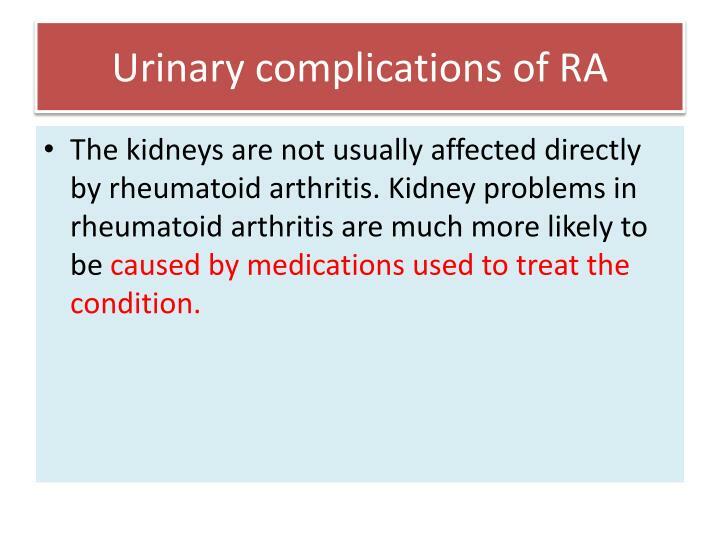 Kidney problems in rheumatoid arthritis are much more likely to be caused by medications used to treat the condition. 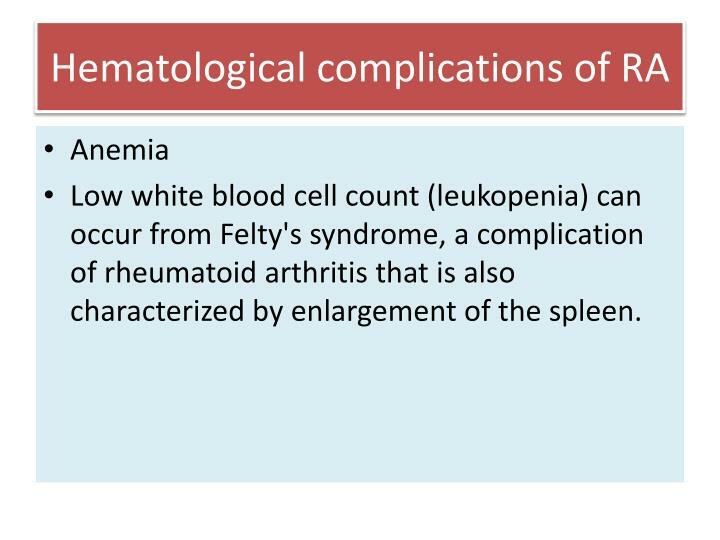 Low white blood cell count (leukopenia) can occur from Felty's syndrome, a complication of rheumatoid arthritis that is also characterized by enlargement of the spleen. Immune thrombocytopenic purpura caused by an autoimmune reaction against platelets. 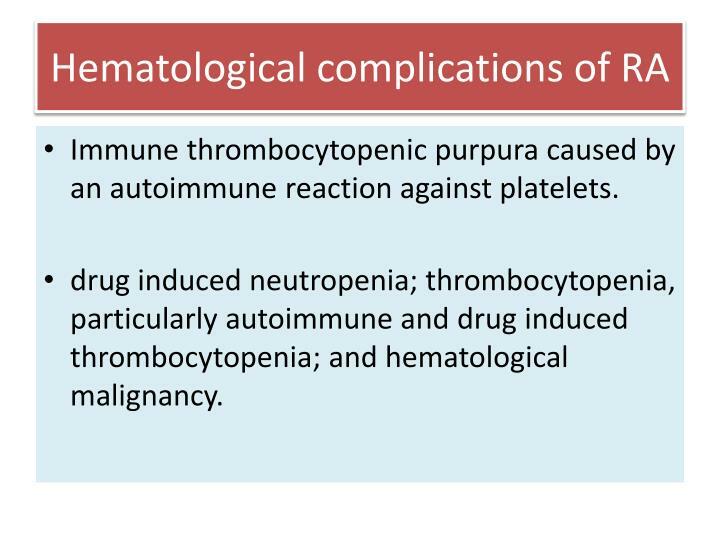 drug induced neutropenia; thrombocytopenia, particularly autoimmune and drug induced thrombocytopenia; and hematological malignancy. 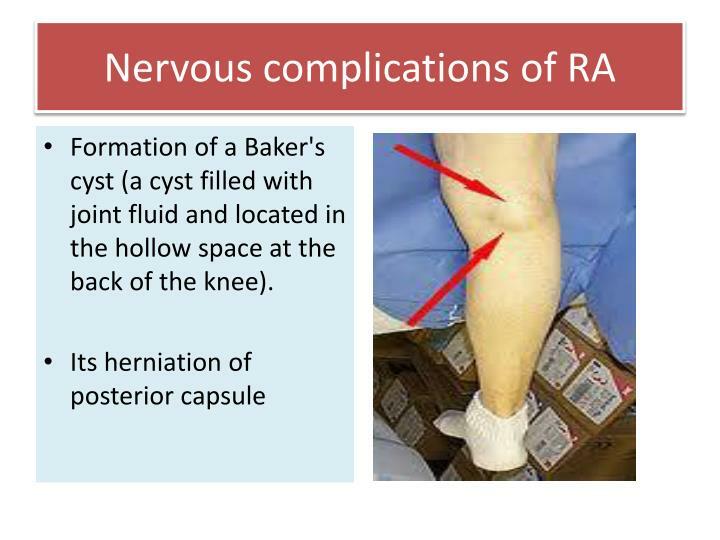 Formation of a Baker's cyst (a cyst filled with joint fluid and located in the hollow space at the back of the knee). 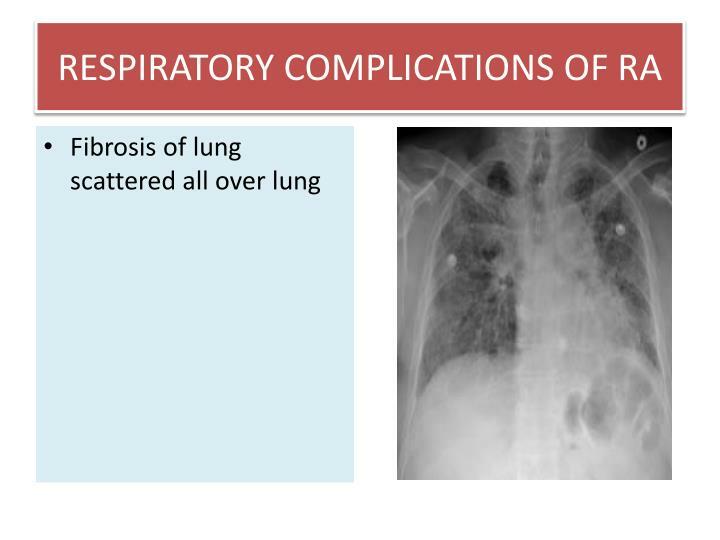 The combination of RA and exposure to coal dust produces the condition. 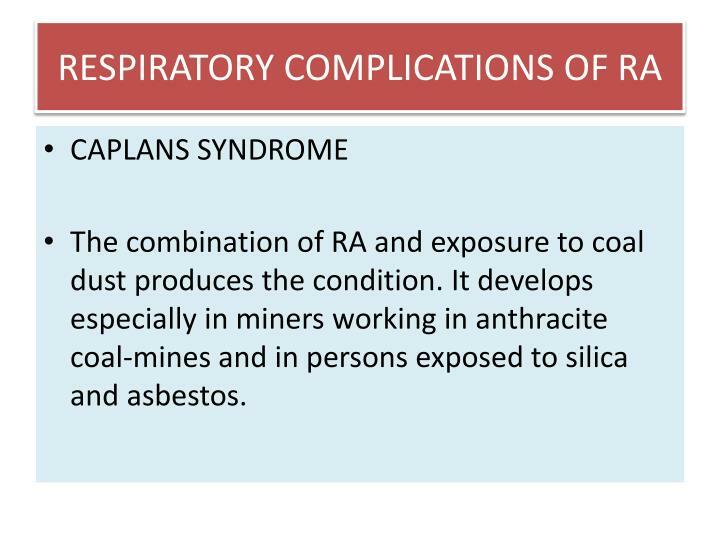 It develops especially in miners working in anthracite coal-mines and in persons exposed to silica and asbestos. 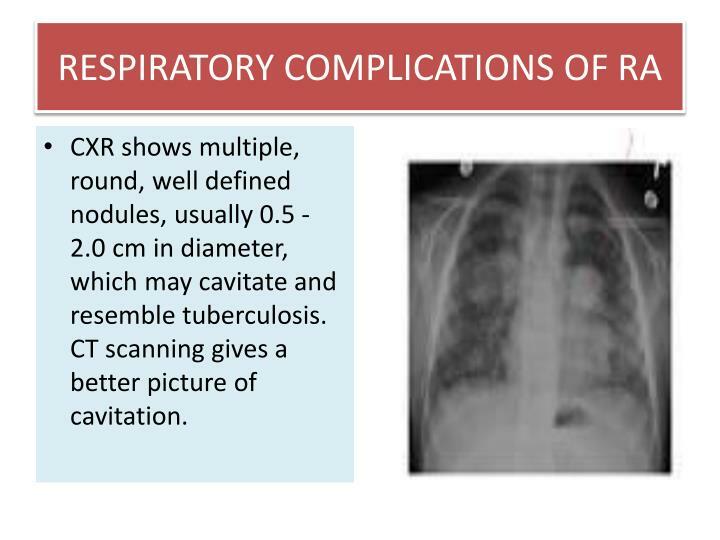 CXR shows multiple, round, well defined nodules, usually 0.5 - 2.0 cm in diameter, which may cavitate and resemble tuberculosis. CT scanning gives a better picture of cavitation. 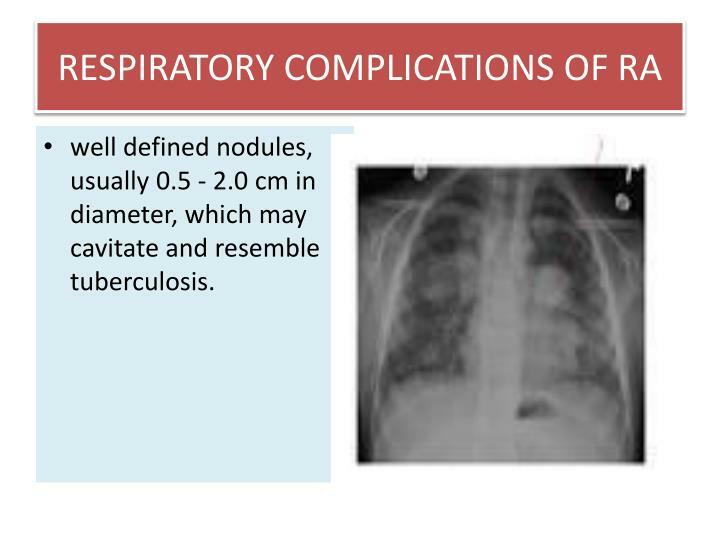 well defined nodules, usually 0.5 - 2.0 cm in diameter, which may cavitate and resemble tuberculosis. 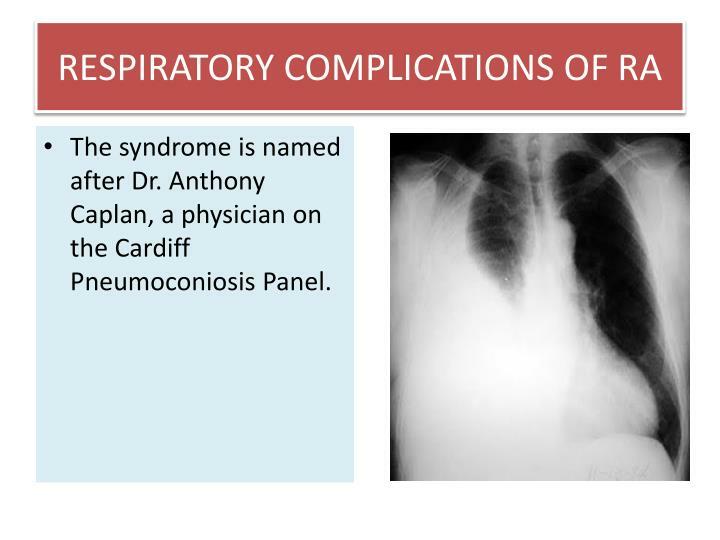 The syndrome is named after Dr. Anthony Caplan, a physician on the Cardiff Pneumoconiosis Panel. 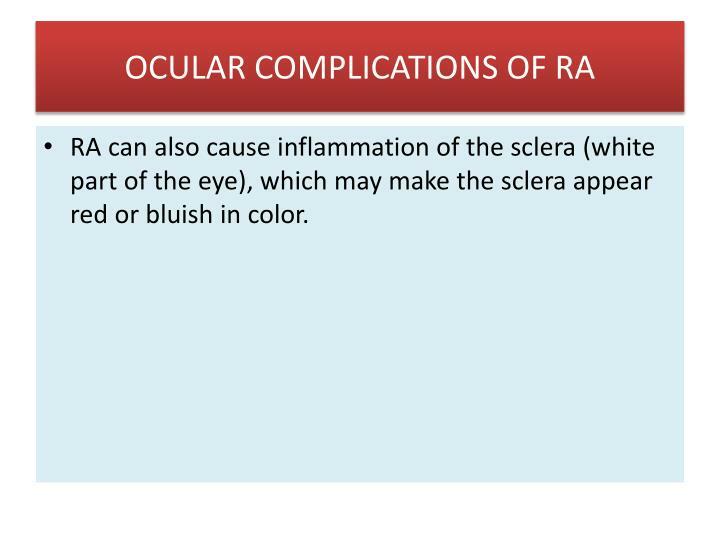 RA can also cause inflammation of the sclera (white part of the eye), which may make the sclera appear red or bluish in color. 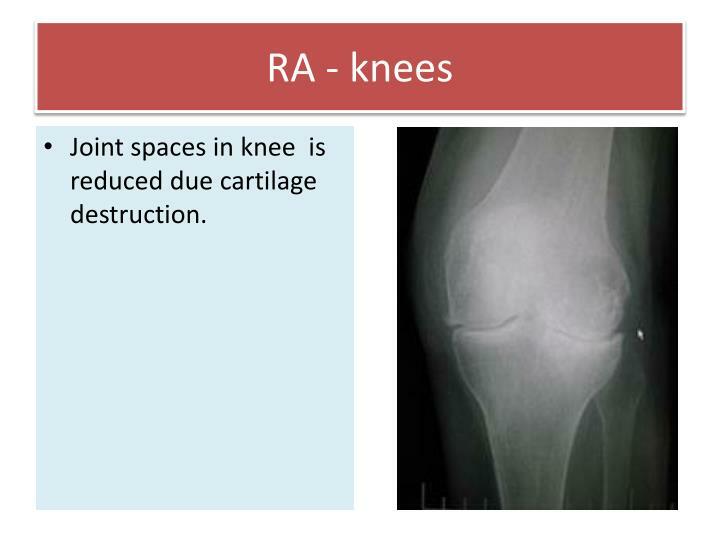 Joint spaces in knee is reduced due cartilage destruction. 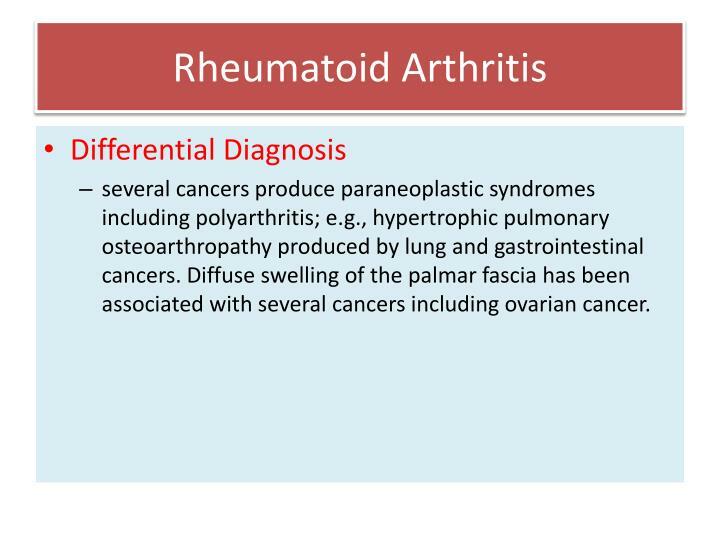 several cancers produce paraneoplastic syndromes including polyarthritis; e.g., hypertrophic pulmonary osteoarthropathy produced by lung and gastrointestinal cancers. 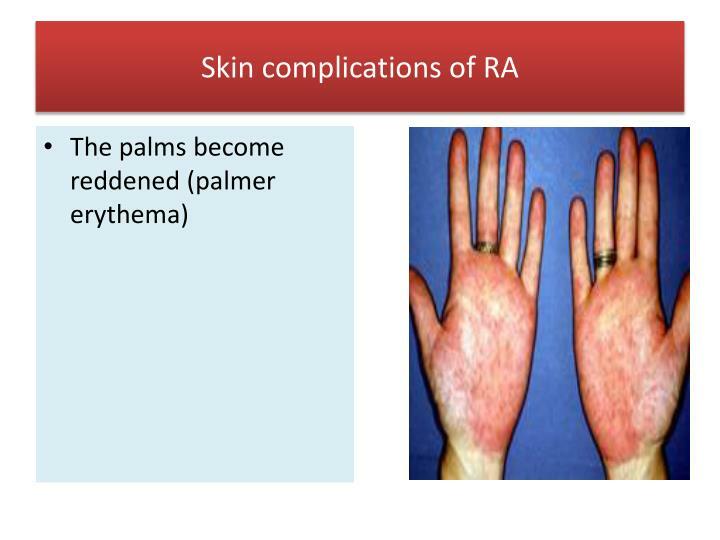 Diffuse swelling of the palmar fascia has been associated with several cancers including ovarian cancer. 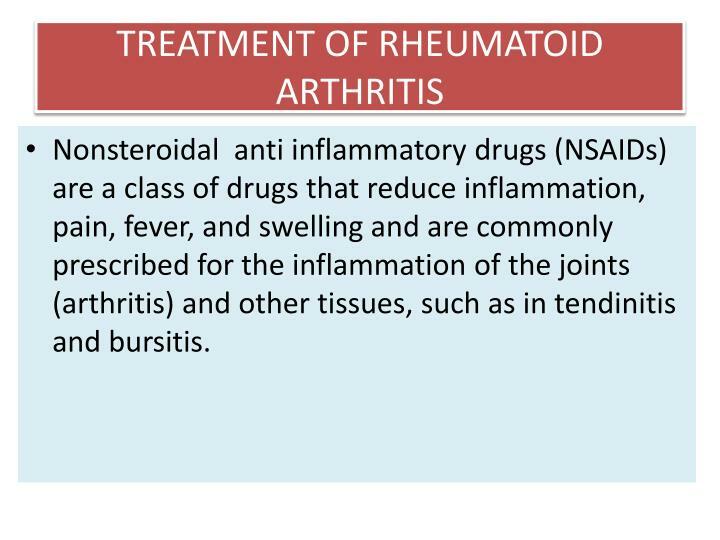 Nonsteroidal anti inflammatory drugs (NSAIDs) are a class of drugs that reduce inflammation, pain, fever, and swelling and are commonly prescribed for the inflammation of the joints (arthritis) and other tissues, such as in tendinitis and bursitis. 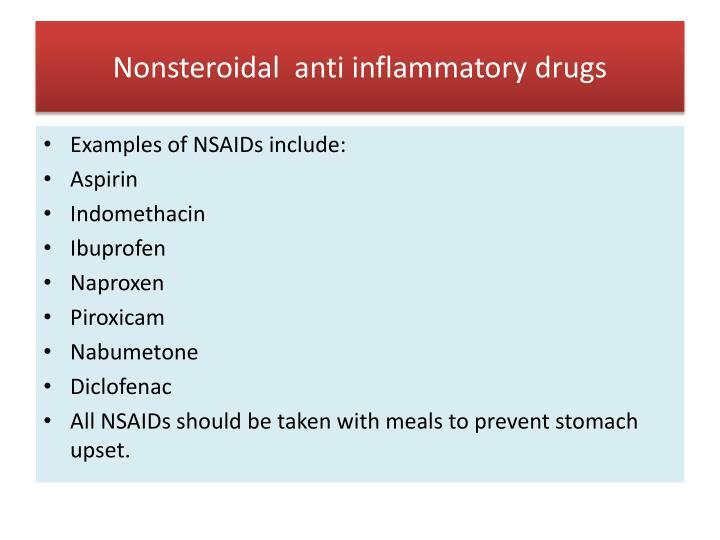 All NSAIDs should be taken with meals to prevent stomach upset. 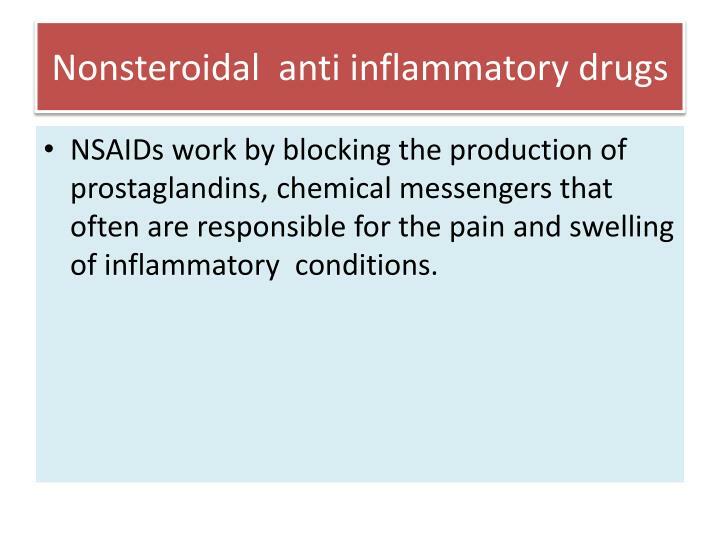 NSAIDs work by blocking the production of prostaglandins, chemical messengers that often are responsible for the pain and swelling of inflammatory conditions. Prostaglandins are made by two different enzymes, cyclooxygenase-1 (COX-1) and cyclooxygenase-2 (COX-2). The prostaglandins made by the two different enzymes have slightly different effects on the body. 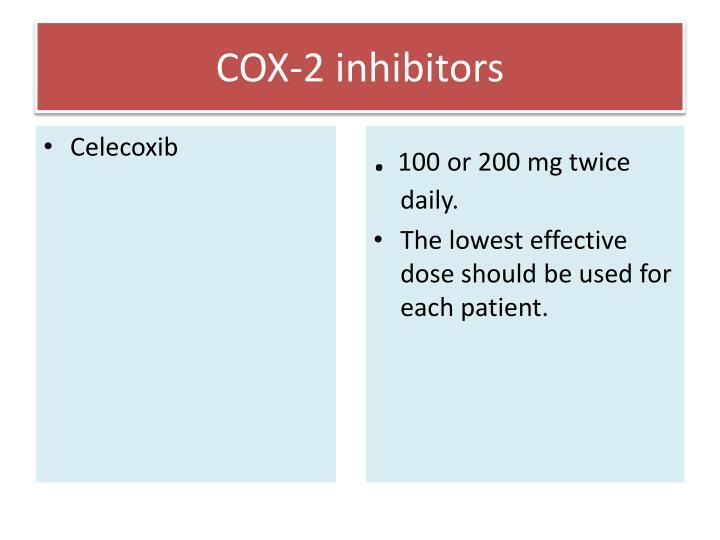 COX-2 inhibitors are NSAIDs that selectively block the COX-2 enzyme and not the COX-1 enzyme. Blocking this enzyme impedes the production of prostaglandins. 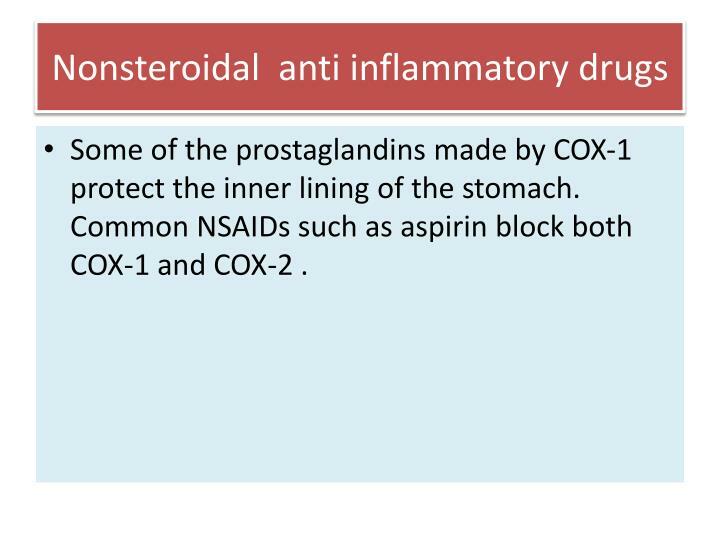 Some of the prostaglandins made by COX-1 protect the inner lining of the stomach. 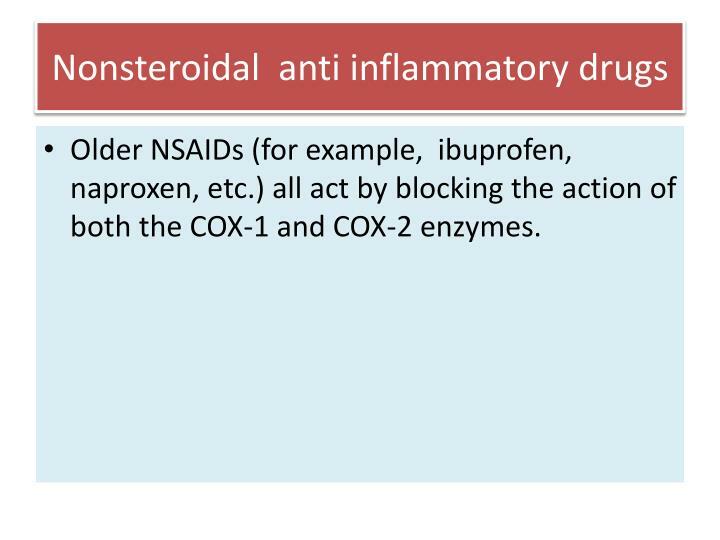 Common NSAIDs such as aspirin block both COX-1 and COX-2 . 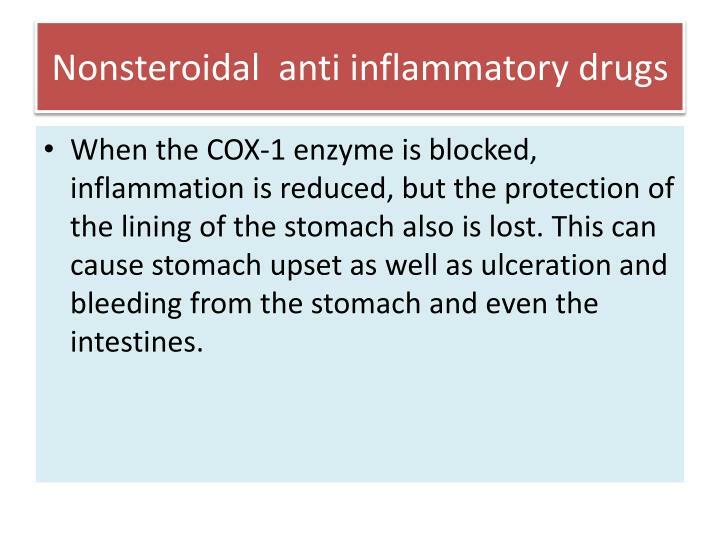 When the COX-1 enzyme is blocked, inflammation is reduced, but the protection of the lining of the stomach also is lost. 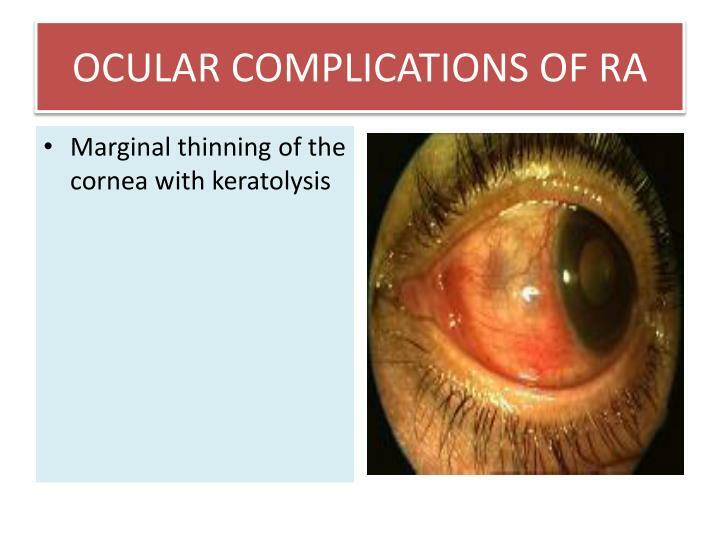 This can cause stomach upset as well as ulceration and bleeding from the stomach and even the intestines. 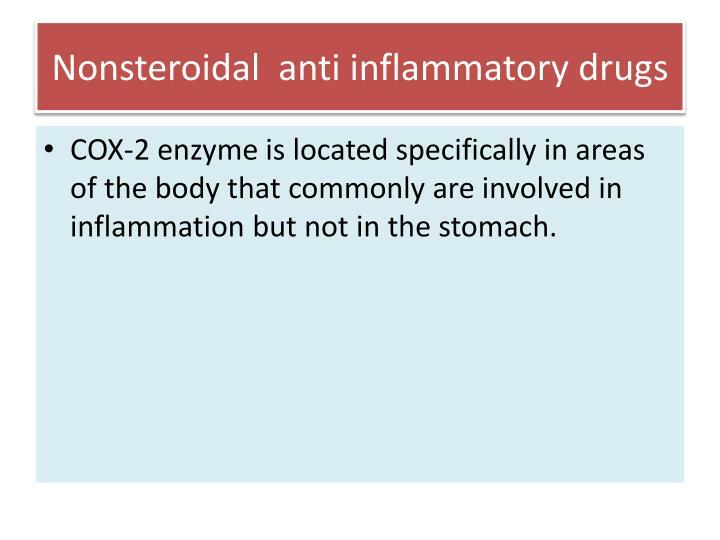 COX-2 enzyme is located specifically in areas of the body that commonly are involved in inflammation but not in the stomach. 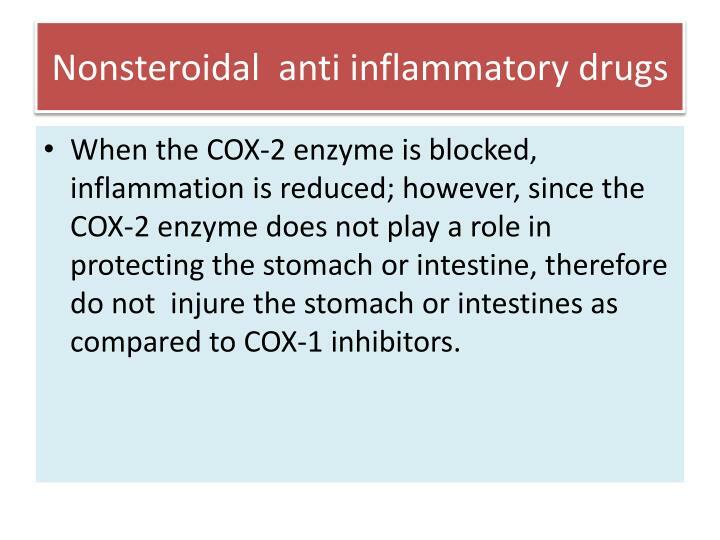 When the COX-2 enzyme is blocked, inflammation is reduced; however, since the COX-2 enzyme does not play a role in protecting the stomach or intestine, therefore do not injure the stomach or intestines as compared to COX-1 inhibitors. 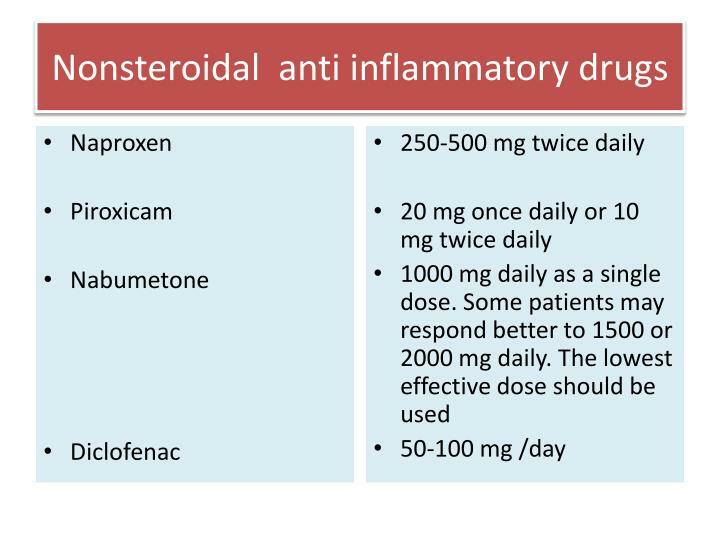 Older NSAIDs (for example, ibuprofen, naproxen, etc.) 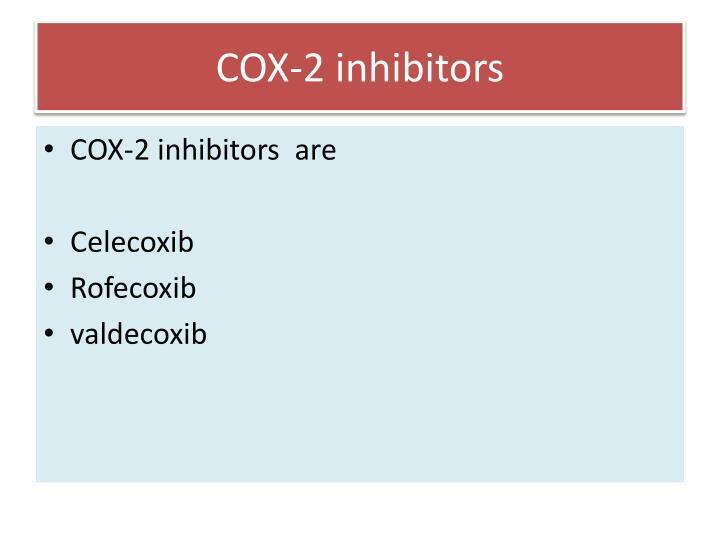 all act by blocking the action of both the COX-1 and COX-2 enzymes. 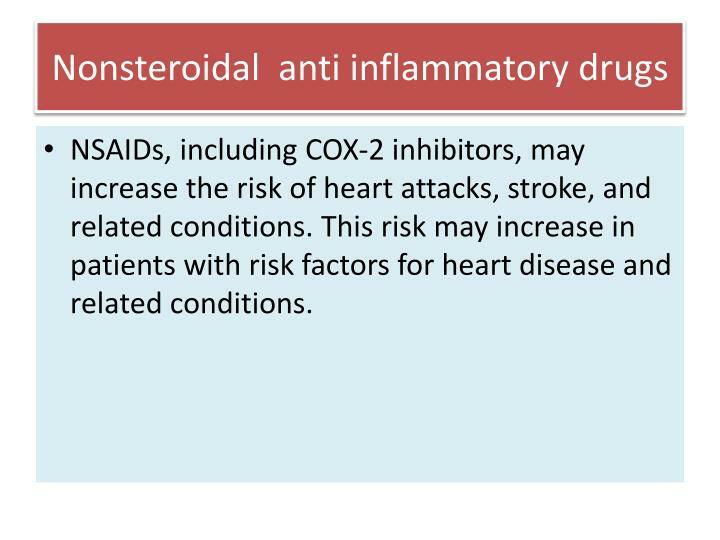 NSAIDs, including COX-2 inhibitors, may increase the risk of heart attacks, stroke, and related conditions. 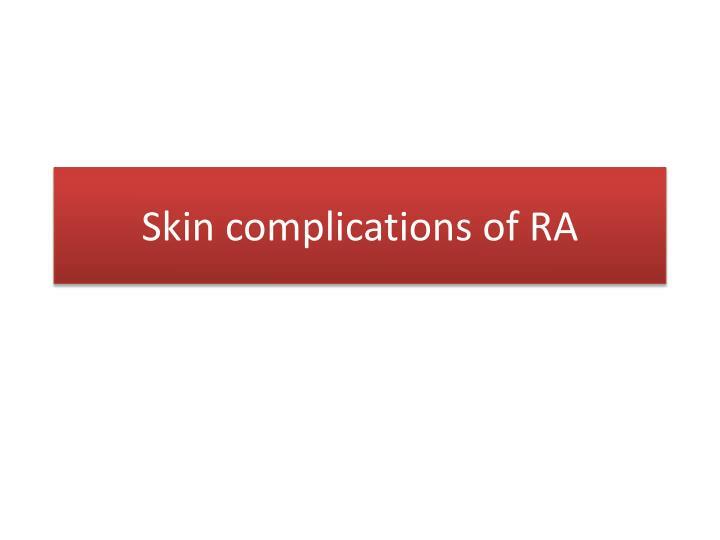 This risk may increase in patients with risk factors for heart disease and related conditions. 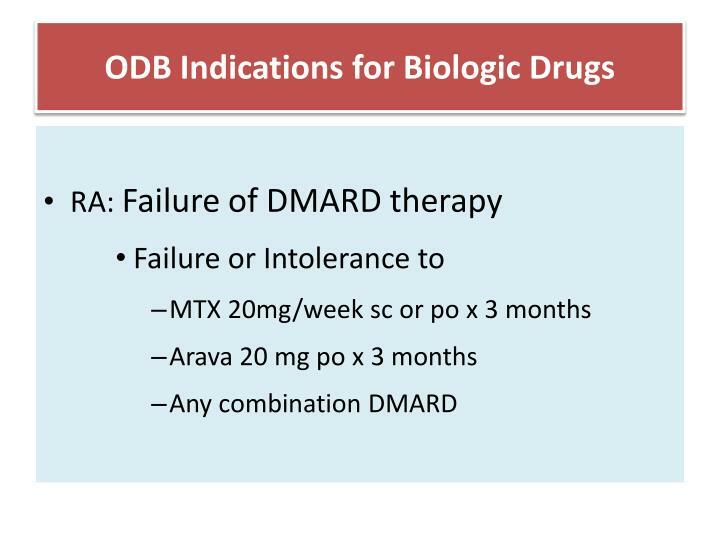 500-1000 mg every 6 hours or BD. Heart attacks are prevented with 50/75 or 325 mg daily. 200 or 400 mg every 6 hours. 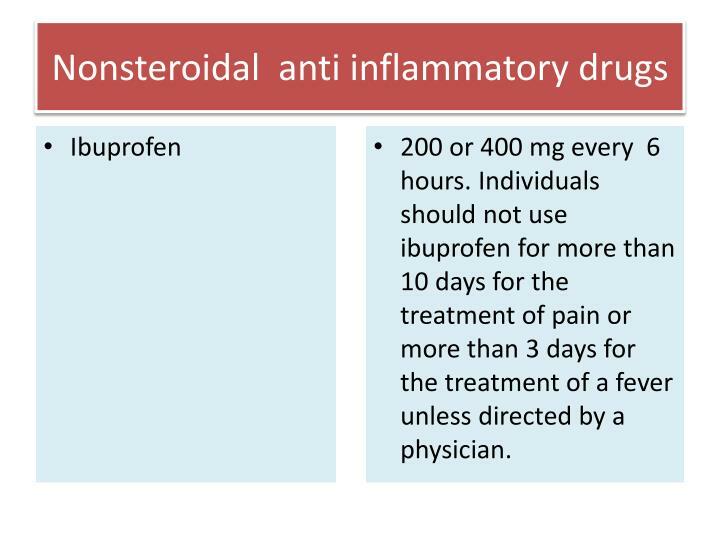 Individuals should not use ibuprofen for more than 10 days for the treatment of pain or more than 3 days for the treatment of a fever unless directed by a physician.
. 100 or 200 mg twice daily. 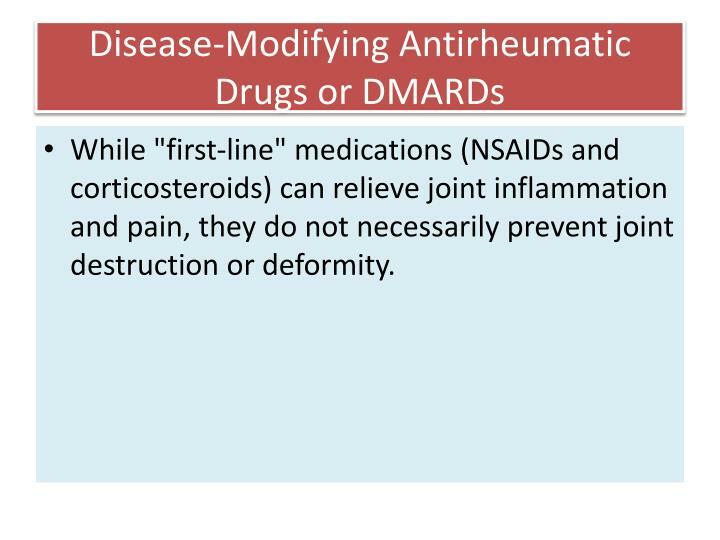 While "first-line" medications (NSAIDs and corticosteroids) can relieve joint inflammation and pain, they do not necessarily prevent joint destruction or deformity. 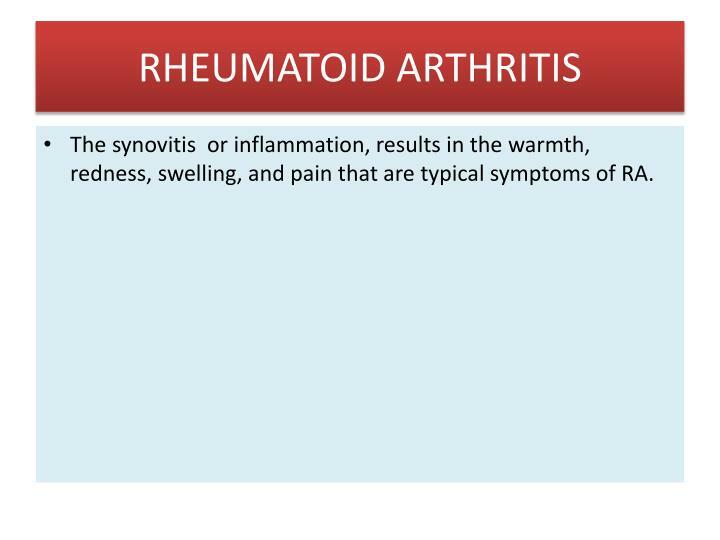 For patients with an aggressively destructive form of rheumatoid arthritis, medications other than NSAIDs and corticosteroids are needed. 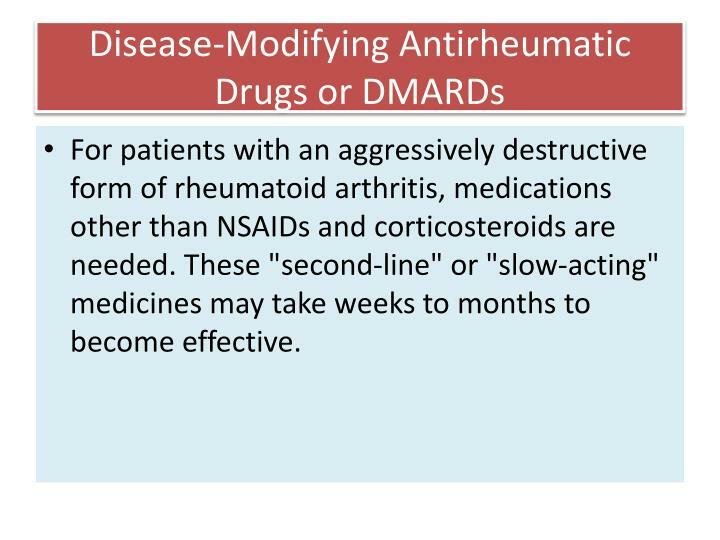 These "second-line" or "slow-acting" medicines may take weeks to months to become effective. They are used for long periods of time, even years, at varying doses. 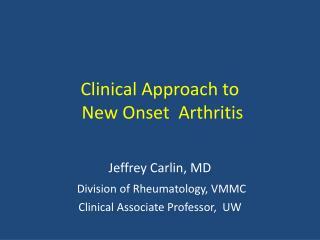 If effective, they can promote remission, thereby retarding the progression of joint destruction and deformity. 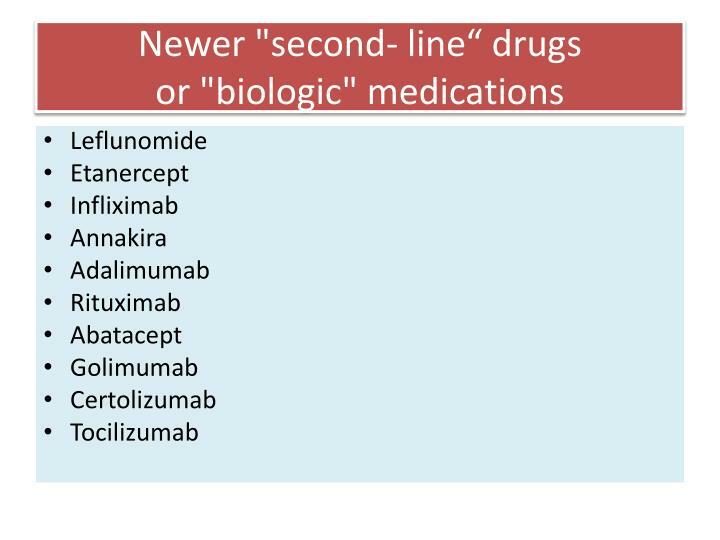 Sometimes a number of second-line medications are used together as combination therapy. 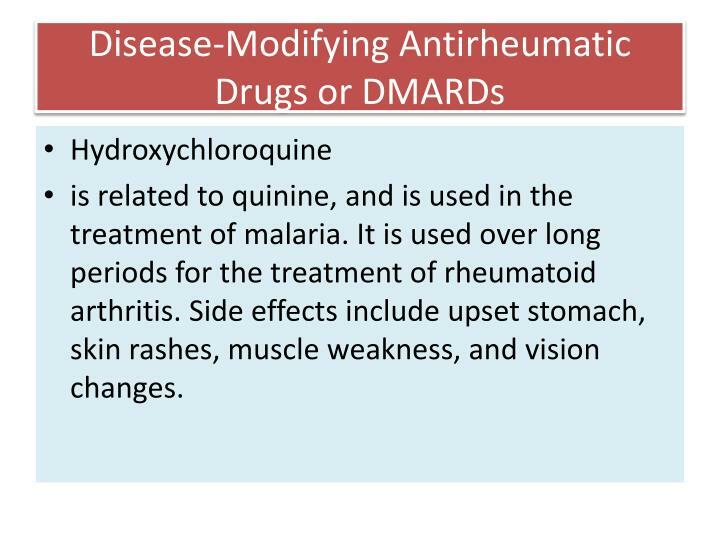 is related to quinine, and is used in the treatment of malaria. 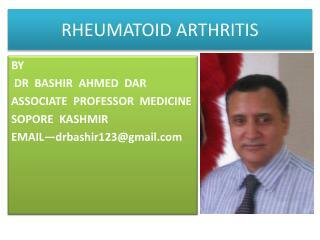 It is used over long periods for the treatment of rheumatoid arthritis. 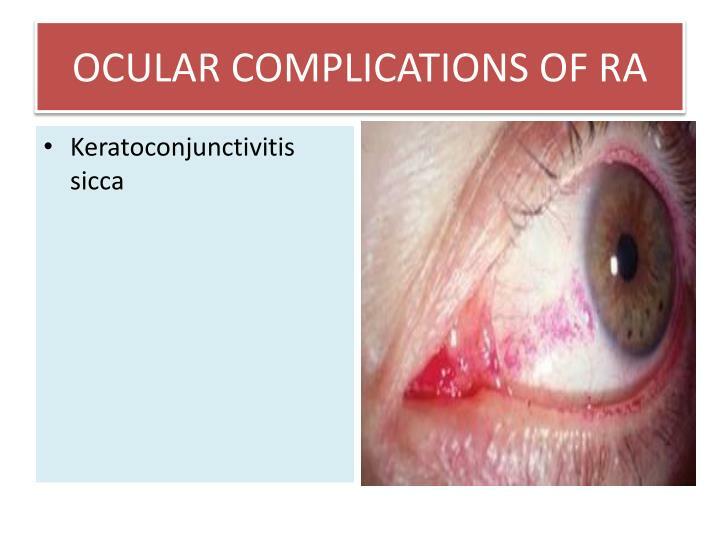 Side effects include upset stomach, skin rashes, muscle weakness, and vision changes. 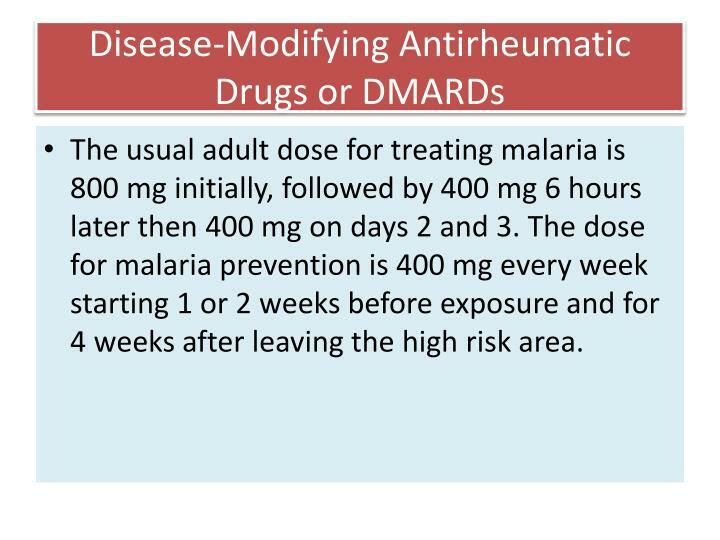 The usual adult dose for treating malaria is 800 mg initially, followed by 400 mg 6 hours later then 400 mg on days 2 and 3. The dose for malaria prevention is 400 mg every week starting 1 or 2 weeks before exposure and for 4 weeks after leaving the high risk area. 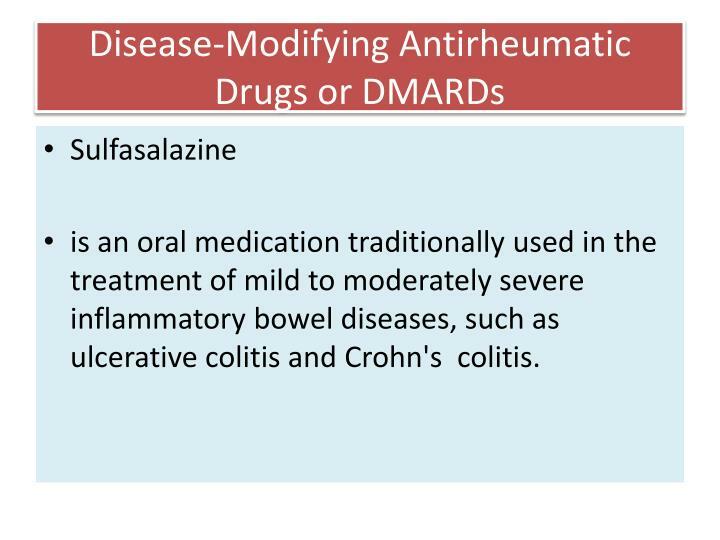 is an oral medication traditionally used in the treatment of mild to moderately severe inflammatory bowel diseases, such as ulcerative colitis and Crohn's colitis. 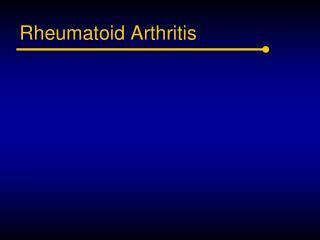 Sulfasalazine is used to treat rheumatoid arthritis in combination with anti- inflammatory medications. 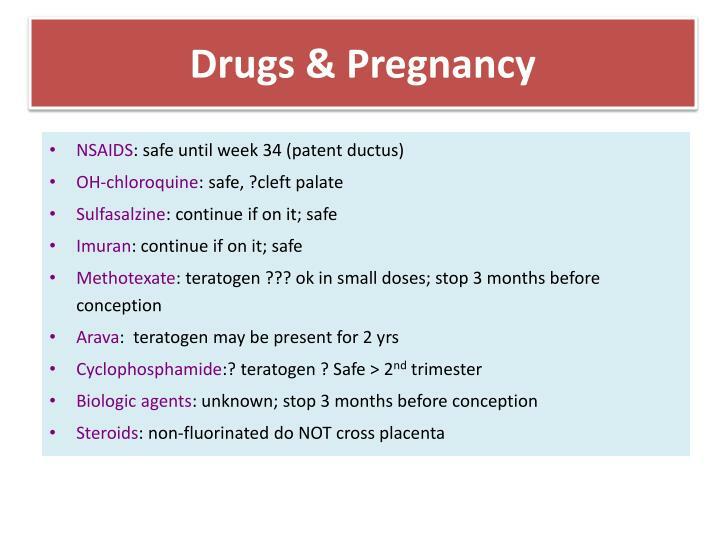 Sulfasalazine is generally well tolerated. Common side effects include rash and upset stomach. 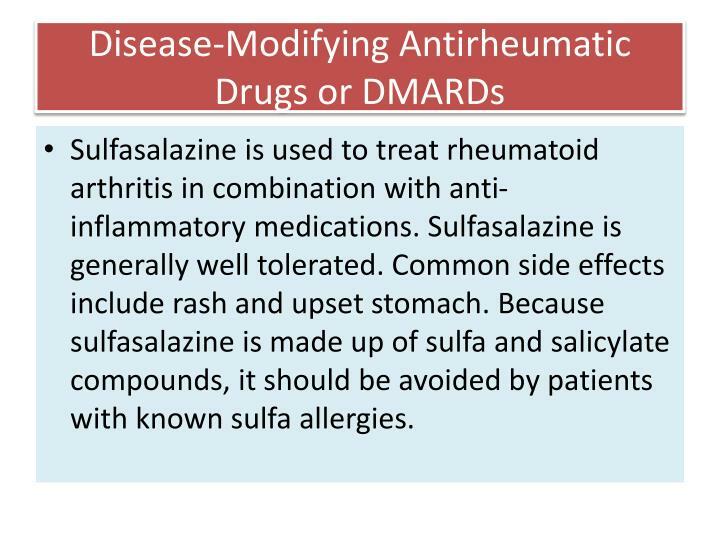 Because sulfasalazine is made up of sulfa and salicylate compounds, it should be avoided by patients with known sulfa allergies. 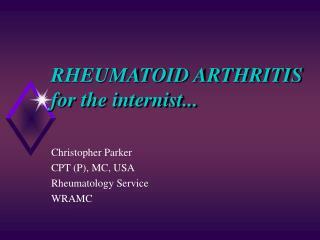 have been used to treat rheumatoid arthritis throughout most of this century. 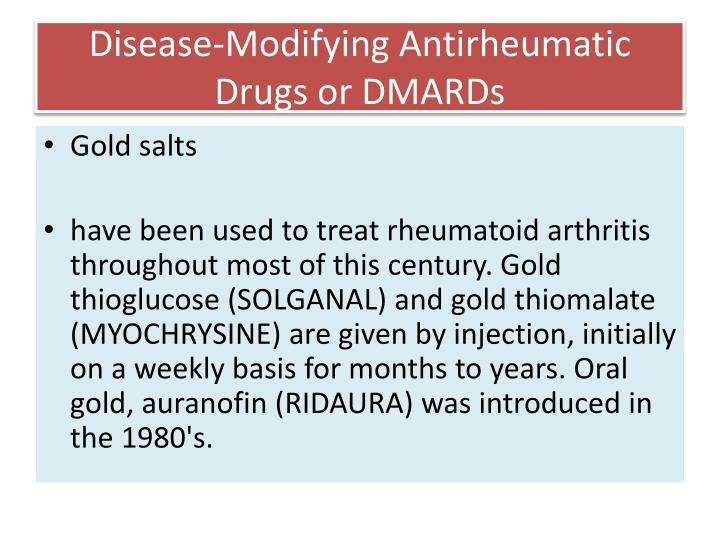 Gold thioglucose (SOLGANAL) and gold thiomalate (MYOCHRYSINE) are given by injection, initially on a weekly basis for months to years. Oral gold, auranofin (RIDAURA) was introduced in the 1980's. 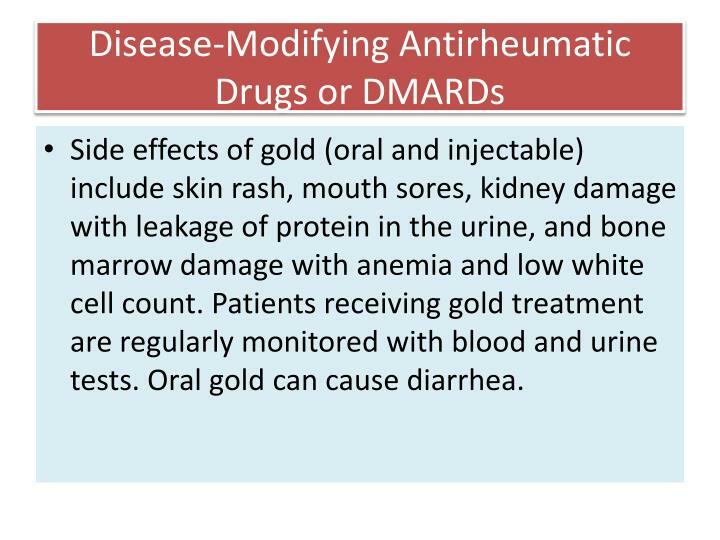 Side effects of gold (oral and injectable) include skin rash, mouth sores, kidney damage with leakage of protein in the urine, and bone marrow damage with anemia and low white cell count. 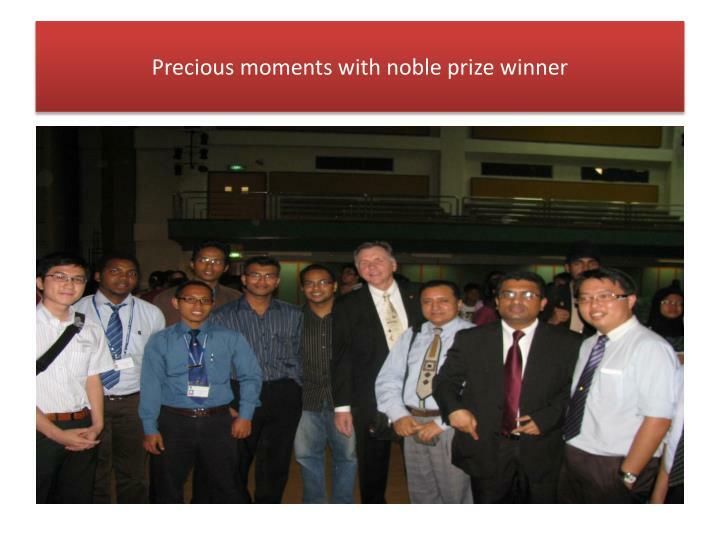 Patients receiving gold treatment are regularly monitored with blood and urine tests. Oral gold can cause diarrhea. 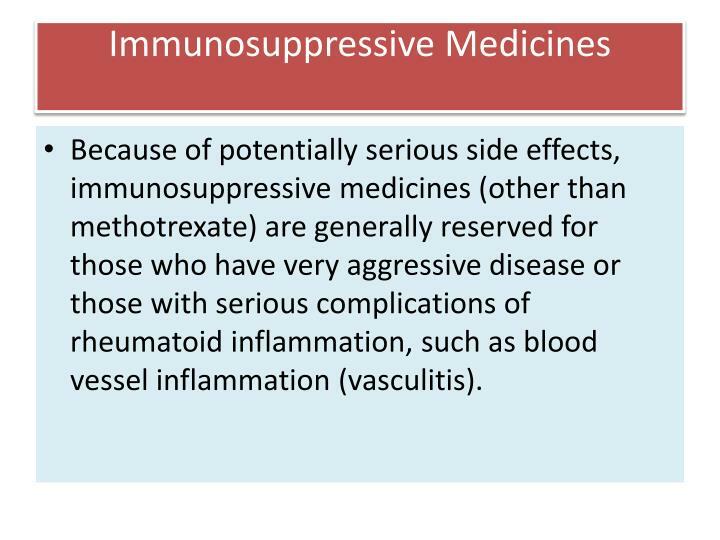 Because of potentially serious side effects, immunosuppressive medicines (other than methotrexate) are generally reserved for those who have very aggressive disease or those with serious complications of rheumatoid inflammation, such as blood vessel inflammation (vasculitis). 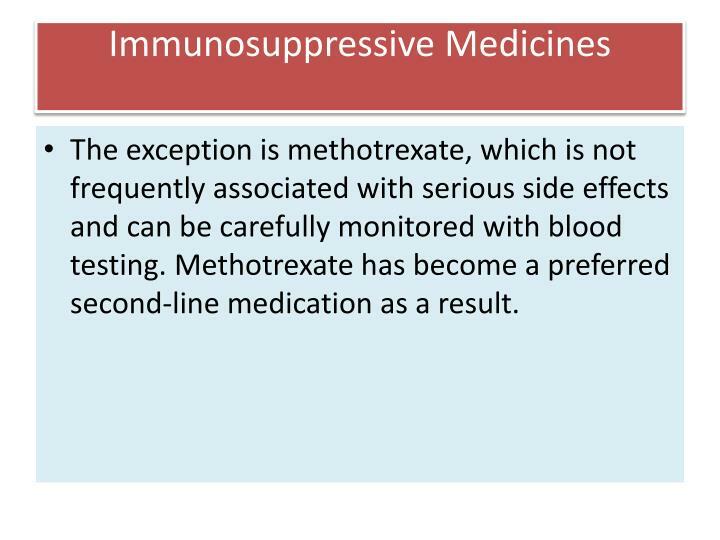 Methotrexate may be taken with or without food.7.5 mg dose weekly. 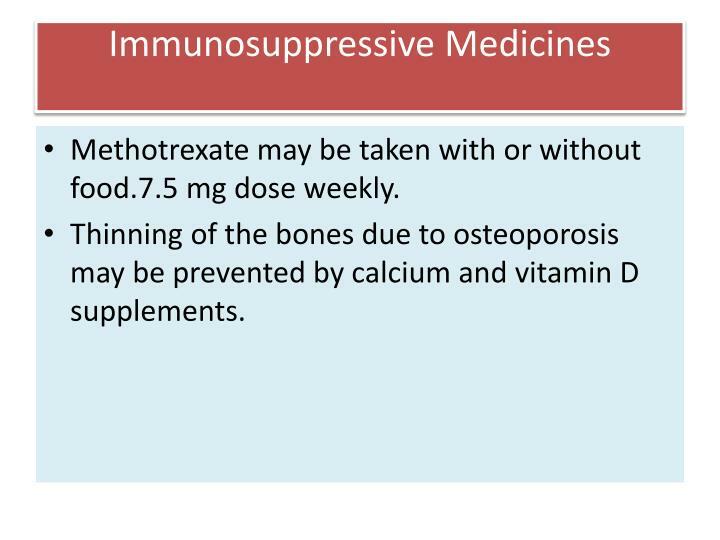 Thinning of the bones due to osteoporosis may be prevented by calcium and vitamin D supplements. 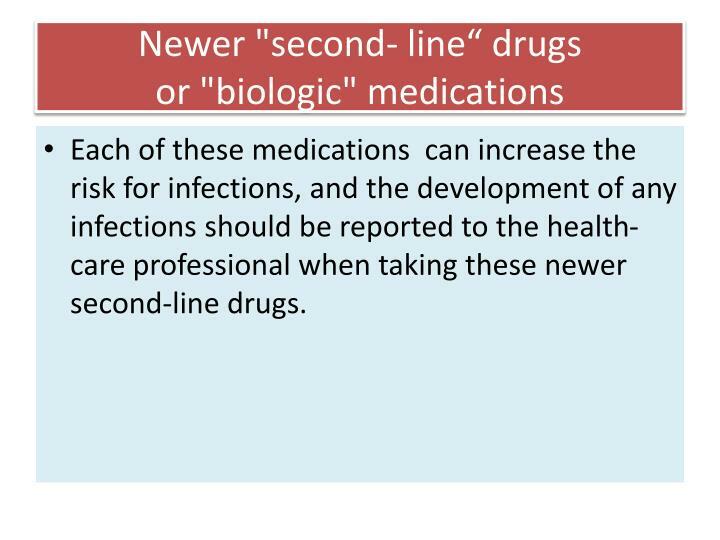 Each of these medications can increase the risk for infections, and the development of any infections should be reported to the health-care professional when taking these newer second-line drugs. 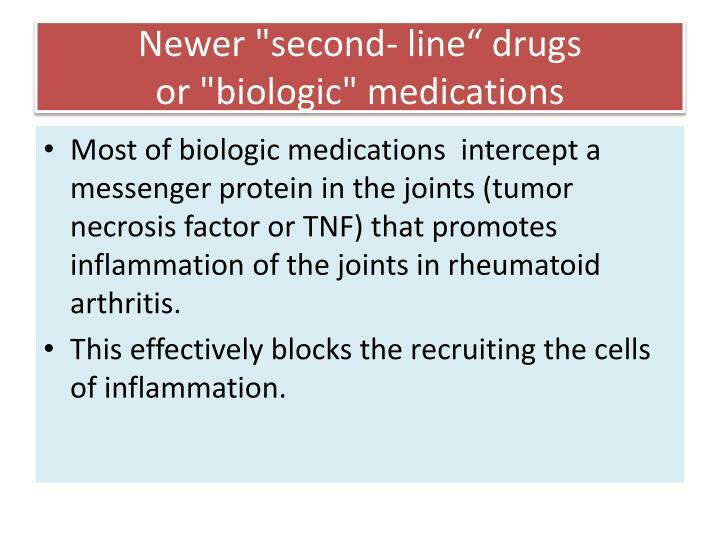 Most of biologic medications intercept a messenger protein in the joints (tumor necrosis factor or TNF) that promotes inflammation of the joints in rheumatoid arthritis. This effectively blocks the recruiting the cells of inflammation. 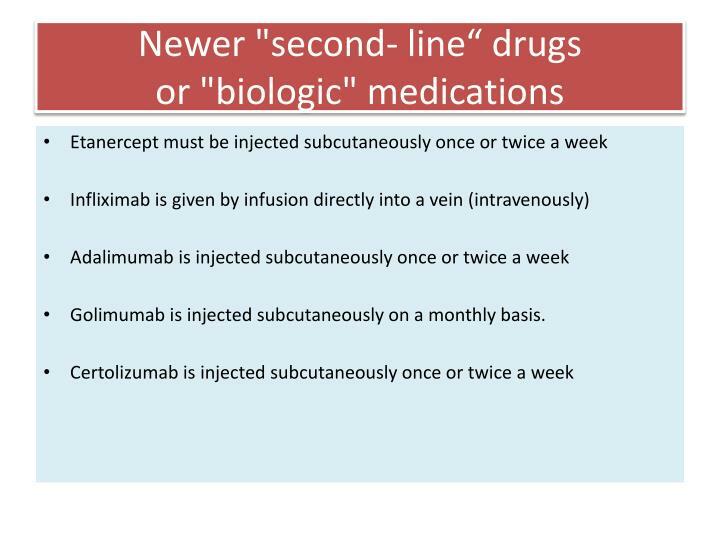 Golimumab is injected subcutaneously on a monthly basis. 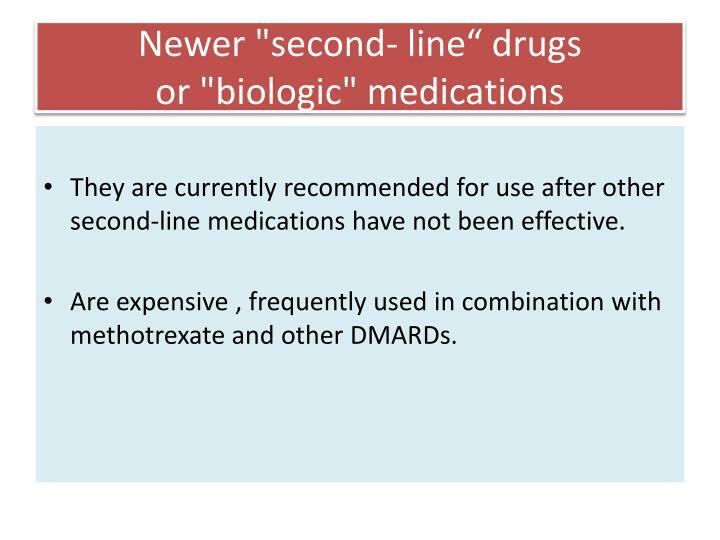 They are currently recommended for use after other second-line medications have not been effective. 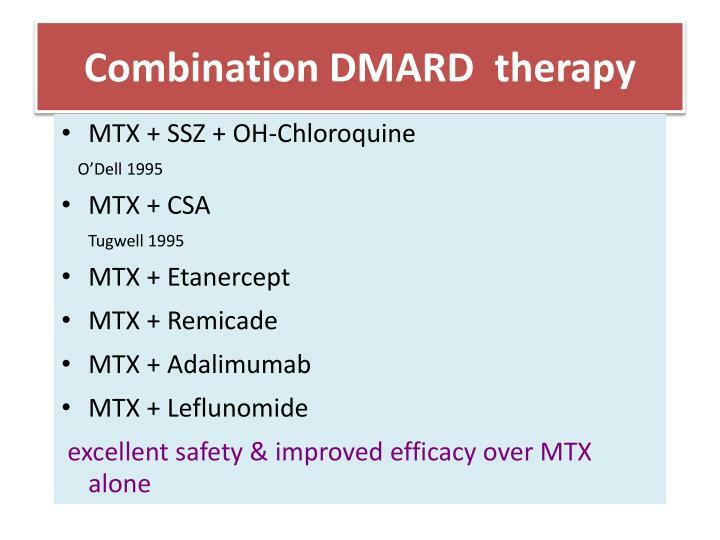 Are expensive , frequently used in combination with methotrexate and other DMARDs. 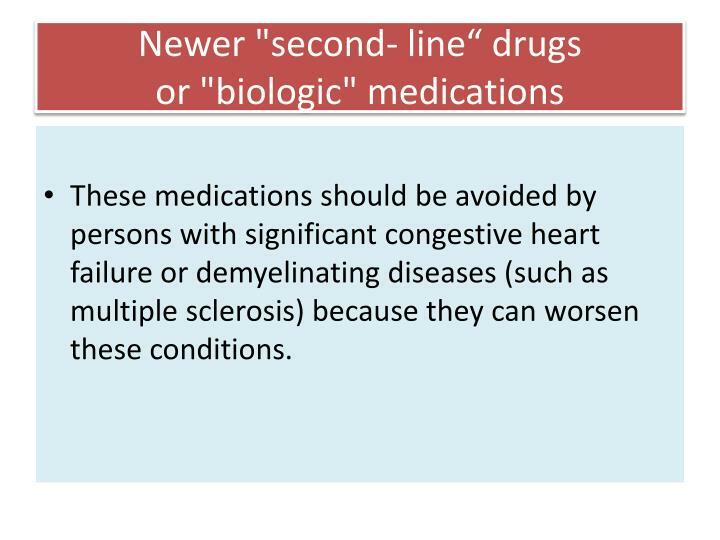 These medications should be avoided by persons with significant congestive heart failure or demyelinating diseases (such as multiple sclerosis) because they can worsen these conditions. 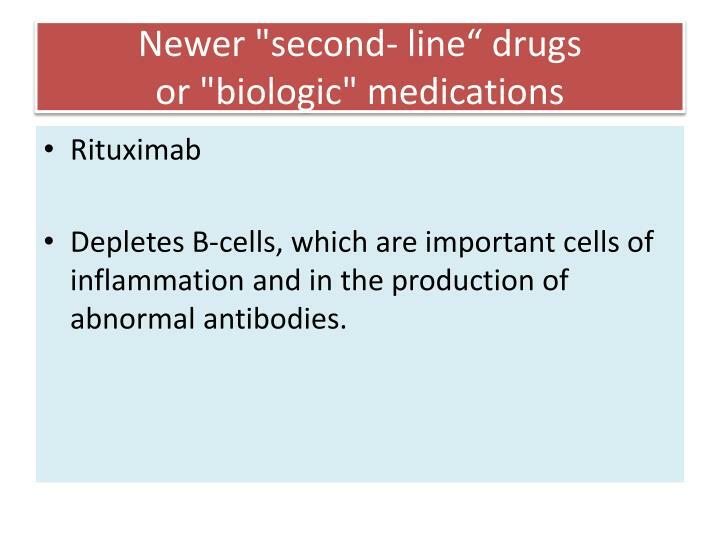 Depletes B-cells, which are important cells of inflammation and in the production of abnormal antibodies. 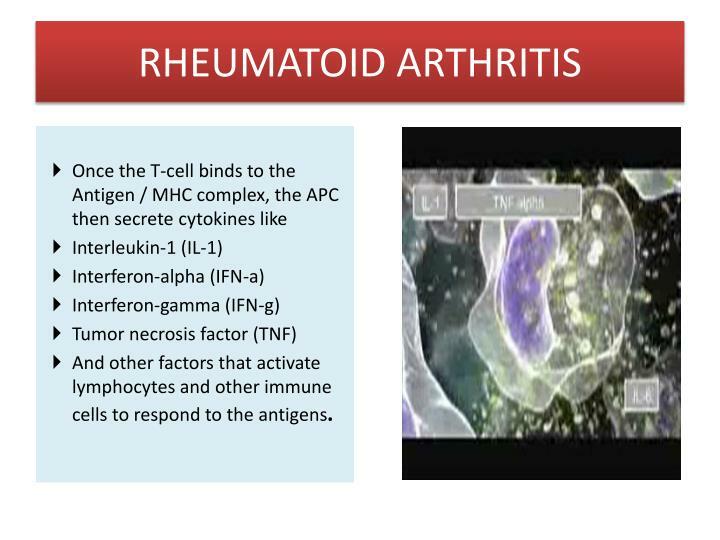 Prevents the activation of the T-lymphocytes and blocks both the production of new T-lymphocytes and the production of the chemicals that destroy tissue and cause the symptoms and signs of arthritis. 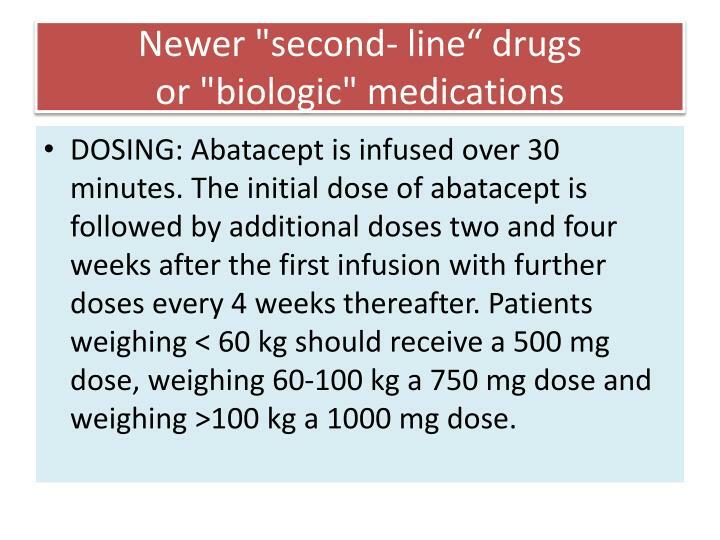 DOSING: Abatacept is infused over 30 minutes. 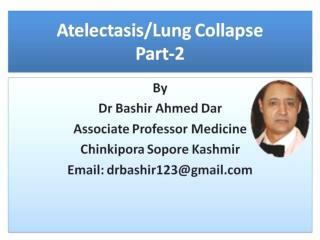 The initial dose of abatacept is followed by additional doses two and four weeks after the first infusion with further doses every 4 weeks thereafter. 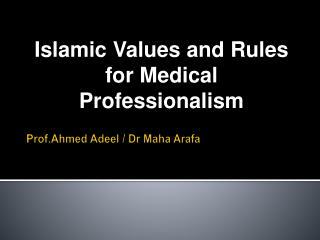 Patients weighing < 60 kg should receive a 500 mg dose, weighing 60-100 kg a 750 mg dose and weighing >100 kg a 1000 mg dose. 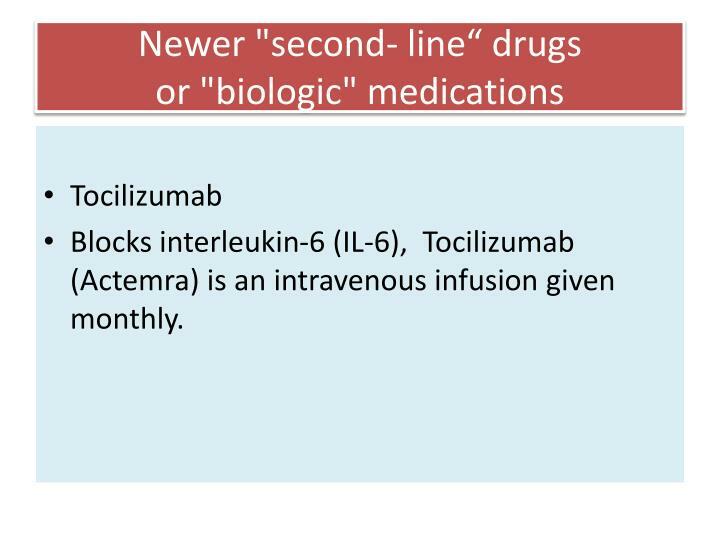 Blocks interleukin-6 (IL-6), Tocilizumab (Actemra) is an intravenous infusion given monthly. 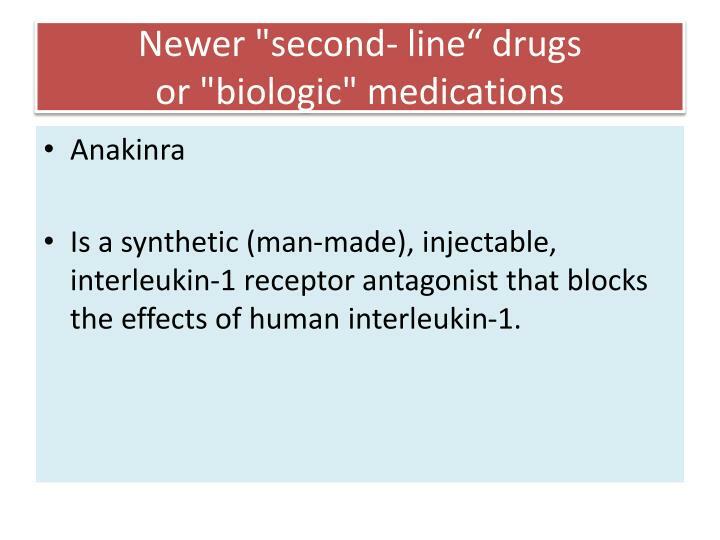 Is a synthetic (man-made), injectable, interleukin-1 receptor antagonist that blocks the effects of human interleukin-1. 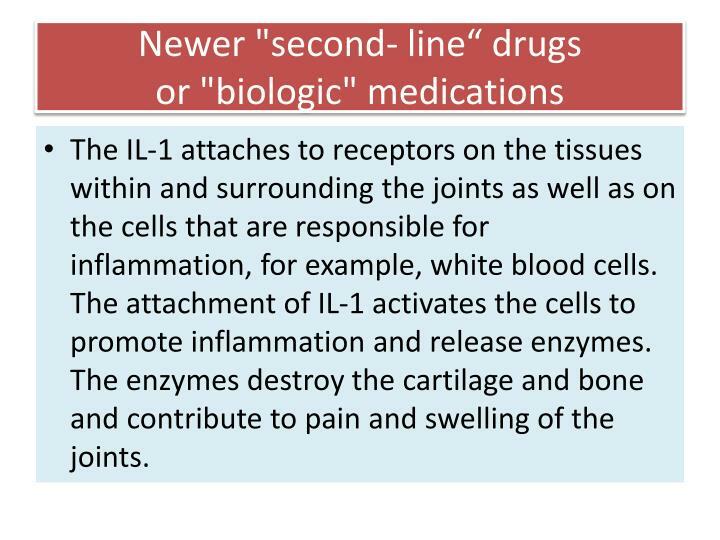 The IL-1 attaches to receptors on the tissues within and surrounding the joints as well as on the cells that are responsible for inflammation, for example, white blood cells. 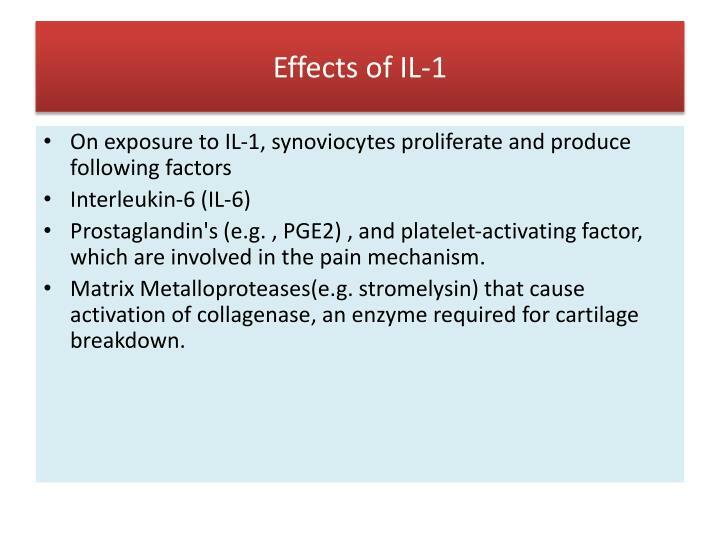 The attachment of IL-1 activates the cells to promote inflammation and release enzymes. The enzymes destroy the cartilage and bone and contribute to pain and swelling of the joints. 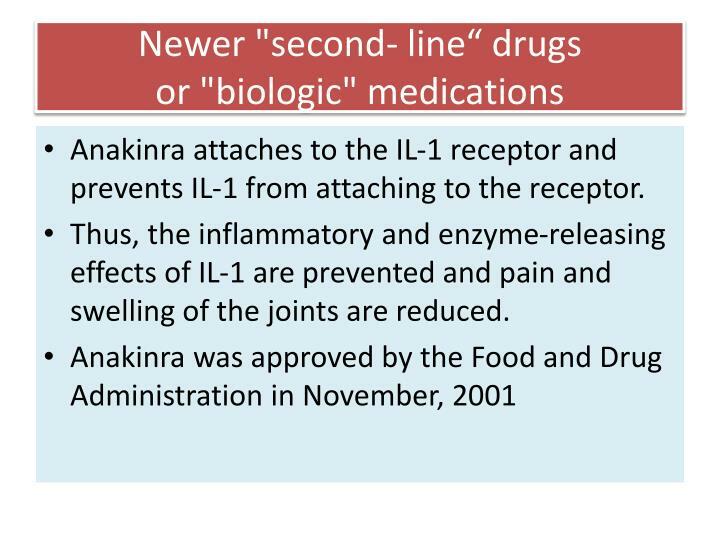 Anakinra attaches to the IL-1 receptor and prevents IL-1 from attaching to the receptor. 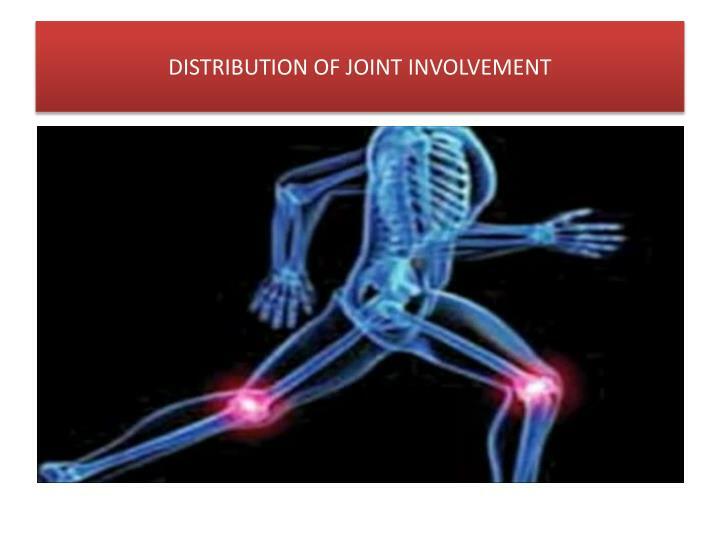 Thus, the inflammatory and enzyme-releasing effects of IL-1 are prevented and pain and swelling of the joints are reduced. 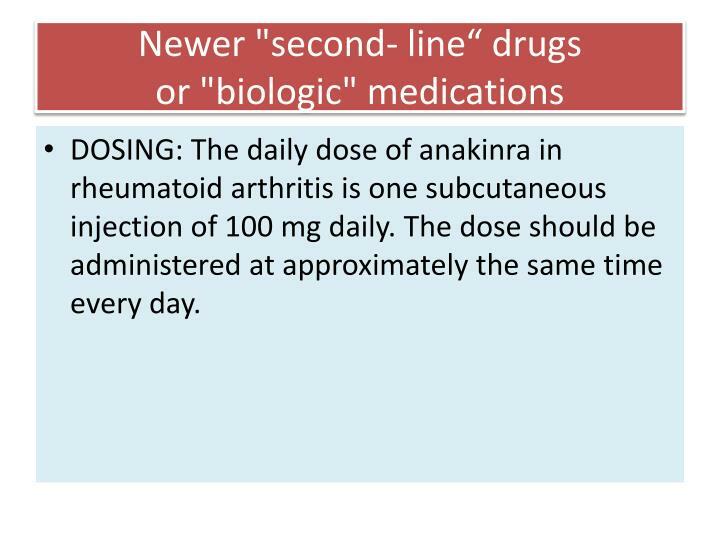 DOSING: The daily dose of anakinra in rheumatoid arthritis is one subcutaneous injection of 100 mg daily. The dose should be administered at approximately the same time every day. 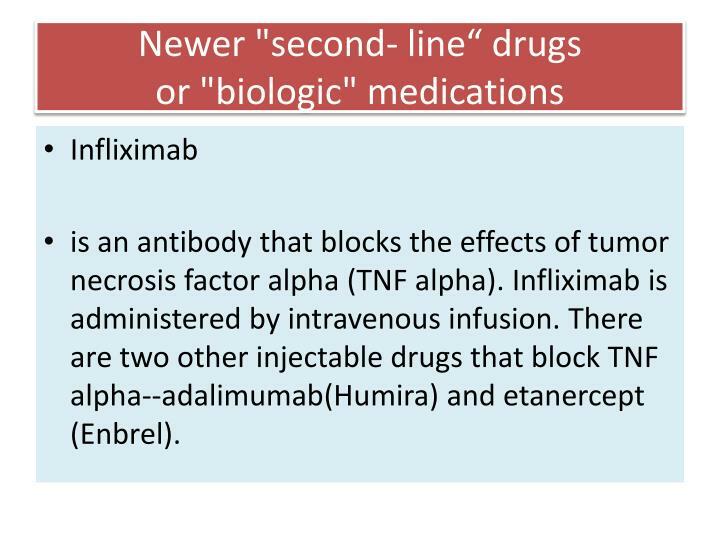 is an antibody that blocks the effects of tumor necrosis factor alpha (TNF alpha). Infliximab is administered by intravenous infusion. 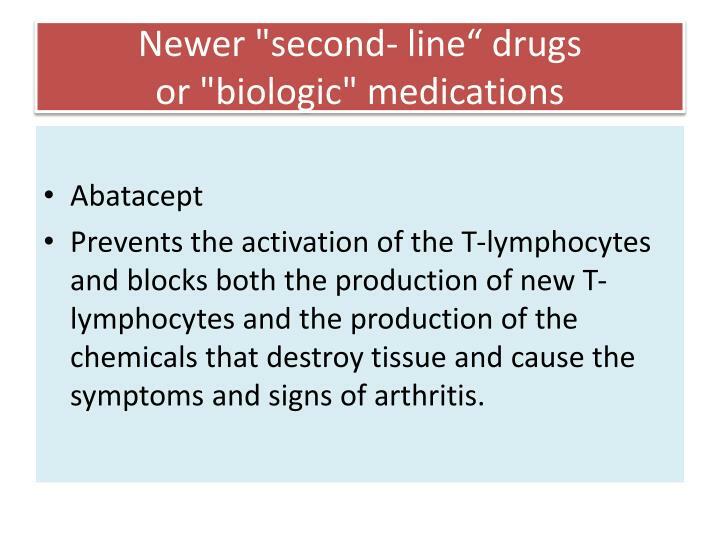 There are two other injectable drugs that block TNF alpha--adalimumab(Humira) and etanercept (Enbrel). 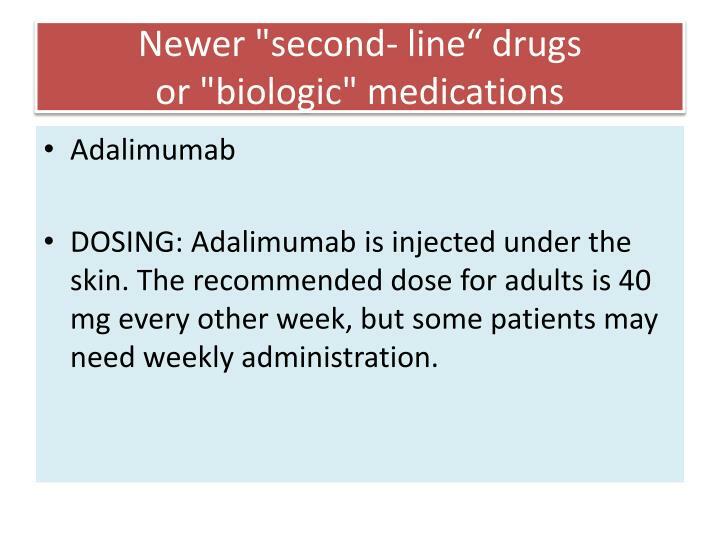 DOSING: Adalimumab is injected under the skin. 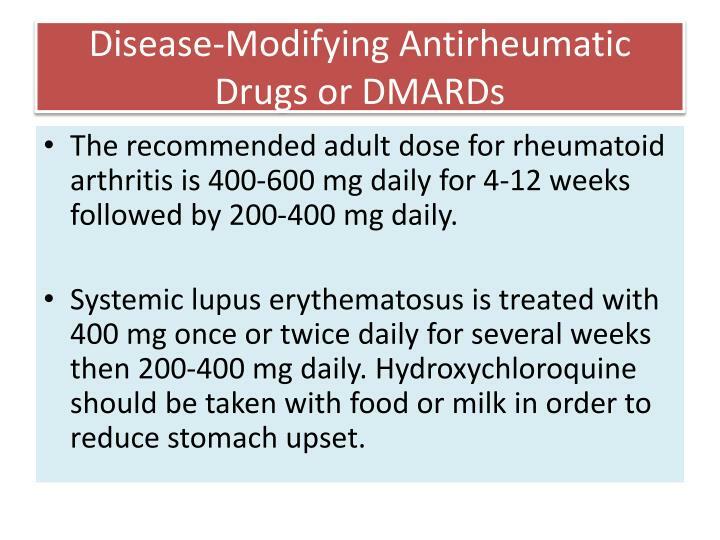 The recommended dose for adults is 40 mg every other week, but some patients may need weekly administration. DOSING: Infliximab is administered intravenously. 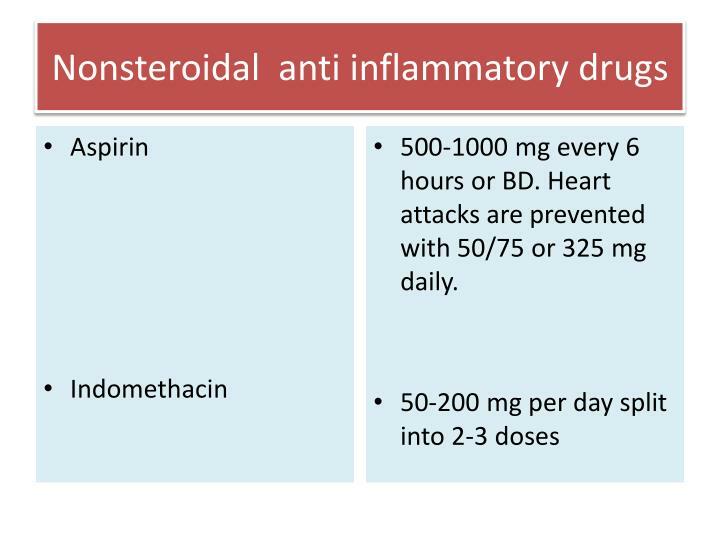 For moderate to severe Crohn's disease the dose is 5 mg/kg administered as a single dose. 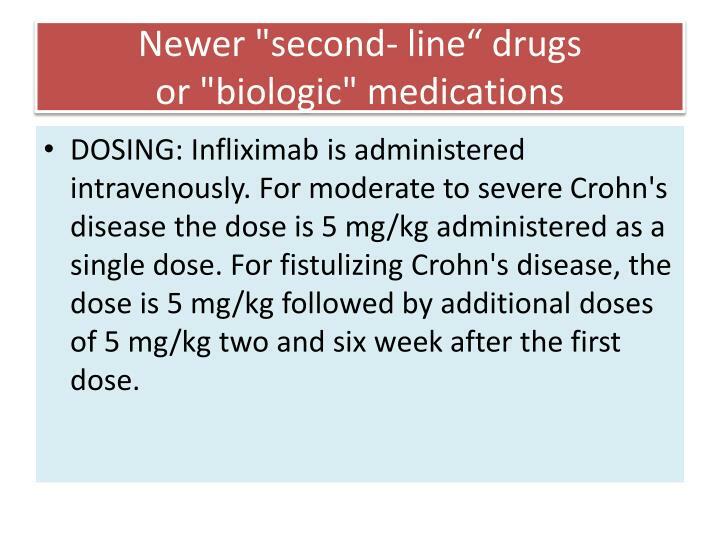 For fistulizing Crohn's disease, the dose is 5 mg/kg followed by additional doses of 5 mg/kg two and six week after the first dose. The recommended dose for the treatment of rheumatoid arthritis is 3 mg/kg as a single dose. 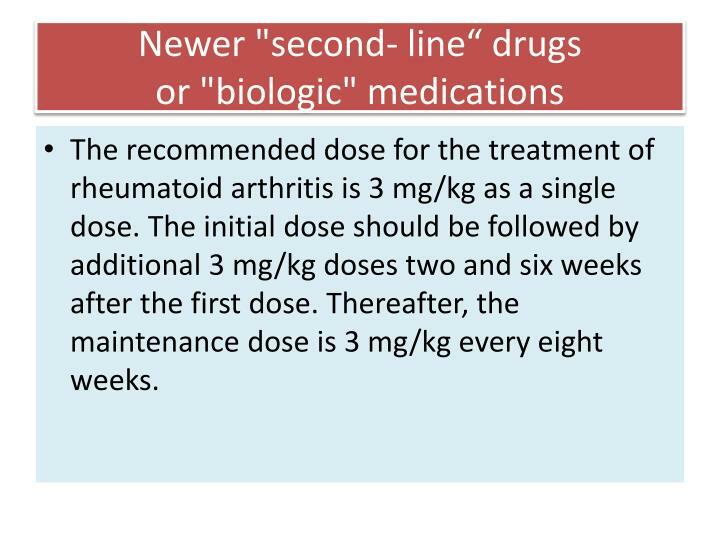 The initial dose should be followed by additional 3 mg/kg doses two and six weeks after the first dose. 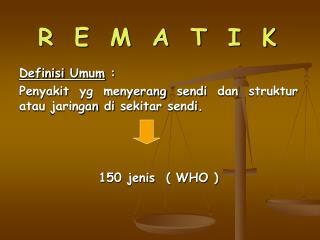 Thereafter, the maintenance dose is 3 mg/kg every eight weeks. 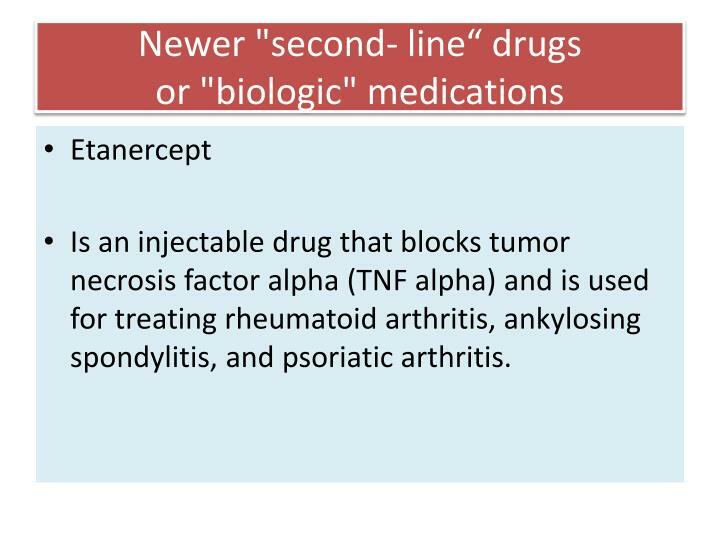 Is an injectable drug that blocks tumor necrosis factor alpha (TNF alpha) and is used for treating rheumatoid arthritis, ankylosing spondylitis, and psoriatic arthritis. 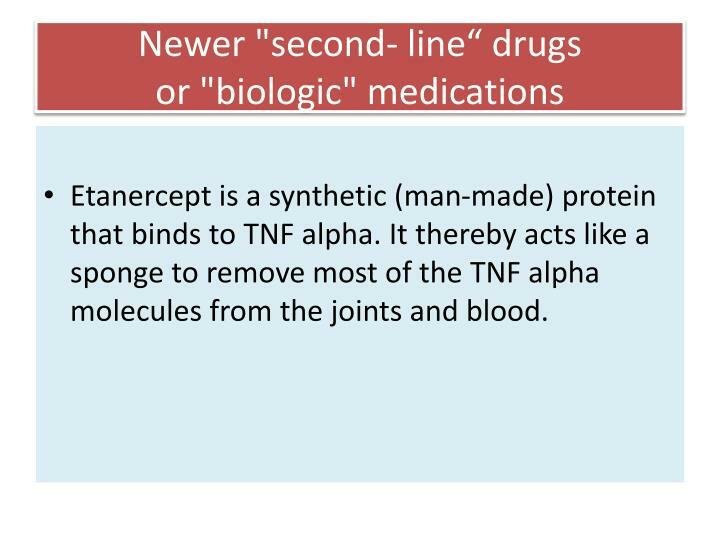 Etanercept is a synthetic (man-made) protein that binds to TNF alpha. 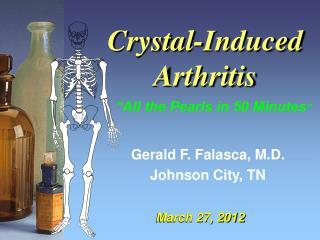 It thereby acts like a sponge to remove most of the TNF alpha molecules from the joints and blood. 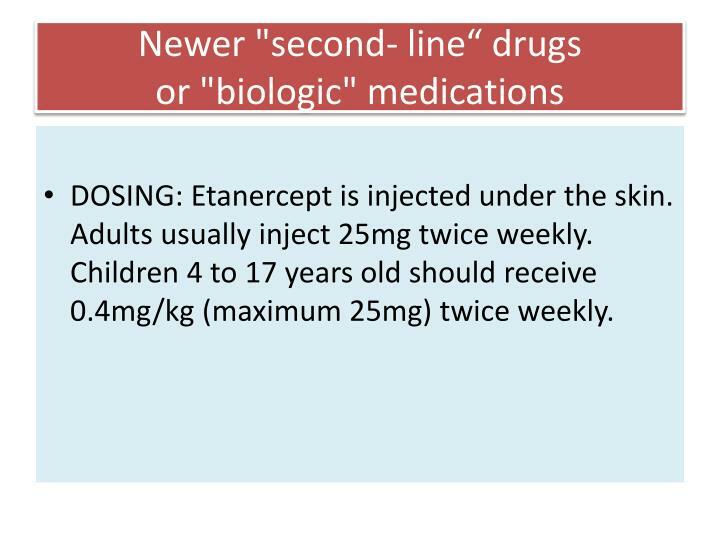 DOSING: Etanercept is injected under the skin. Adults usually inject 25mg twice weekly. 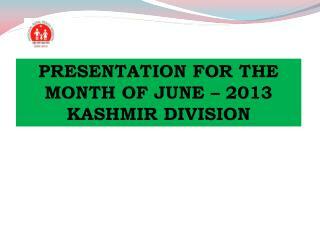 Children 4 to 17 years old should receive 0.4mg/kg (maximum 25mg) twice weekly. 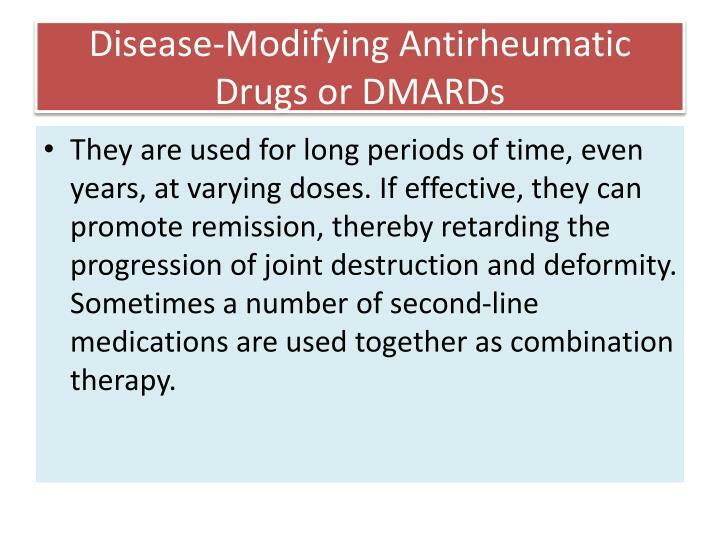 While biologic medications are often combined with traditional DMARDs in the treatment of rheumatoid arthritis. 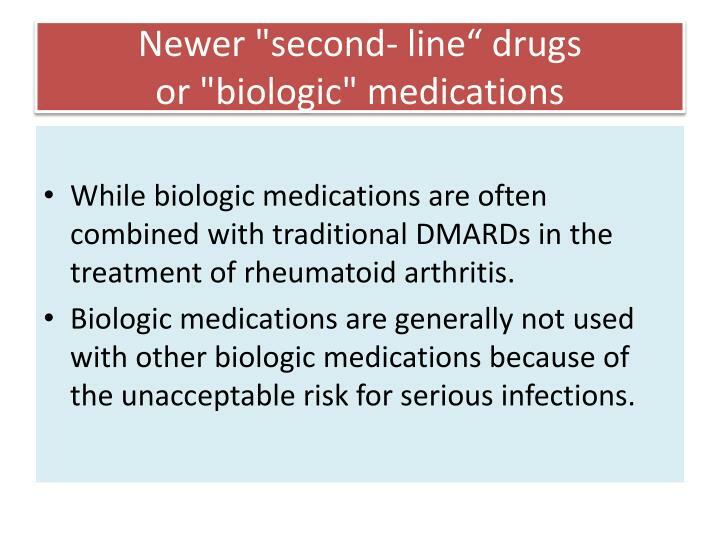 Biologic medications are generally not used with other biologic medications because of the unacceptable risk for serious infections. 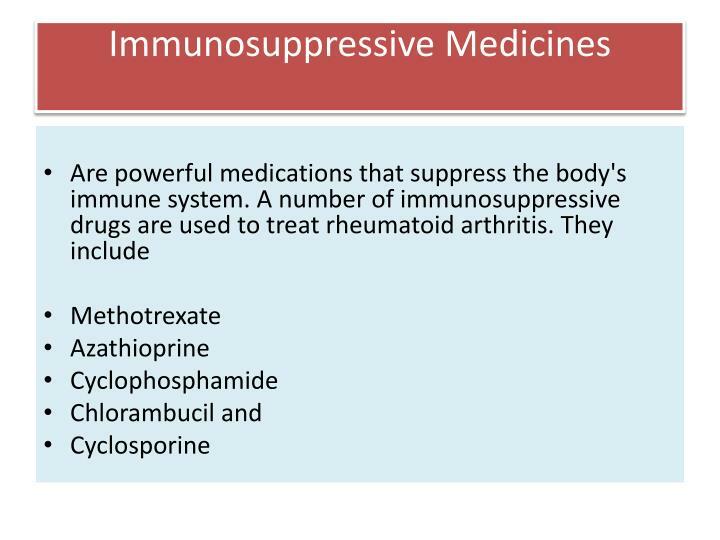 Medications can be given orally or injected directly into tissues and joints. 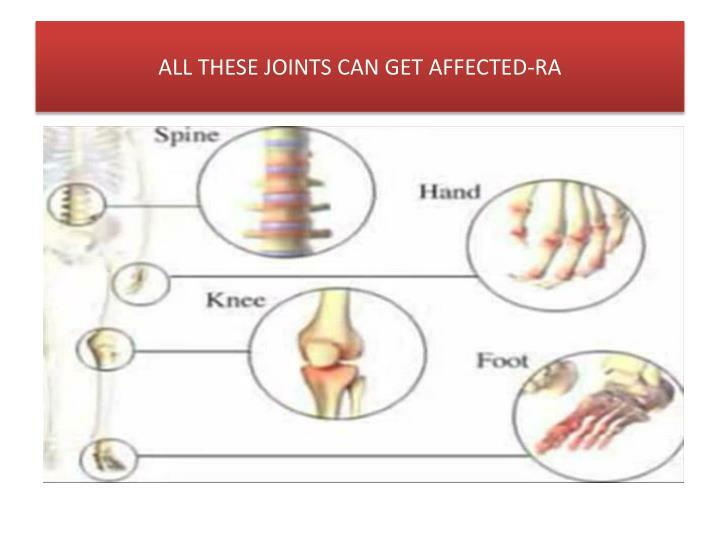 They are more potent than NSAIDs in reducing inflammation and in restoring joint mobility and function. 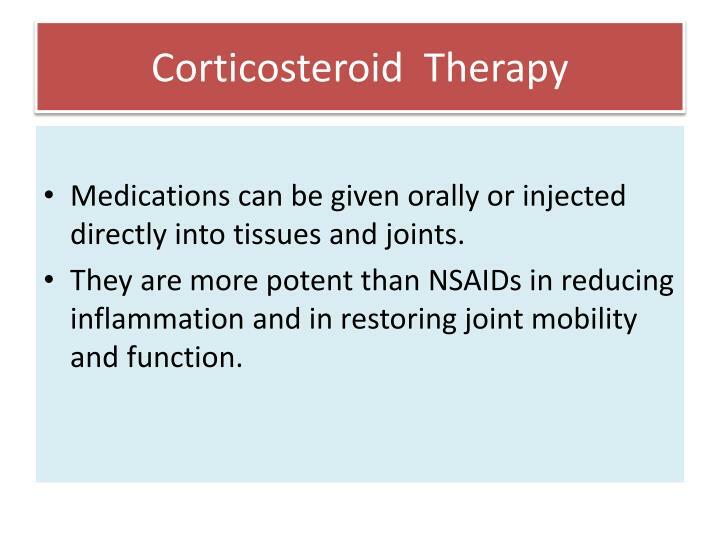 Corticosteroids are useful for short periods during severe flares of disease activity or when the disease is not responding to NSAIDs. 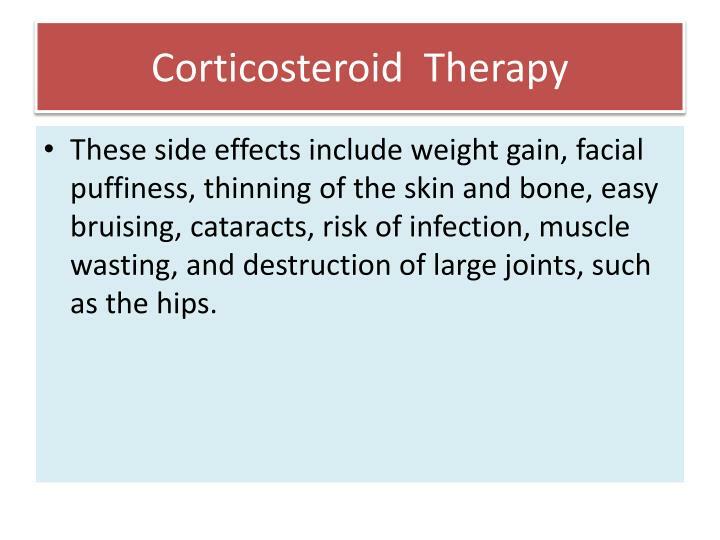 However, corticosteroids can have serious side effects, especially when given in high doses for long periods of time . 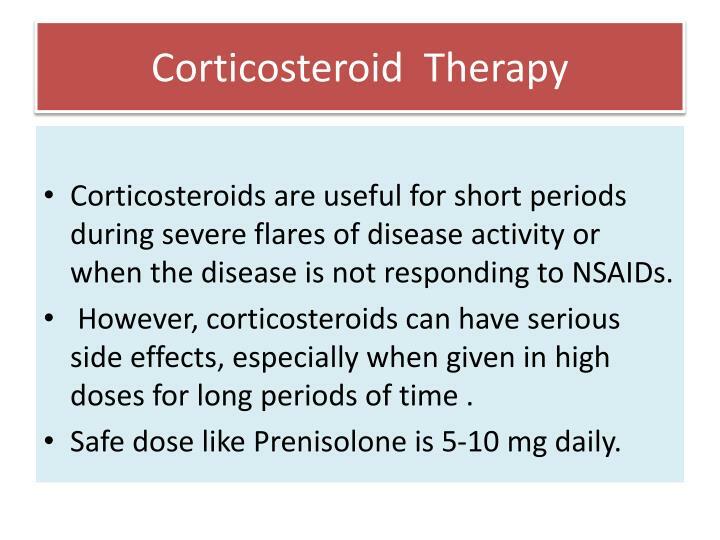 Safe dose like Prenisolone is 5-10 mg daily. 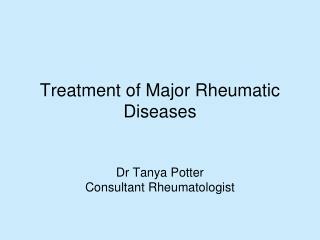 These side effects include weight gain, facial puffiness, thinning of the skin and bone, easy bruising, cataracts, risk of infection, muscle wasting, and destruction of large joints, such as the hips. 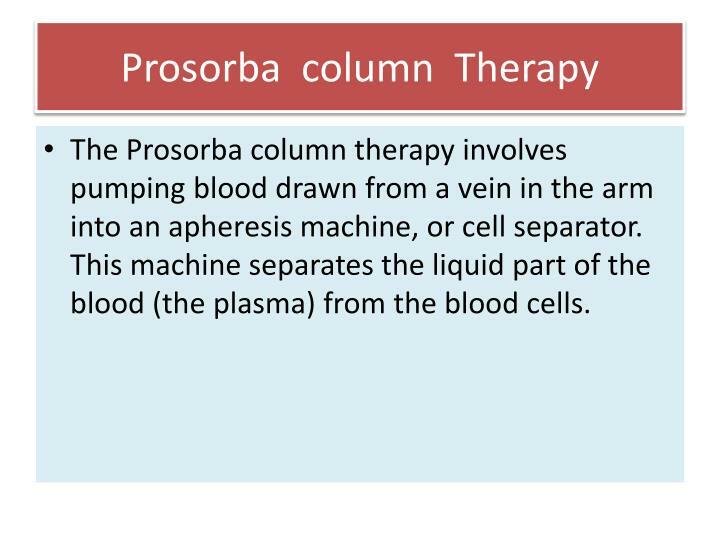 The Prosorba column therapy involves pumping blood drawn from a vein in the arm into an apheresis machine, or cell separator. This machine separates the liquid part of the blood (the plasma) from the blood cells. 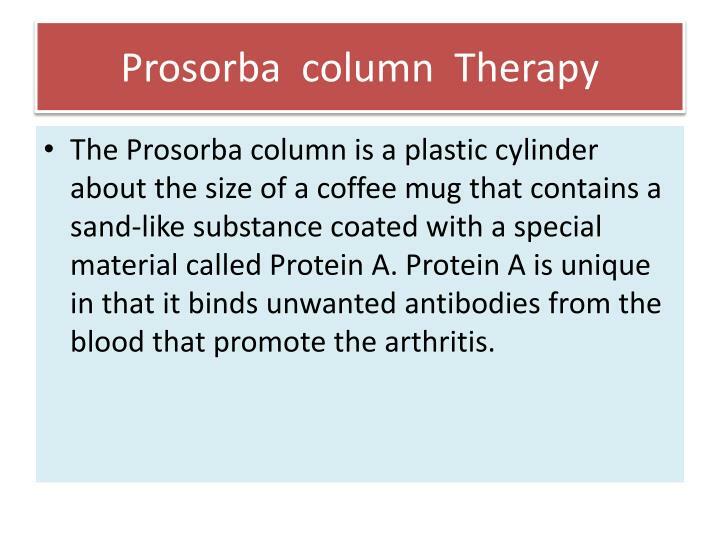 The Prosorba column is a plastic cylinder about the size of a coffee mug that contains a sand-like substance coated with a special material called Protein A. 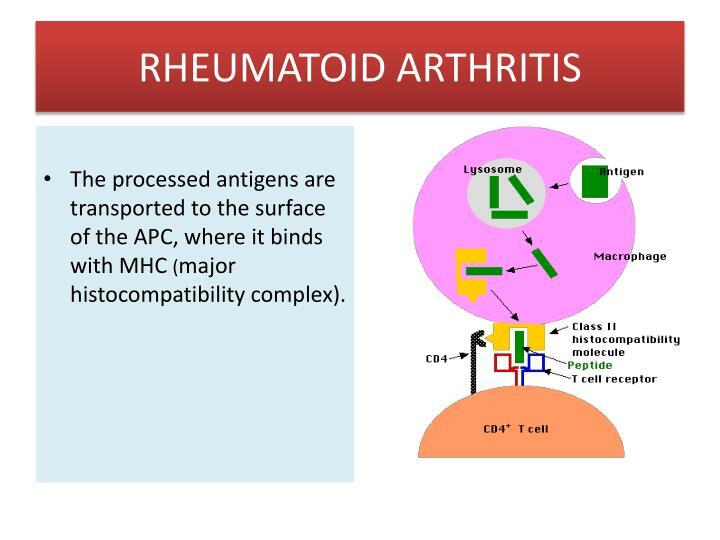 Protein A is unique in that it binds unwanted antibodies from the blood that promote the arthritis. 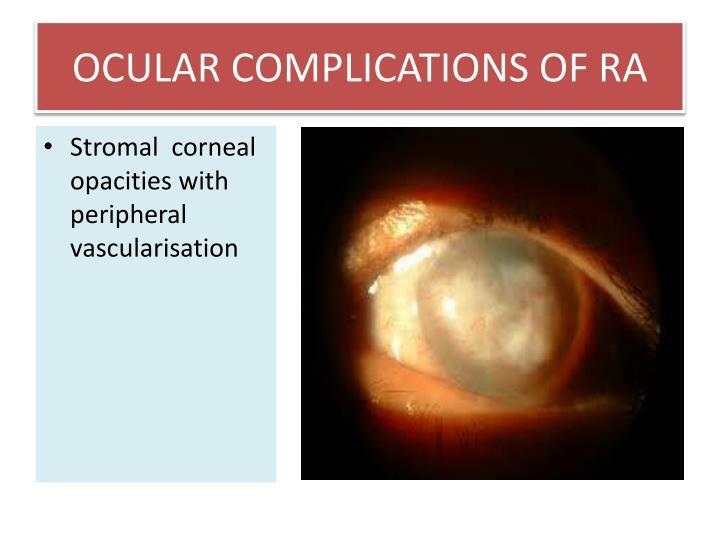 The exact role of this treatment is being evaluated by doctors, and it is not commonly used currently. 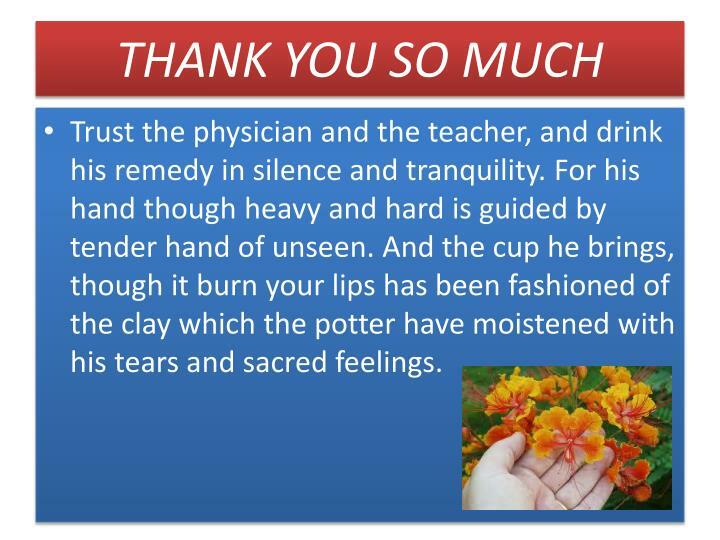 Trust the physician and the teacher, and drink his remedy in silence and tranquility. For his hand though heavy and hard is guided by tender hand of unseen. And the cup he brings, though it burn your lips has been fashioned of the clay which the potter have moistened with his tears and sacred feelings. 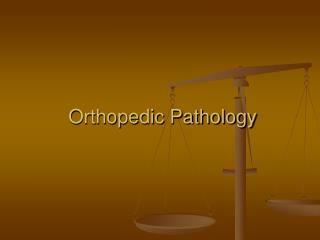 Orthopedic Pathology -. 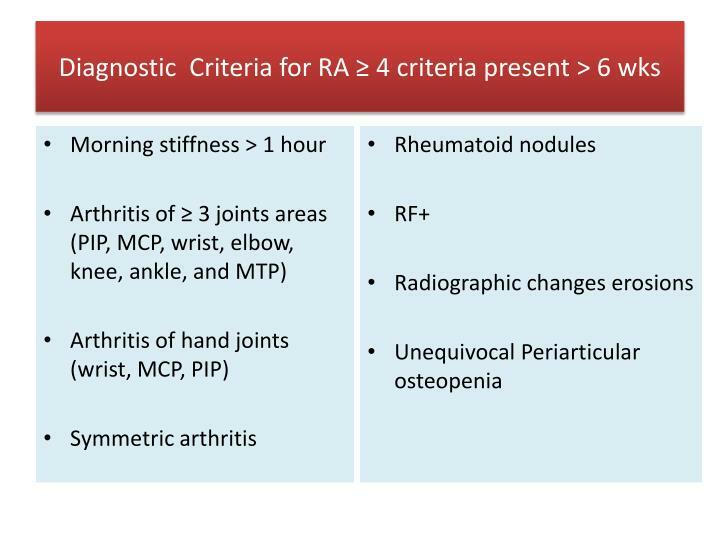 arthritis. 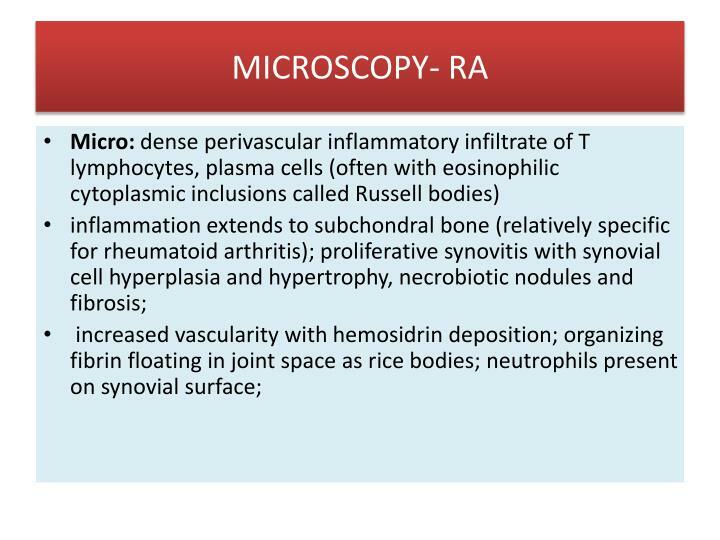 osteoarthritis infectious rheumatoid. dislocations. subluxation partial luxation complete. bucket handle tear. joint mice. knee joint. osteomalacia osteomyelitis. 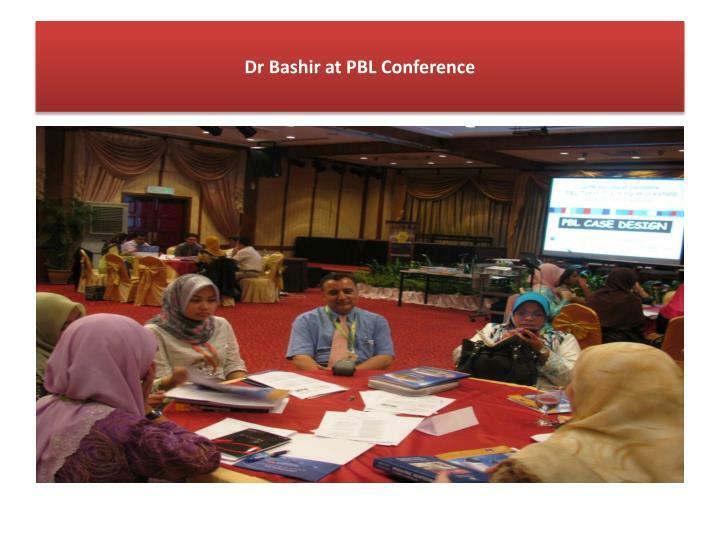 osteoporosis primary secondary. 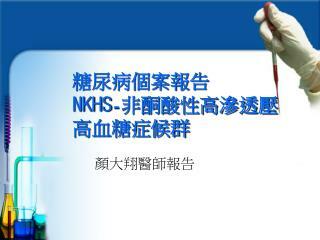 糖尿病個案報告 NKHS - 非酮酸性高滲透壓 高血糖症候群 -. 顏大翔醫師報告. 個案介紹. 姓名 : 林 o 鶯 性別 : 女 年齡 :72 歲 職業 : 小學老師退休 教育程度 : 專科 糖尿病史 : 無.